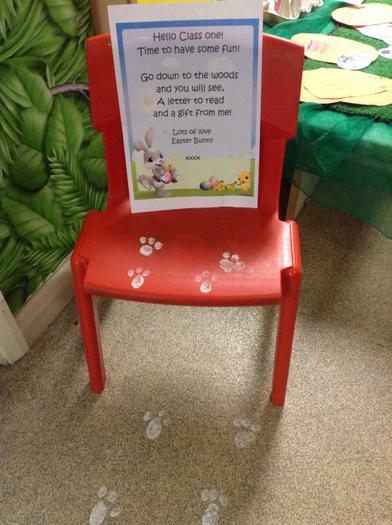 The Easter Bunny had left us a letter and baskets to collect the eggs he had hidden in our classroom. 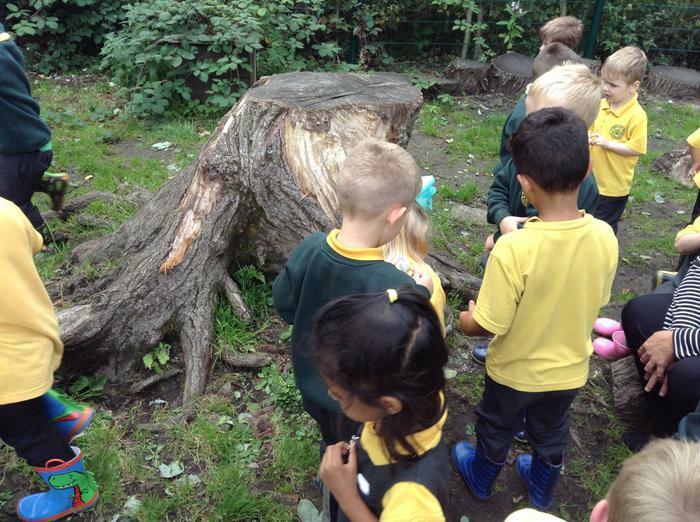 We had so much fun hunting for them! 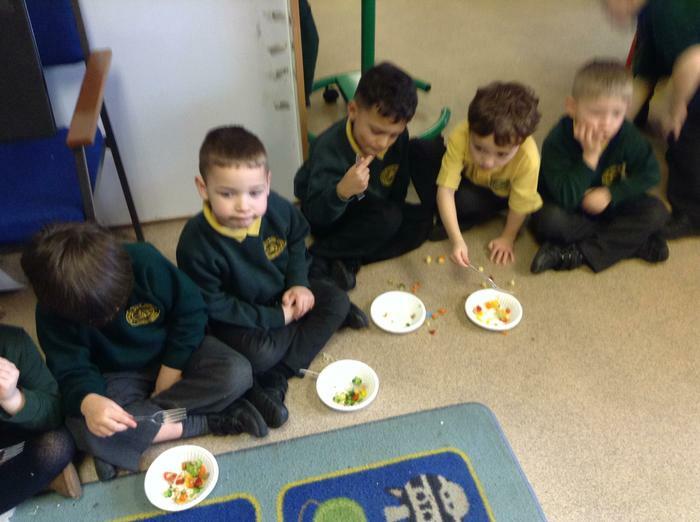 We counted out how many of each colour we had, and then added the totals together. 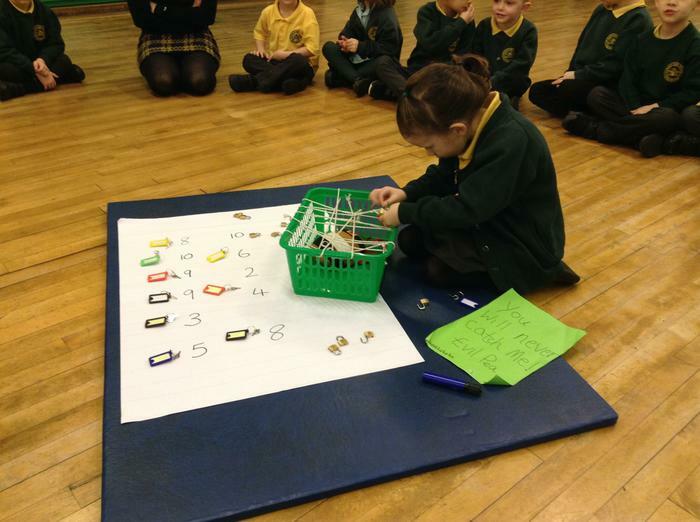 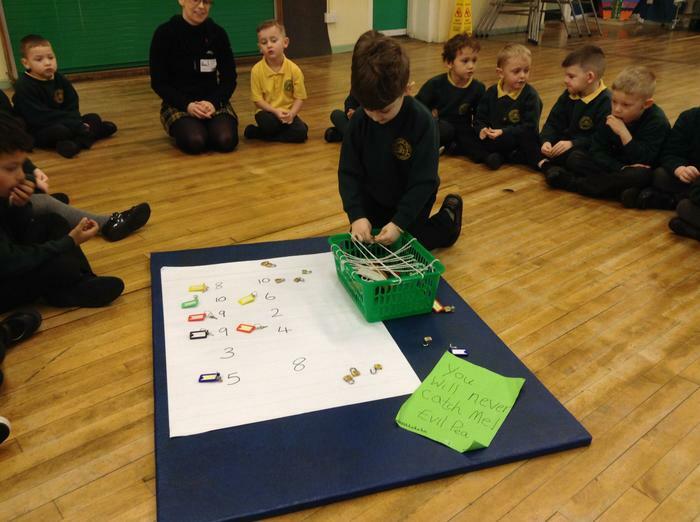 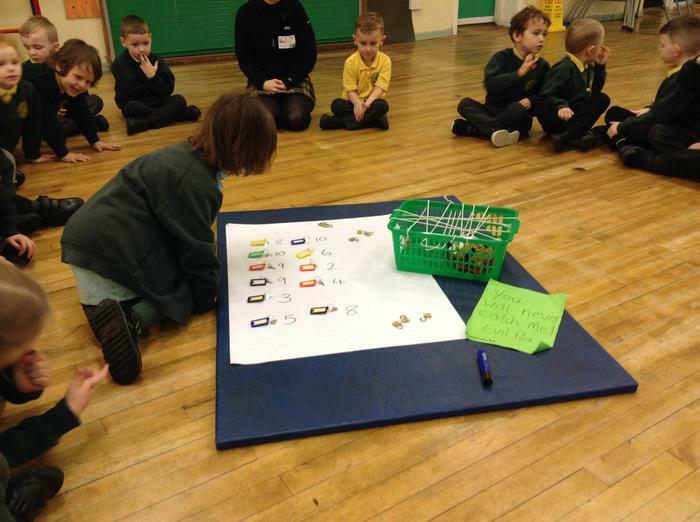 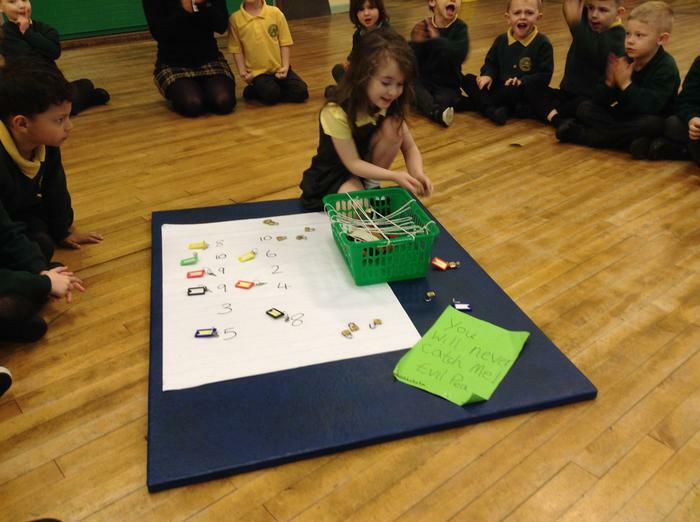 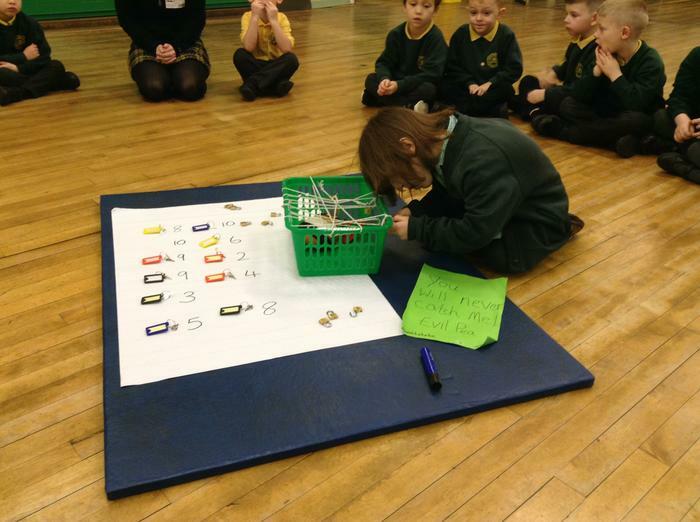 We then worked out how many we could have each, by sharing them equally. 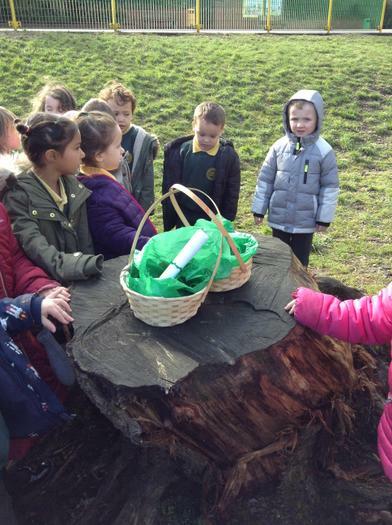 Thank-you Easter Bunny! 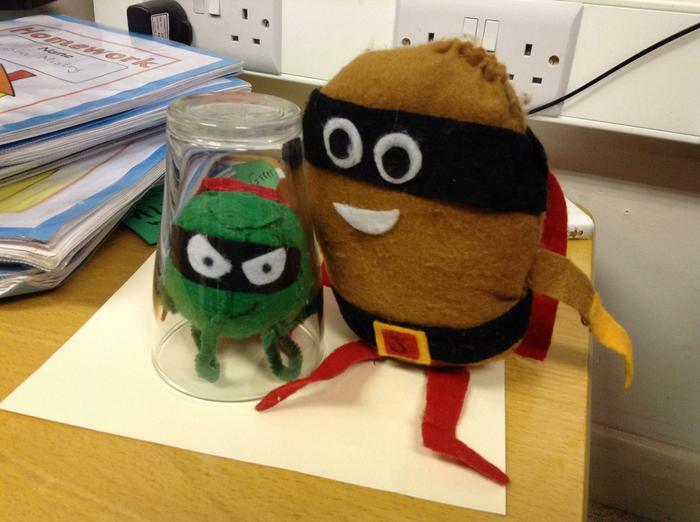 Supertato and the Evil Pea. 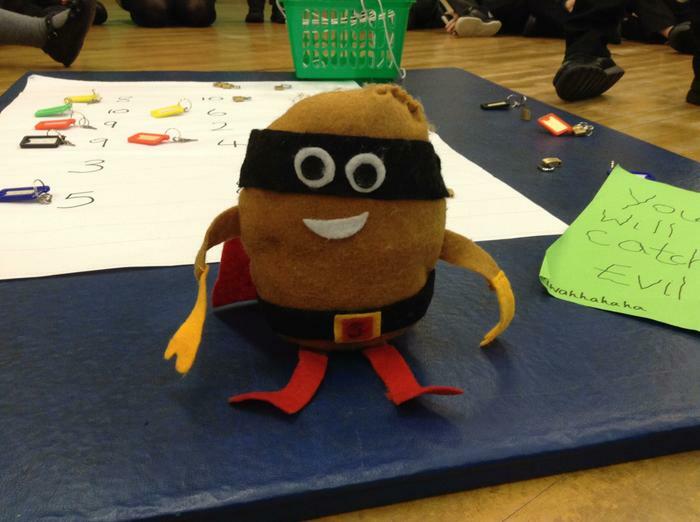 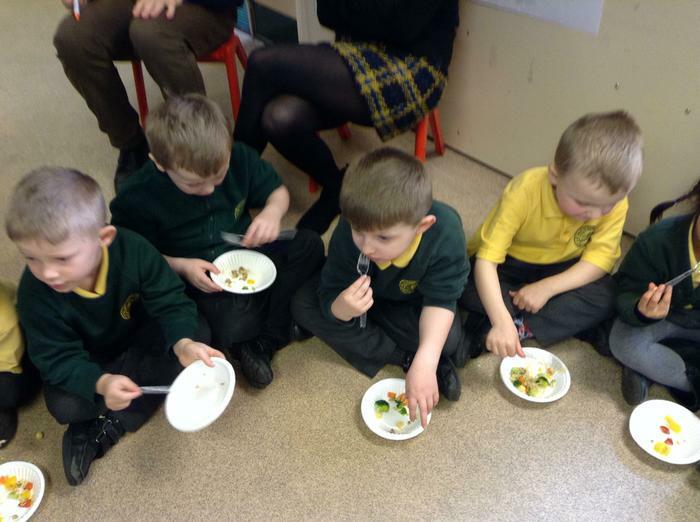 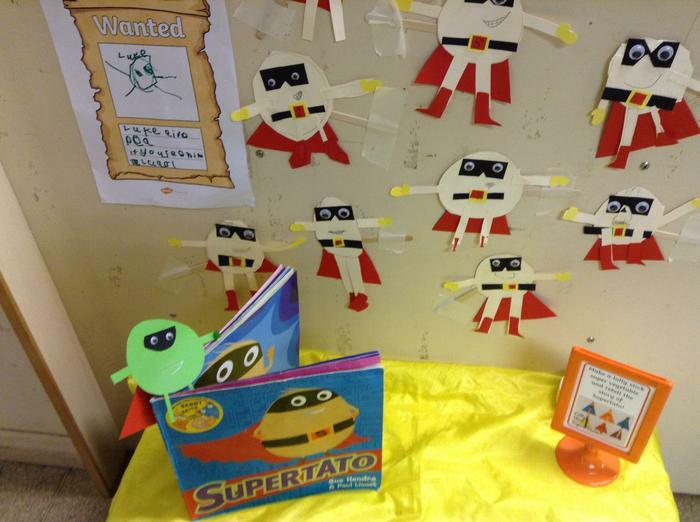 We have loved our topic on superheroes and especially enjoyed the story of Supertato. 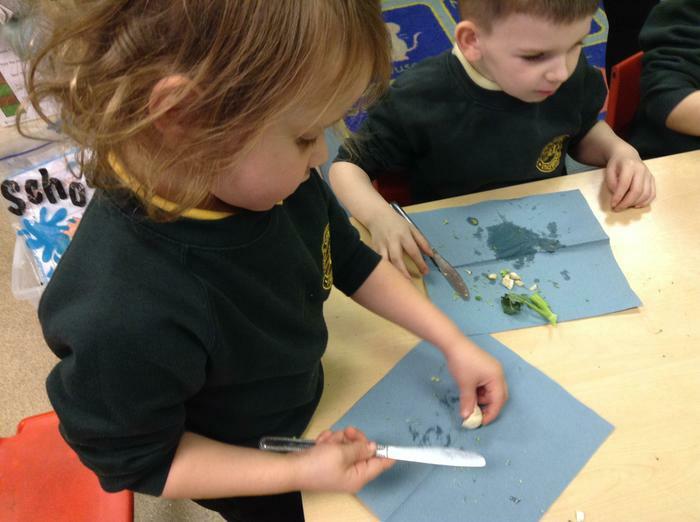 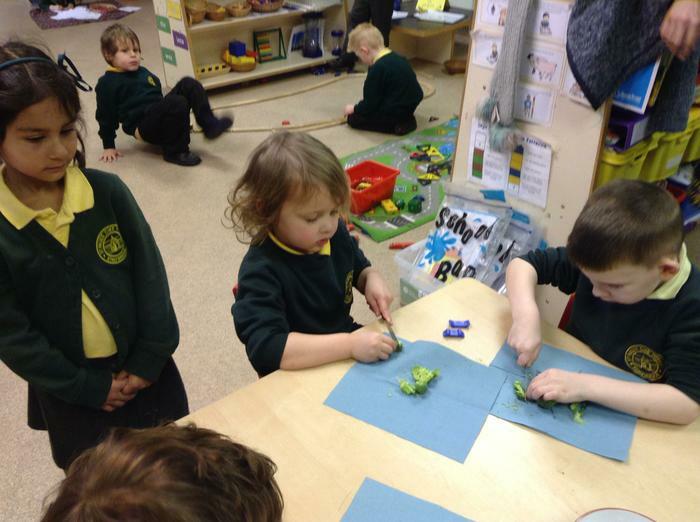 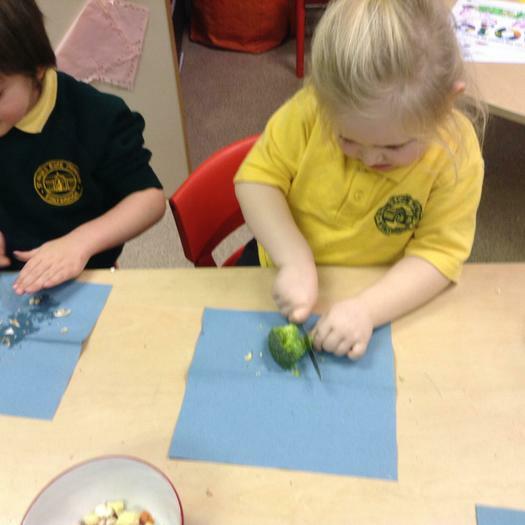 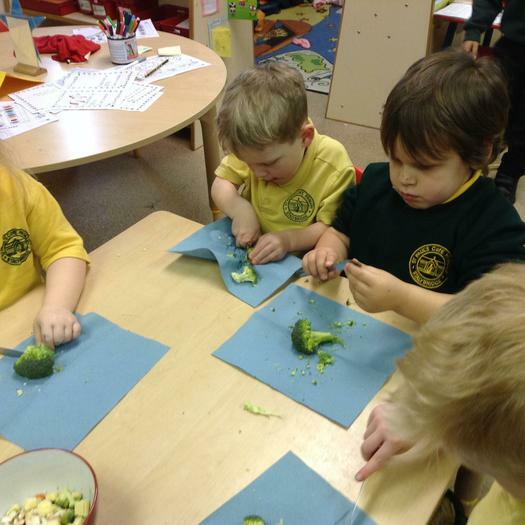 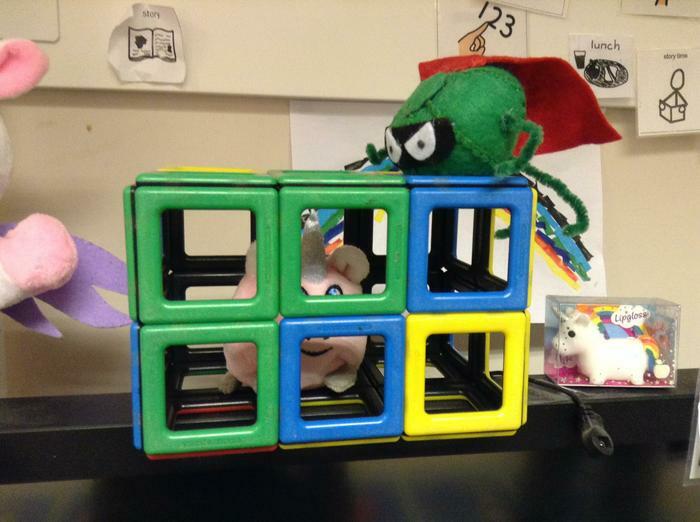 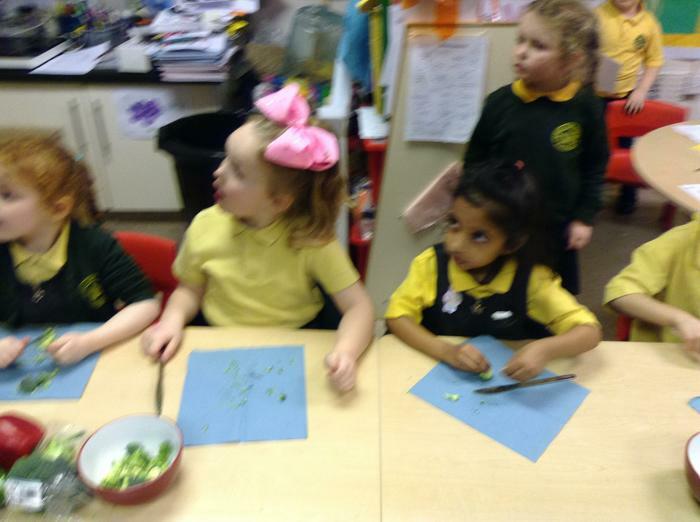 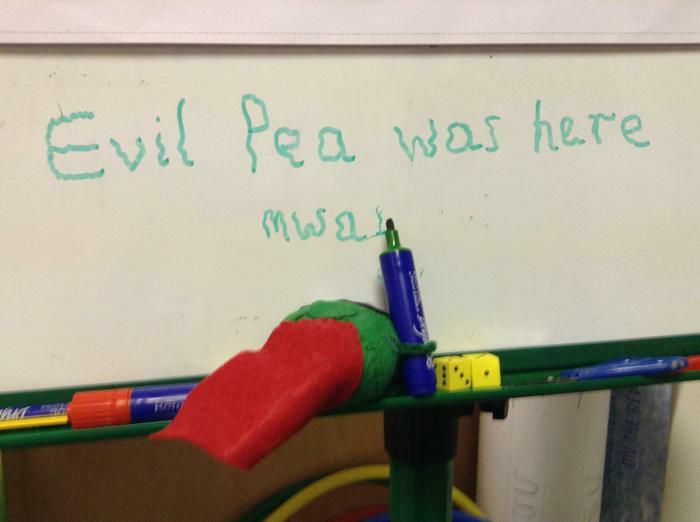 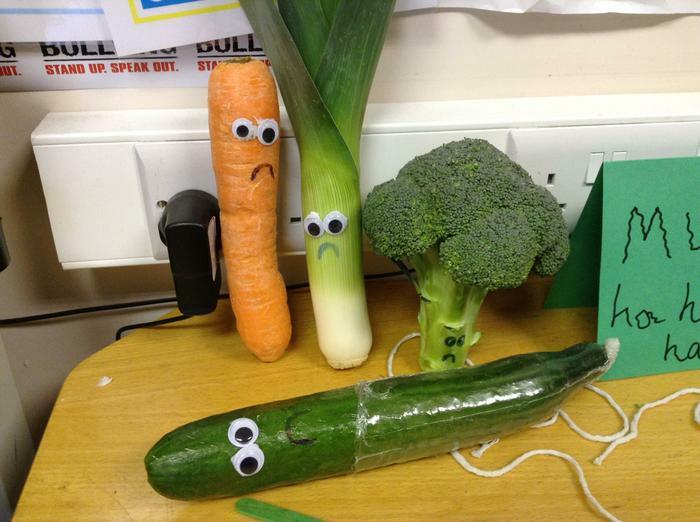 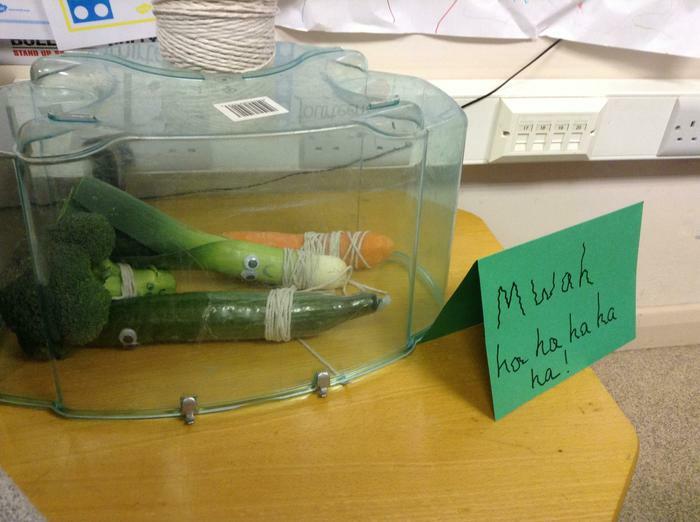 The menacing Pea got up to all kinds of mischief in our classroom. 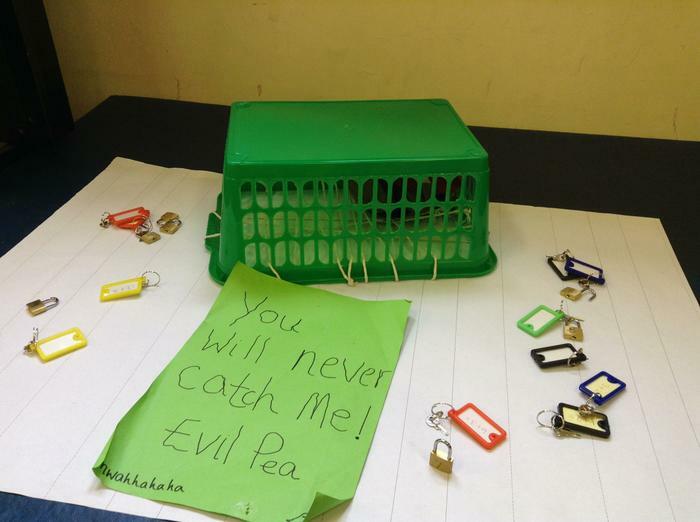 We made wanted posters, cracked codes on locks, created super veggies and talked about how to help Evil Pea change his evil ways. 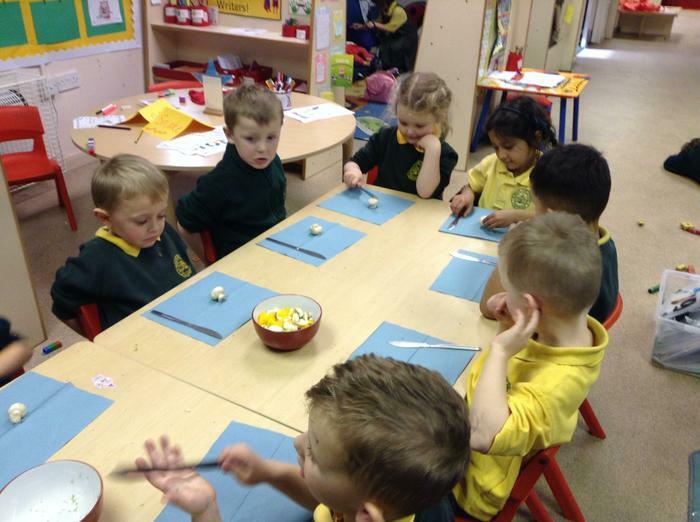 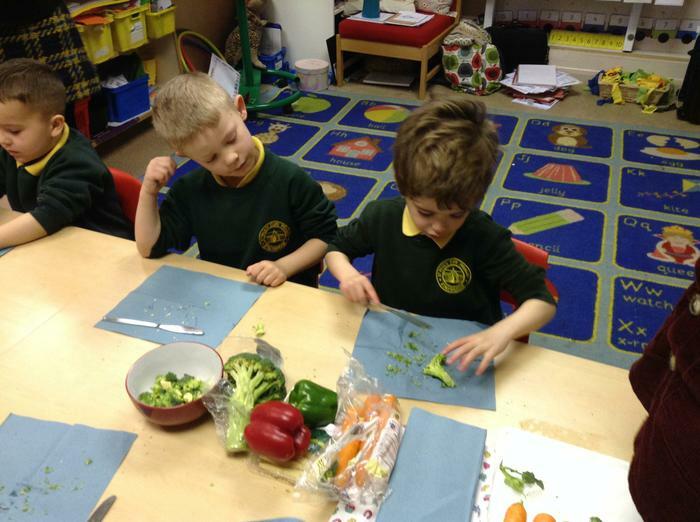 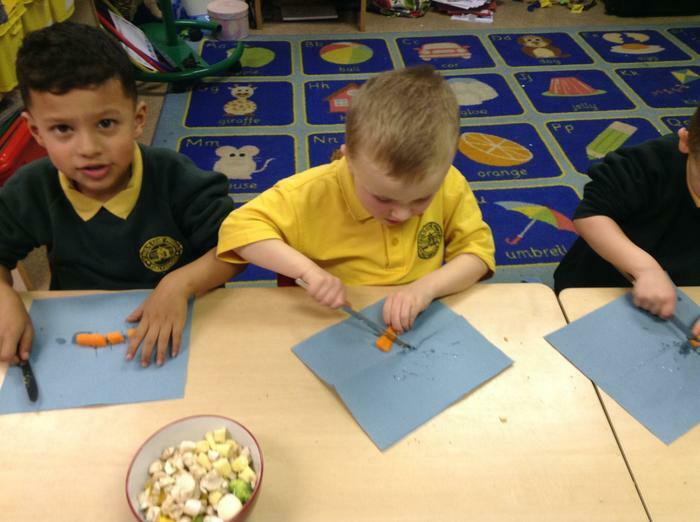 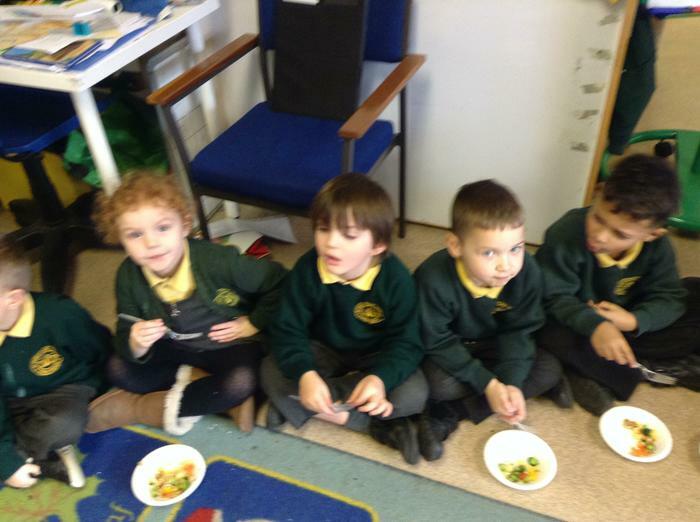 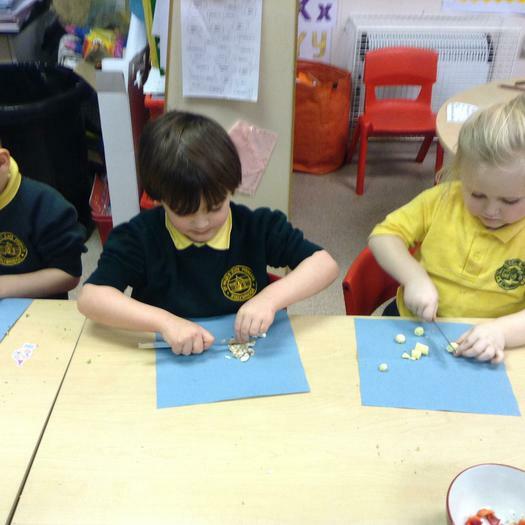 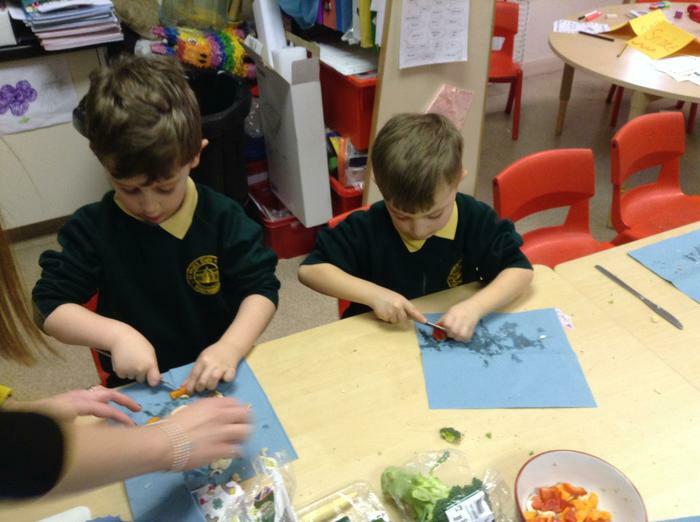 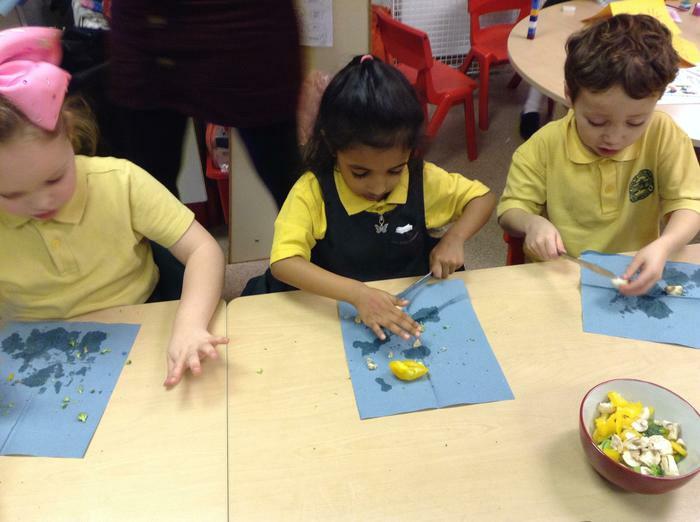 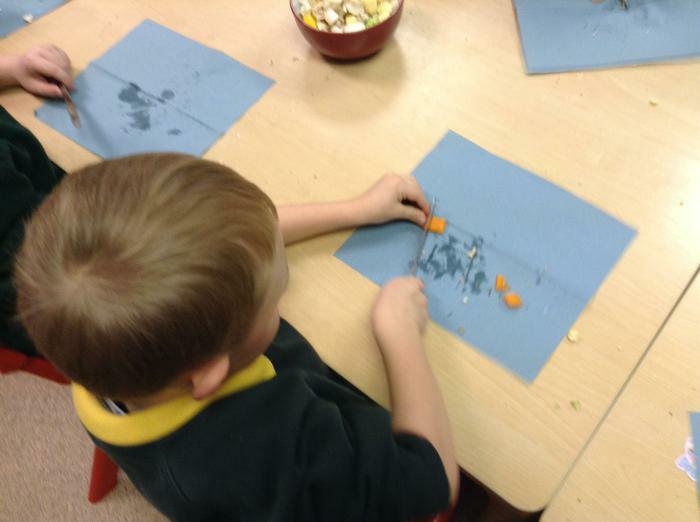 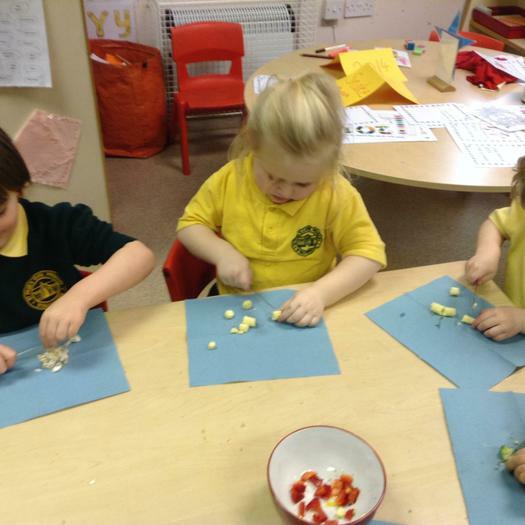 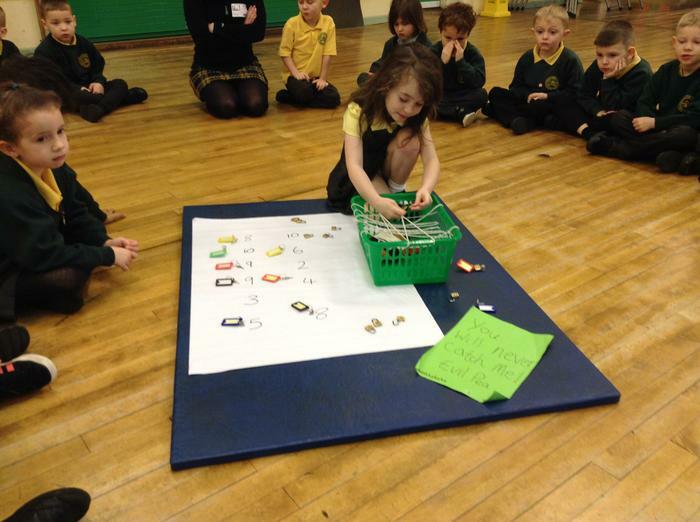 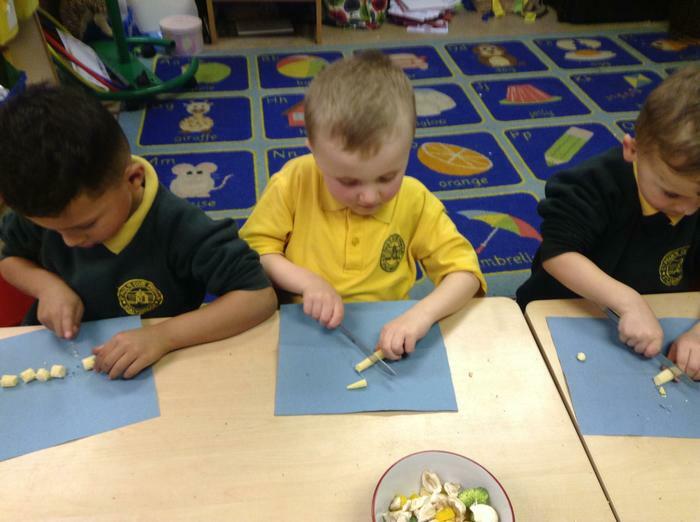 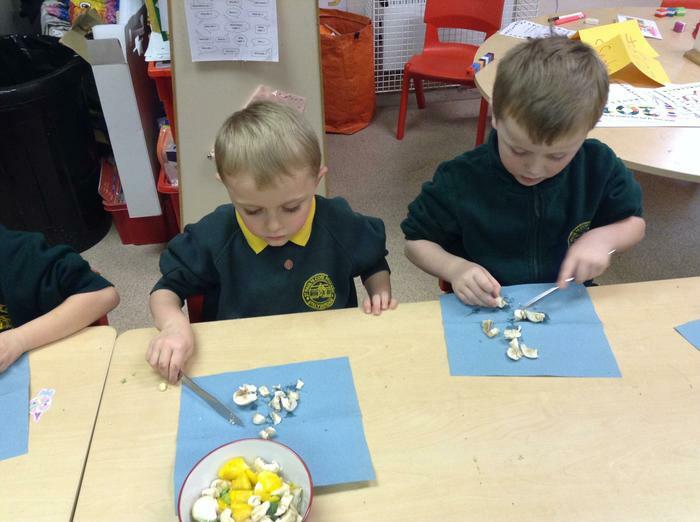 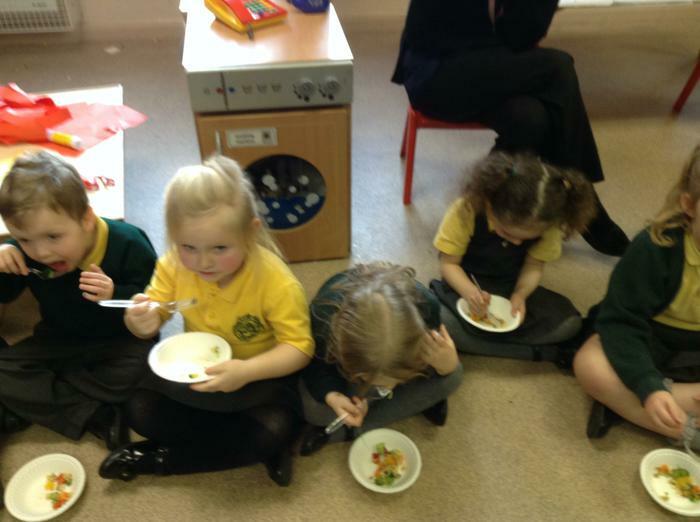 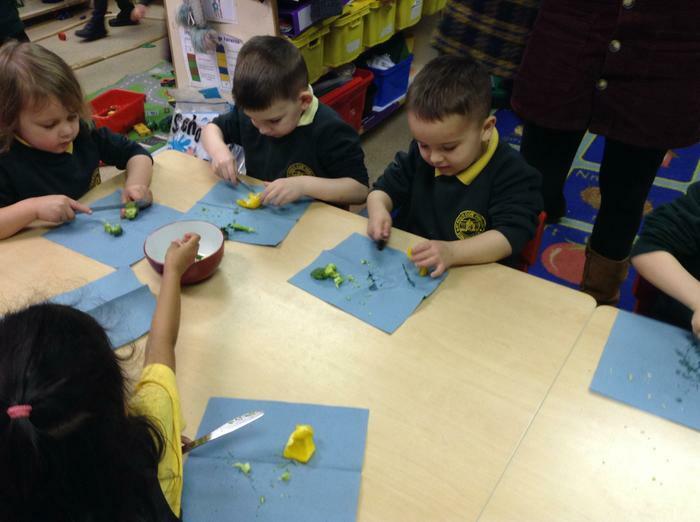 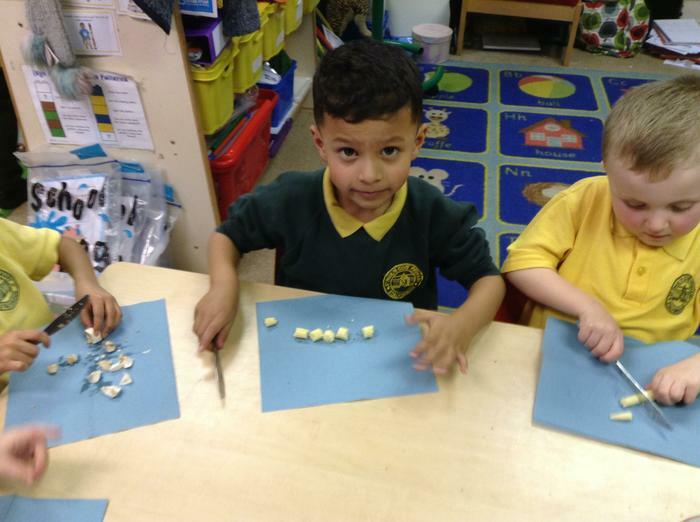 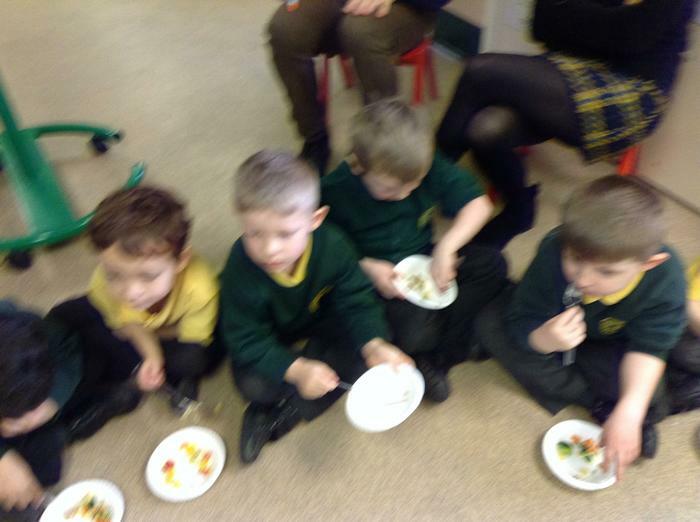 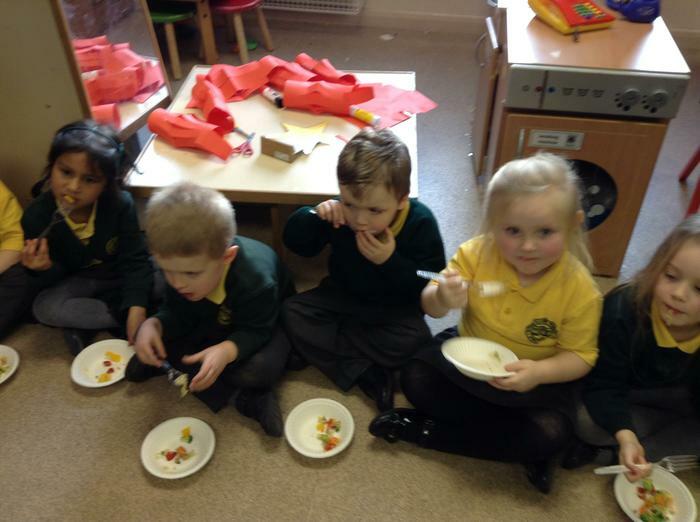 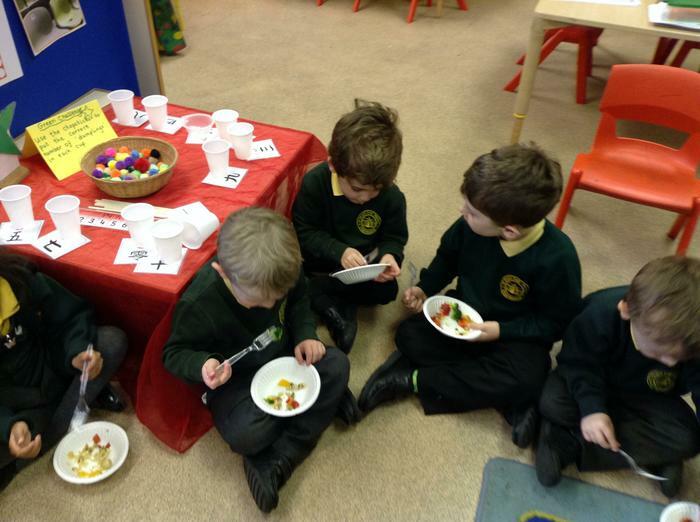 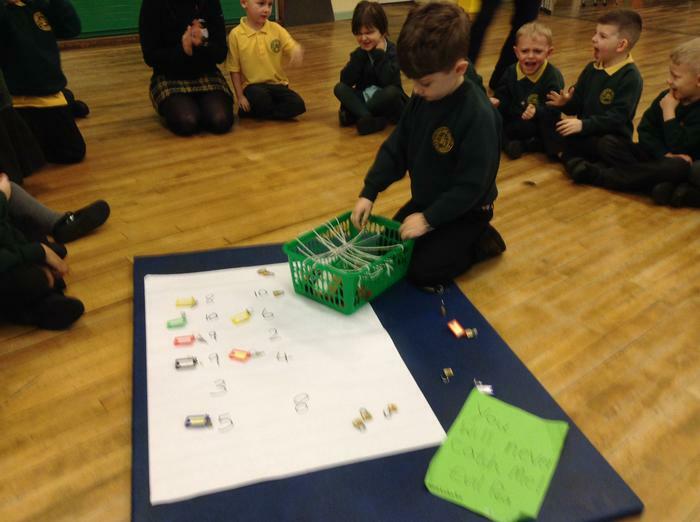 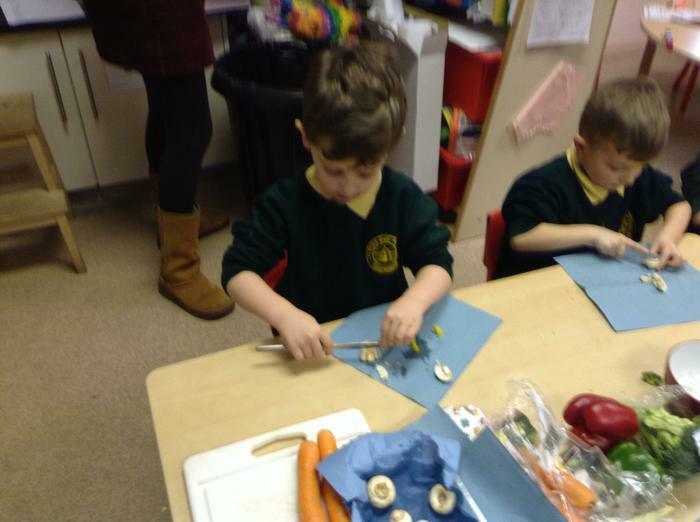 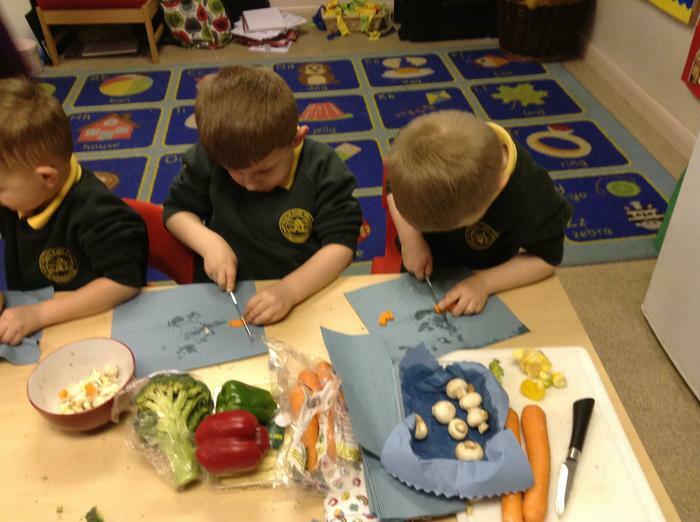 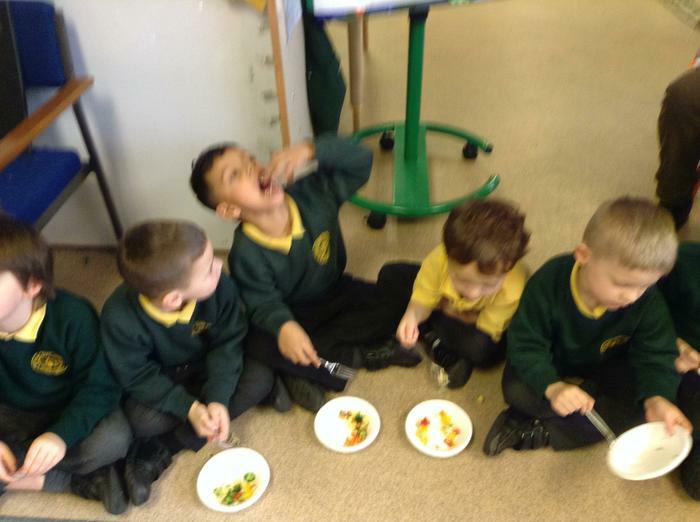 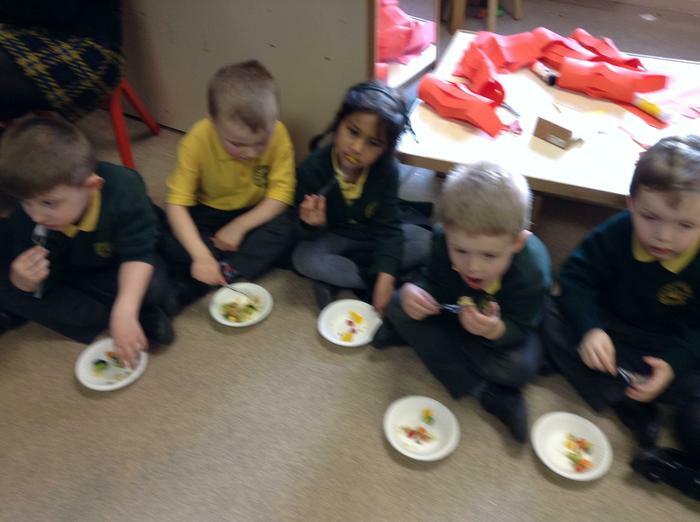 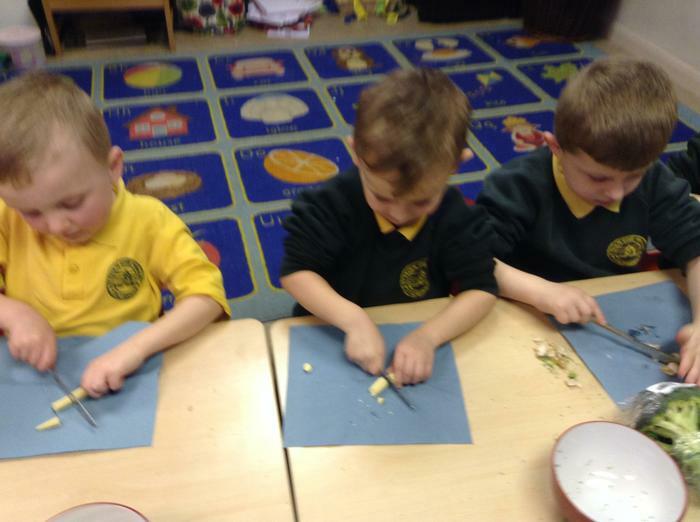 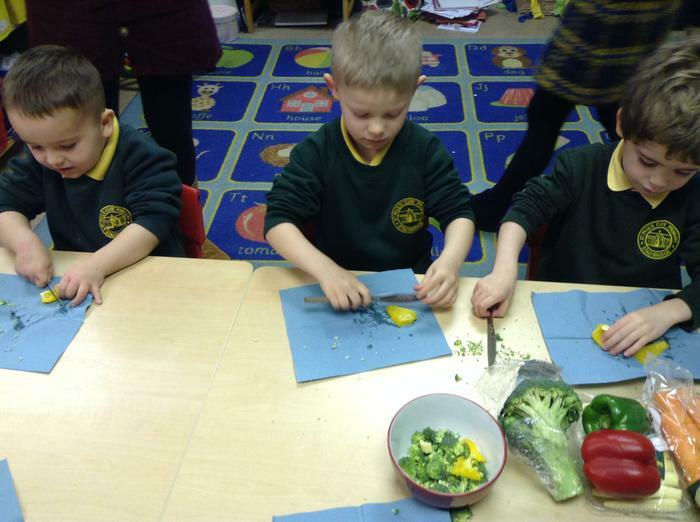 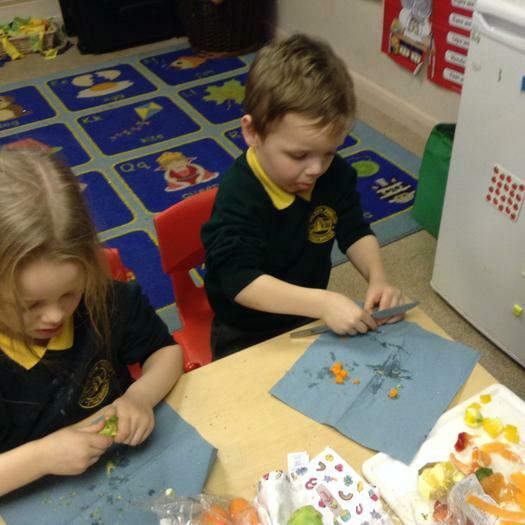 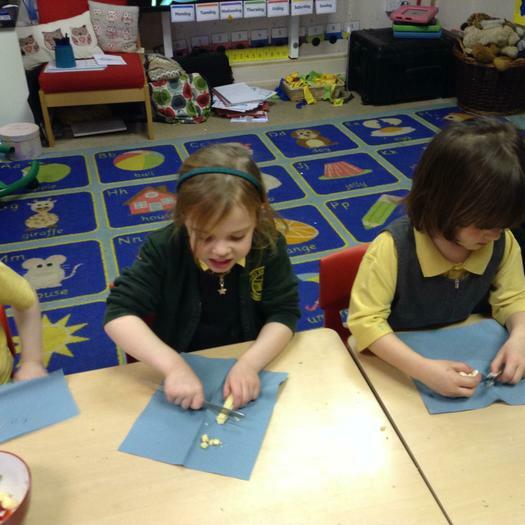 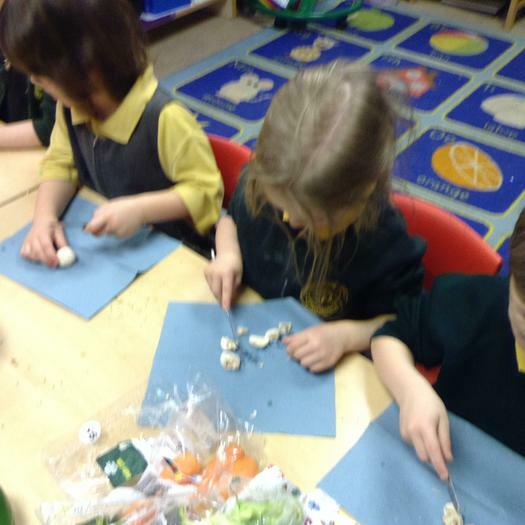 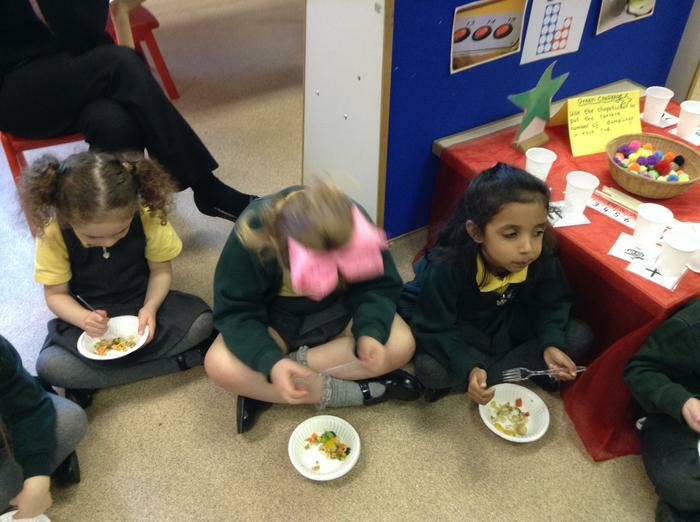 We have been doing lots of different activities this week whilst learning about Chinese new year. 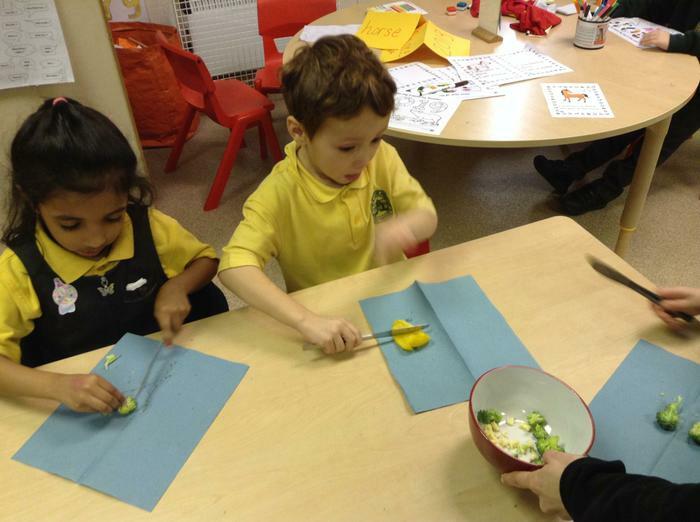 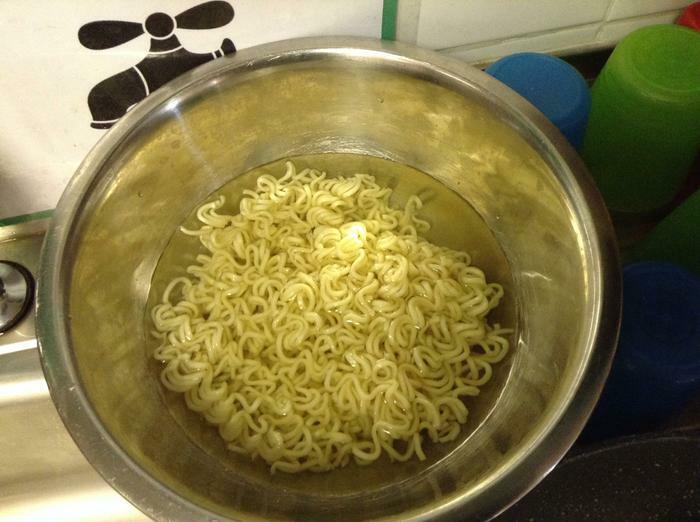 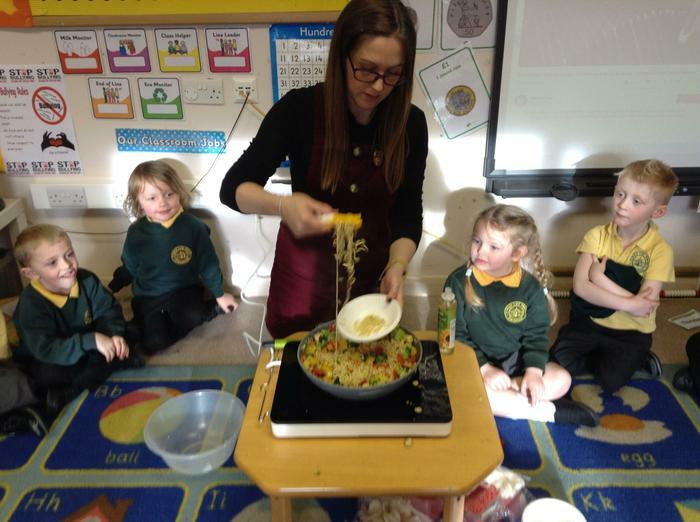 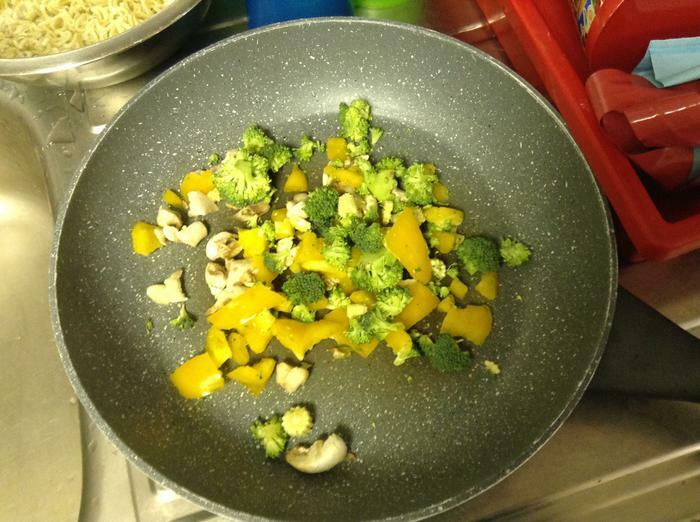 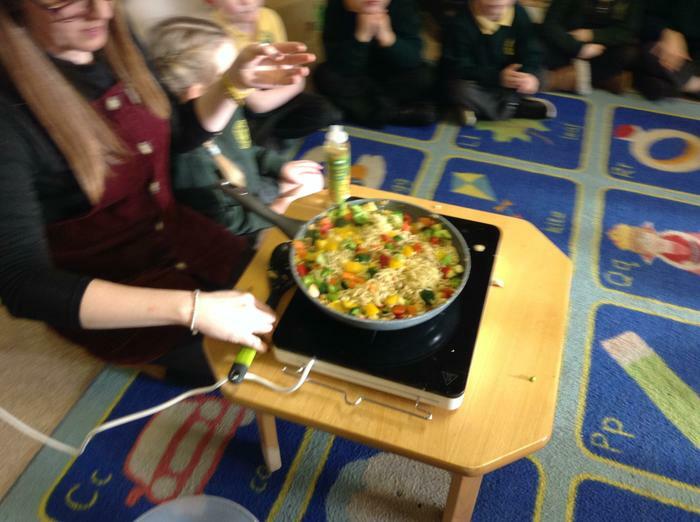 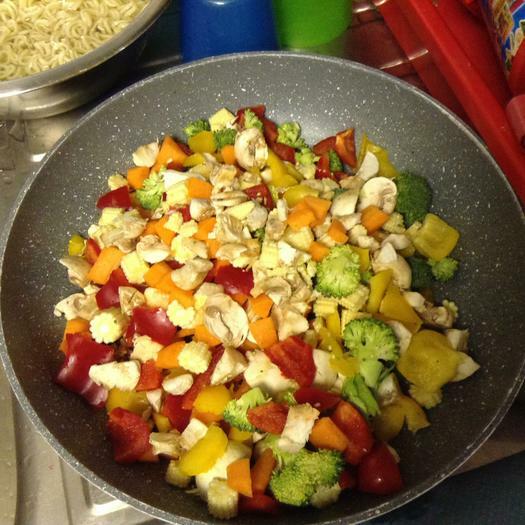 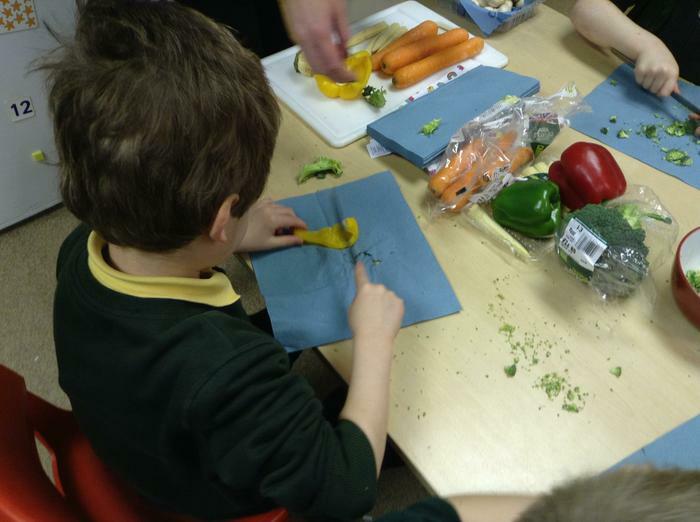 From dragon dancing and chop stick challenges, to chopping veg and eating noodles. 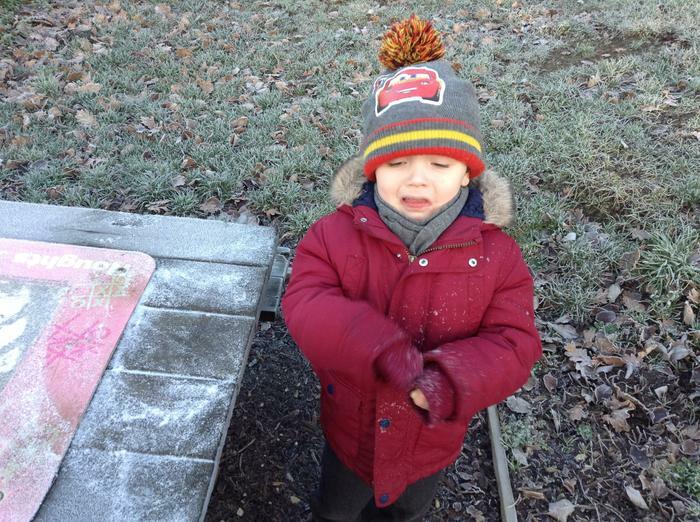 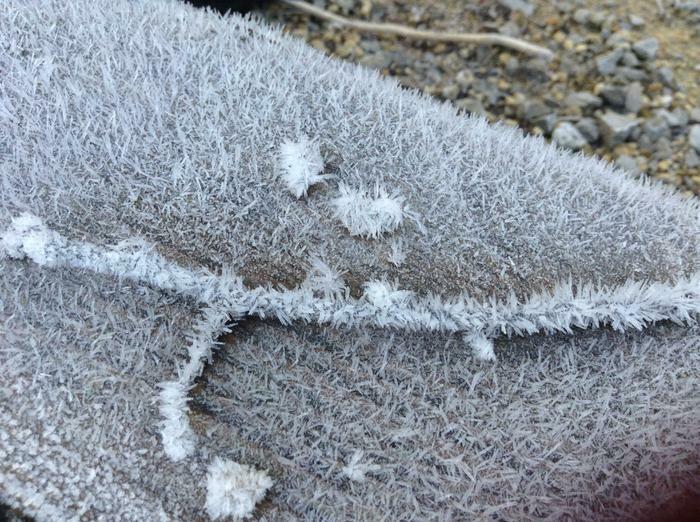 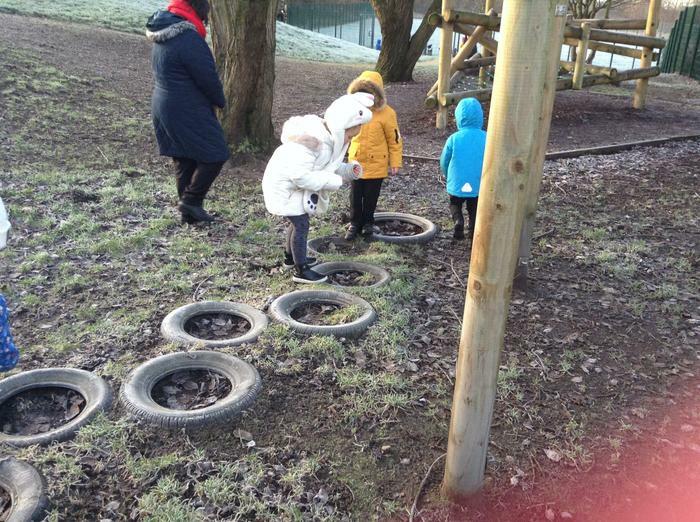 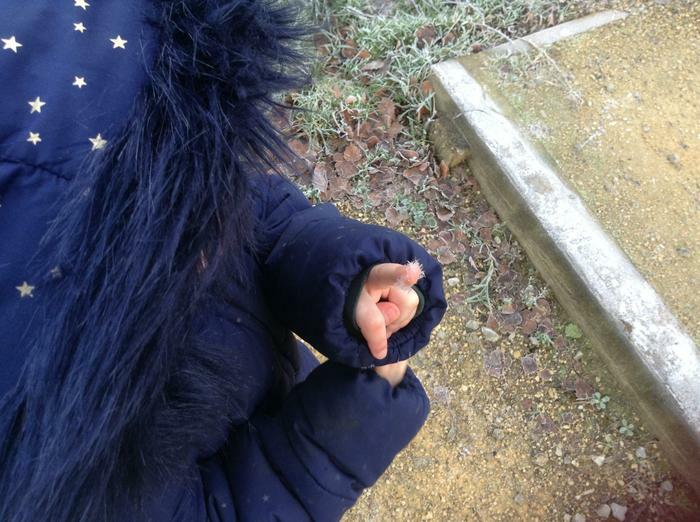 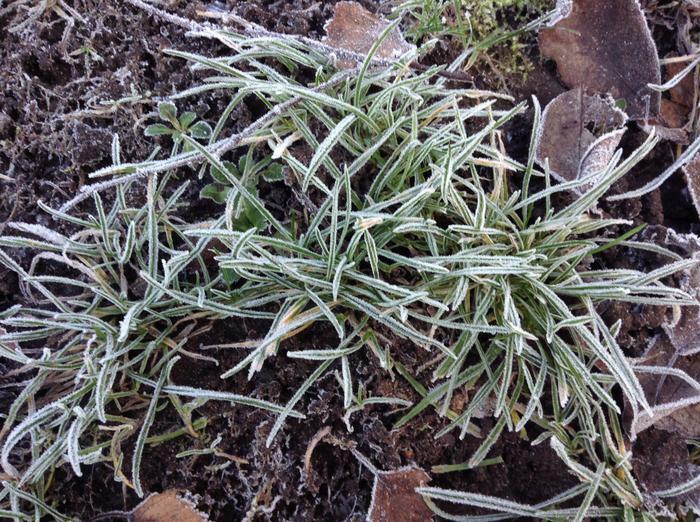 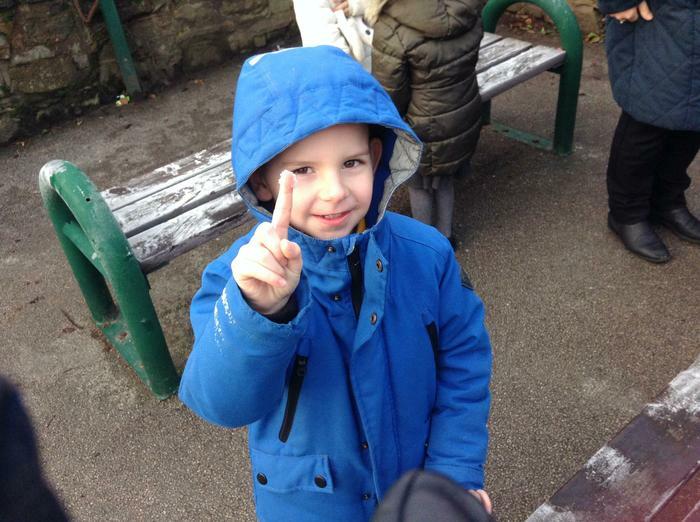 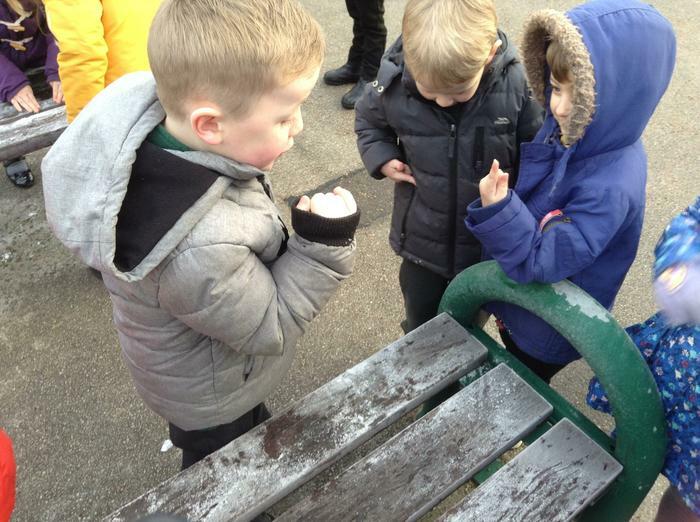 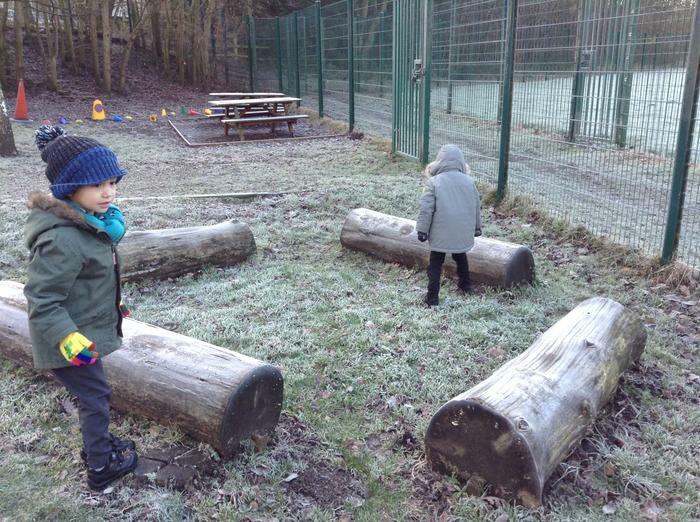 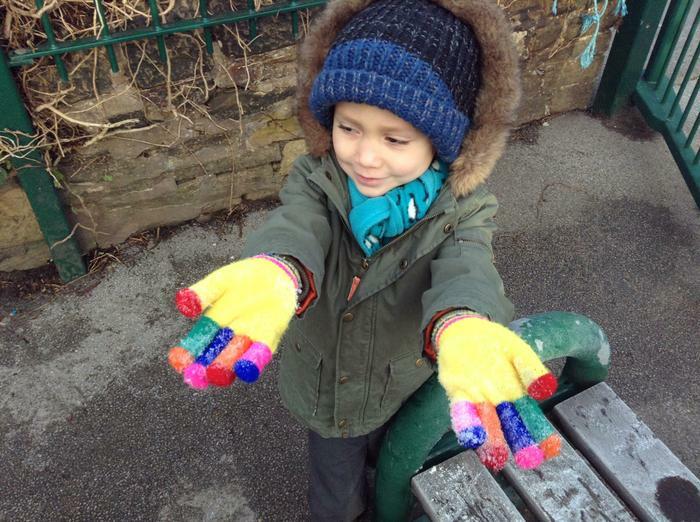 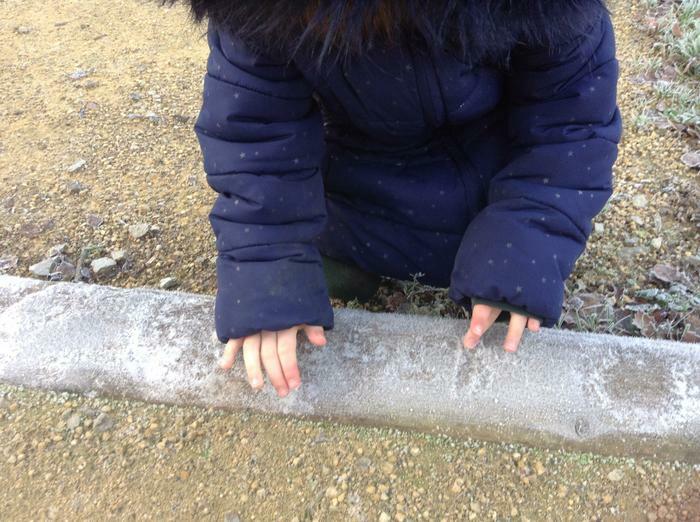 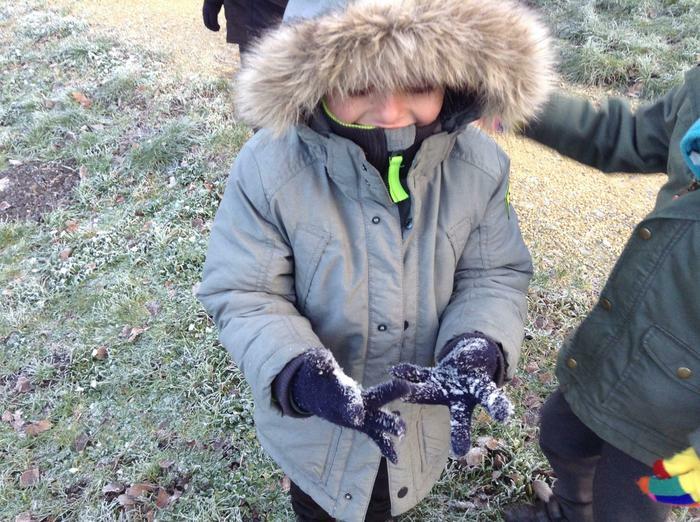 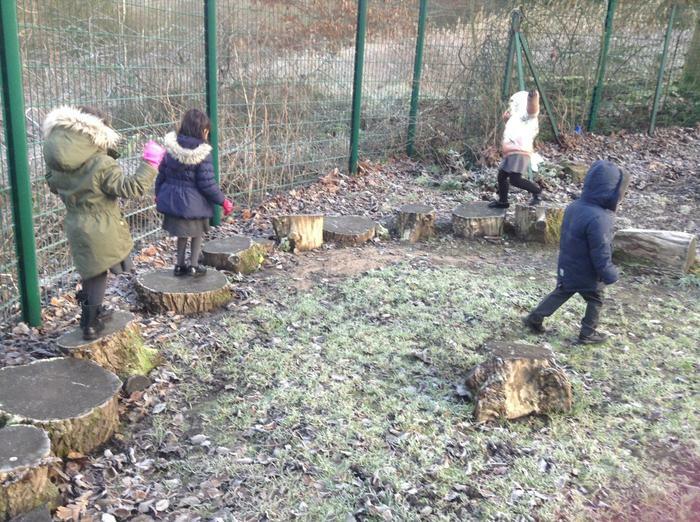 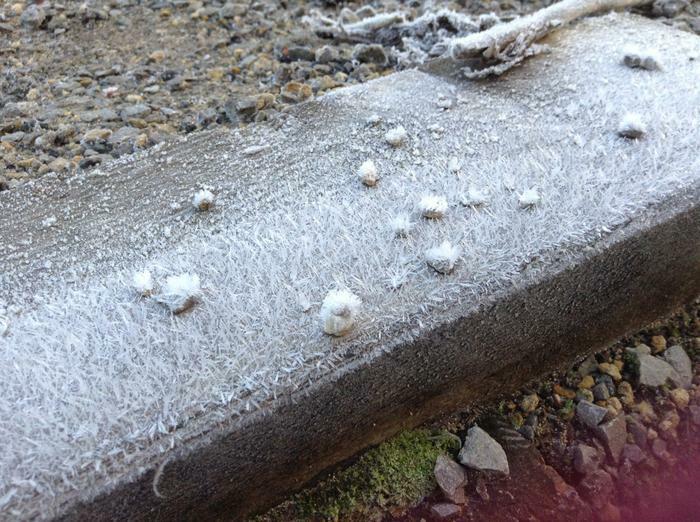 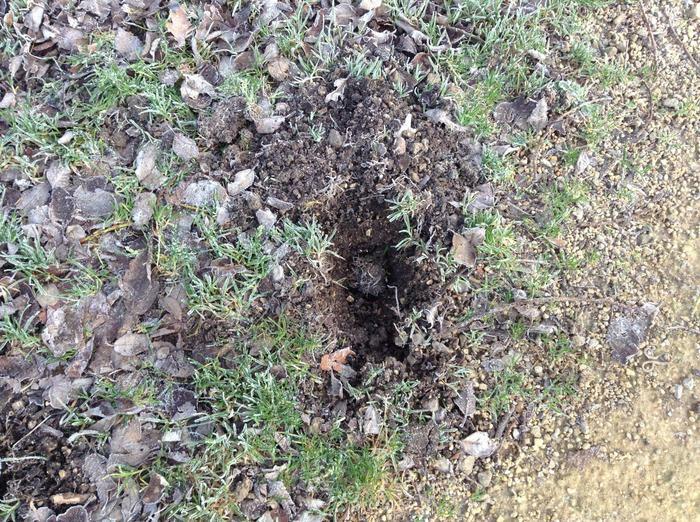 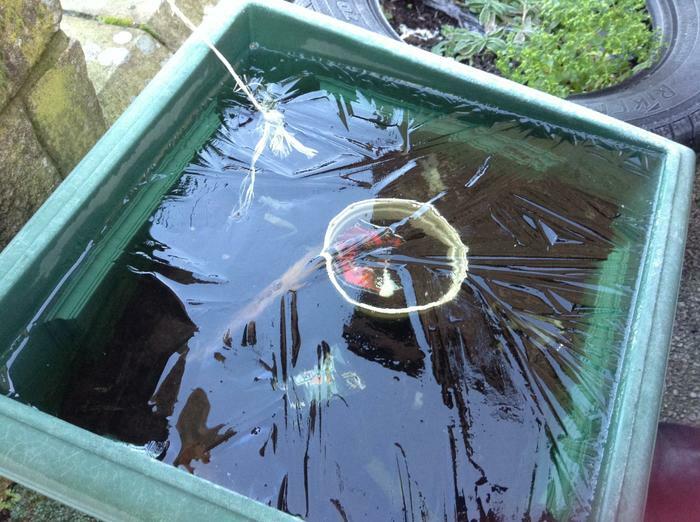 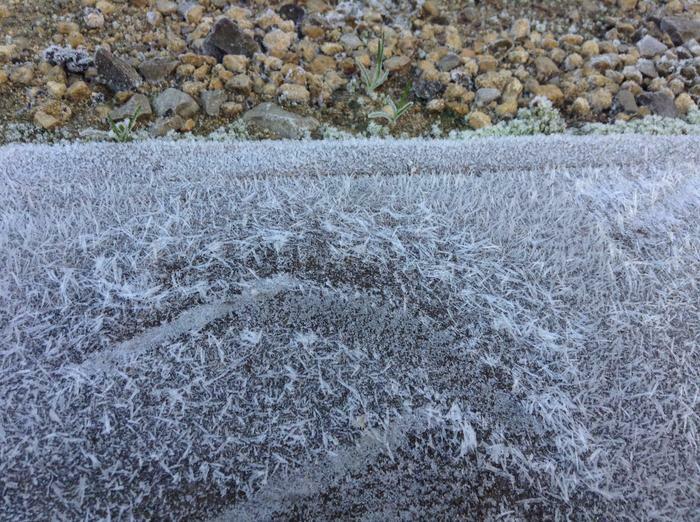 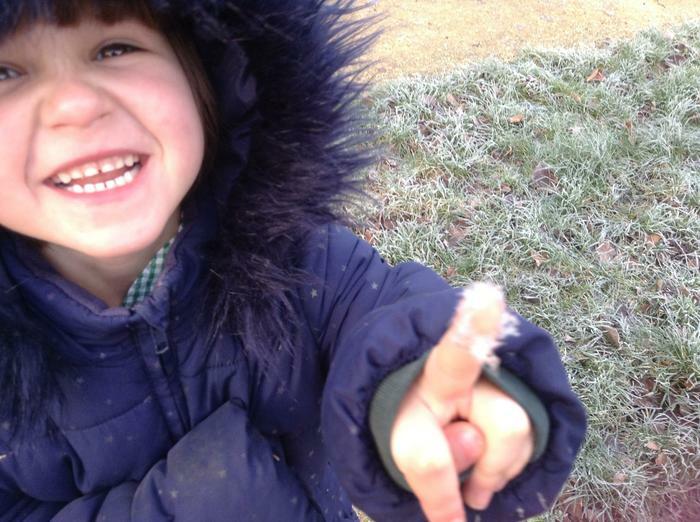 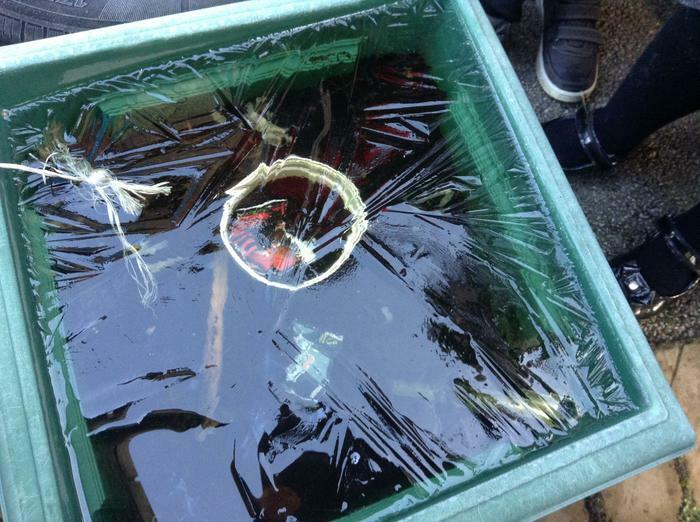 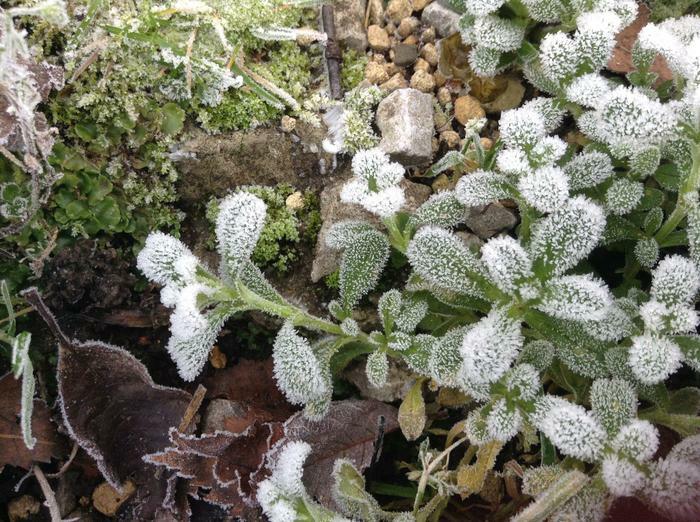 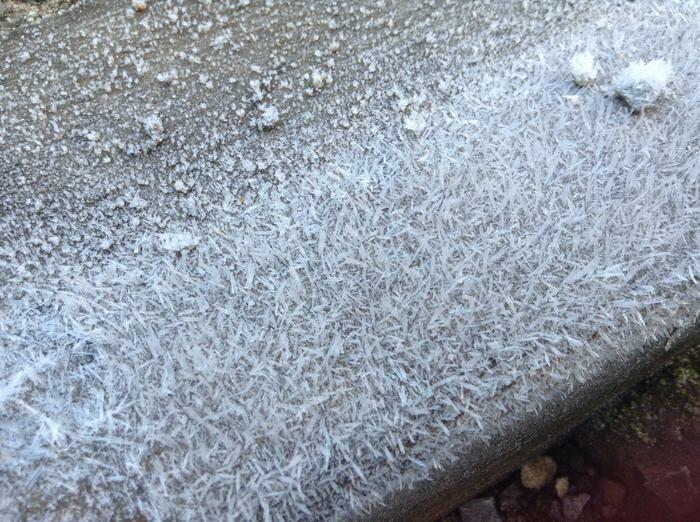 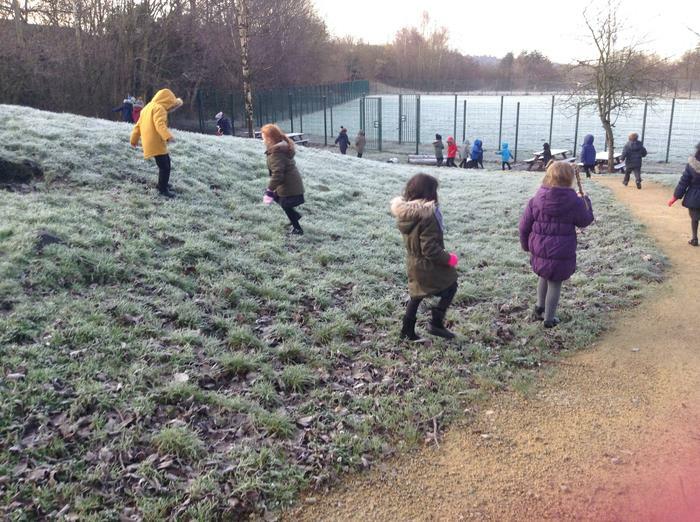 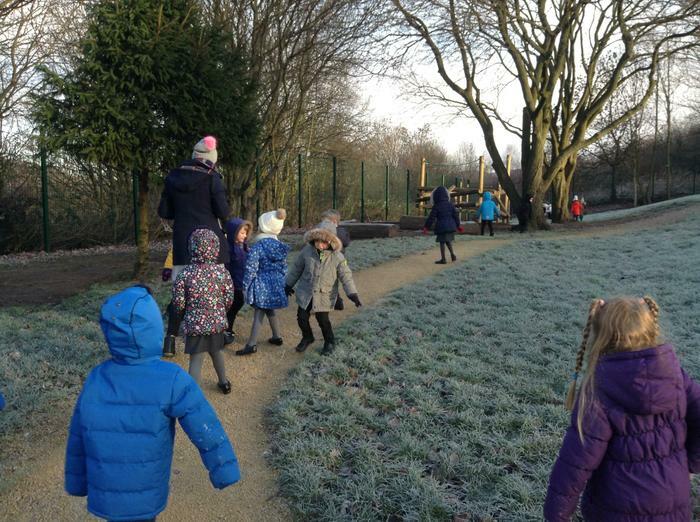 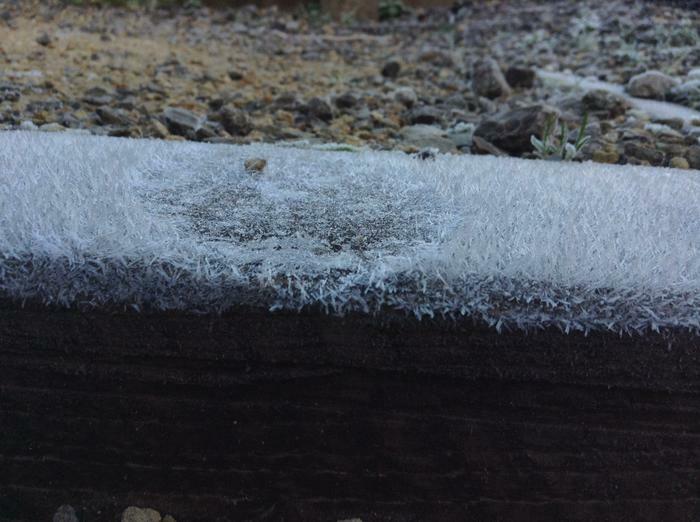 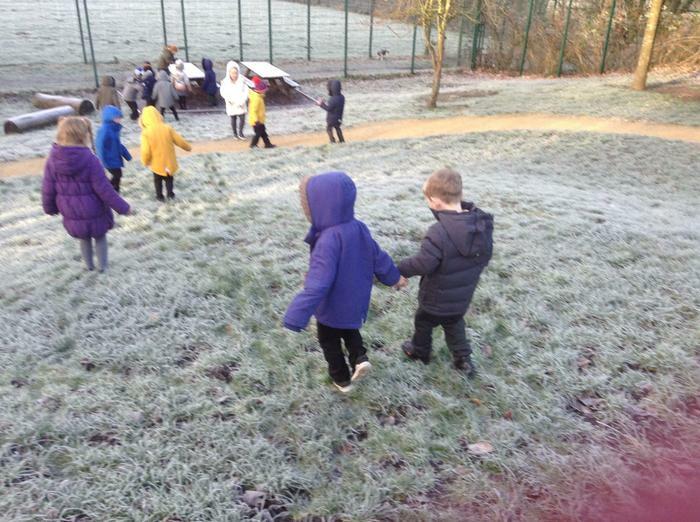 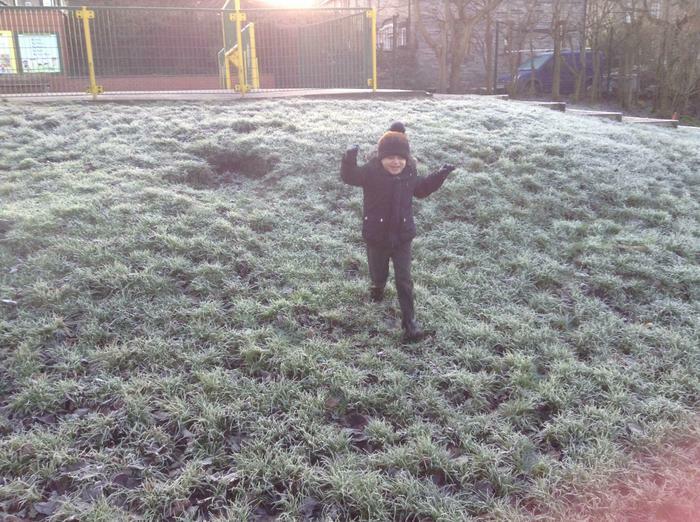 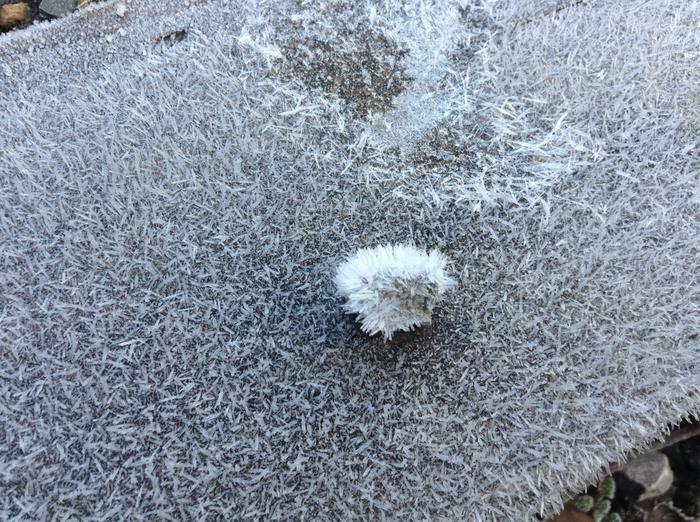 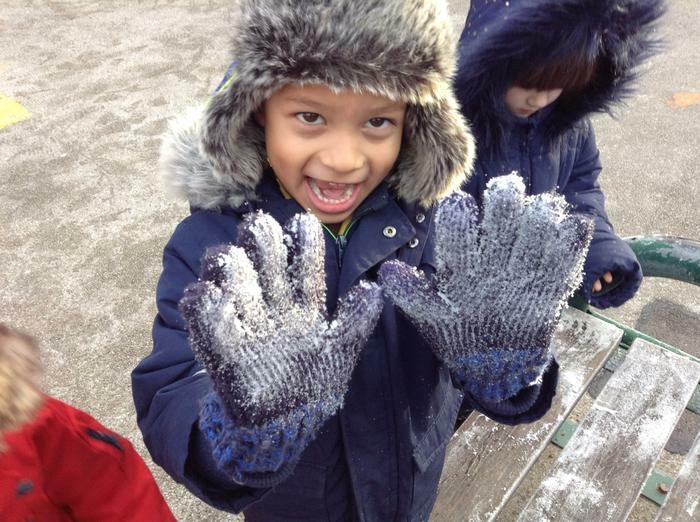 On Monday we started our new topic on winter, and as if by magic the very next day Jack Frost had been! 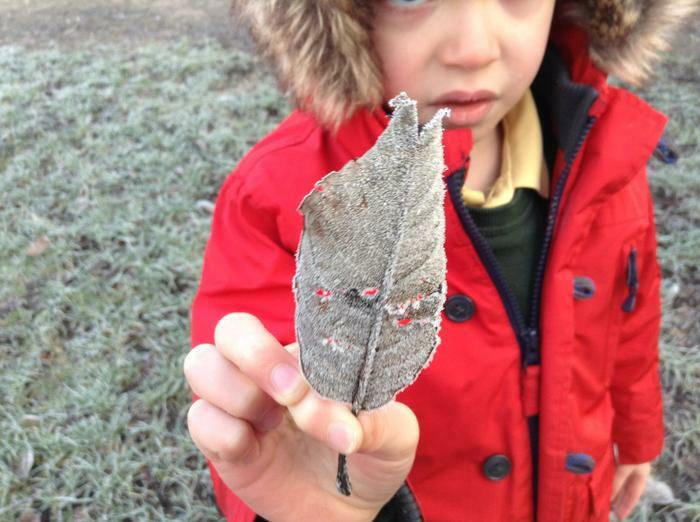 We went out to explore the crunchy grass, tiny icicles and frozen leaves. 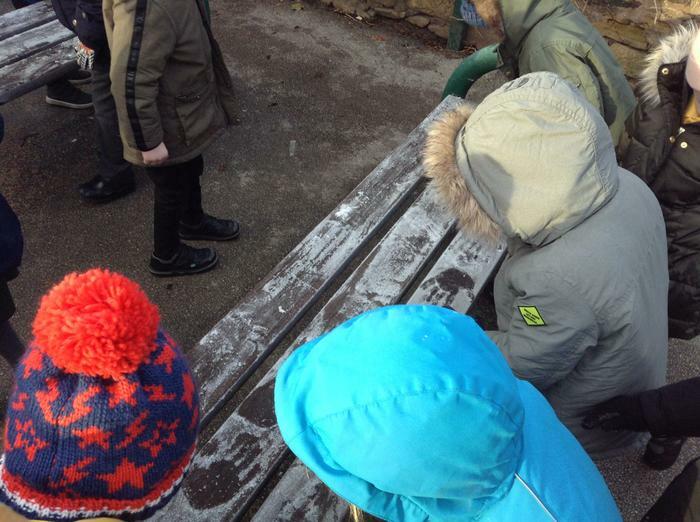 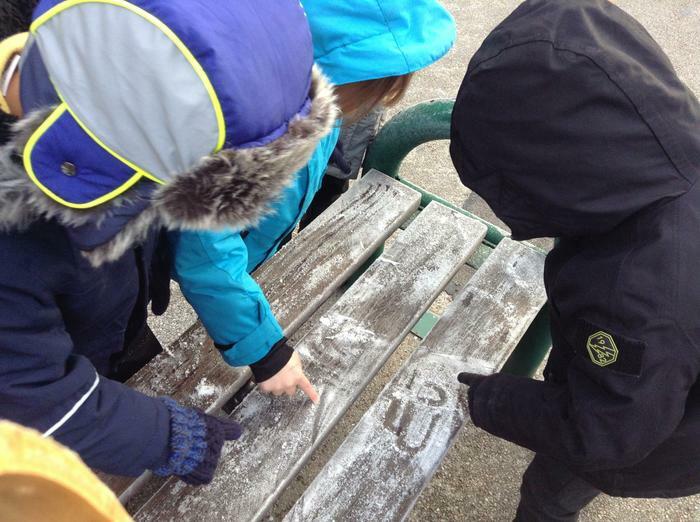 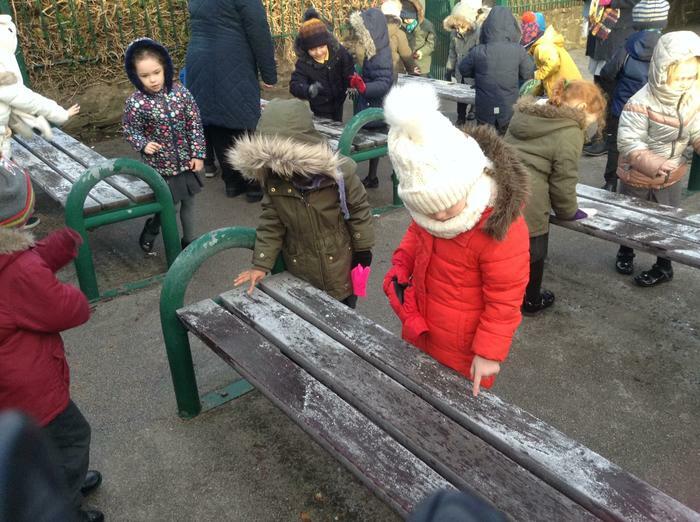 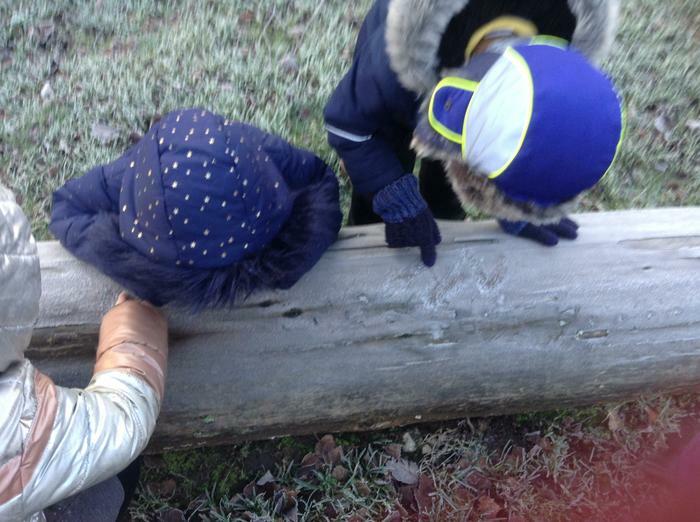 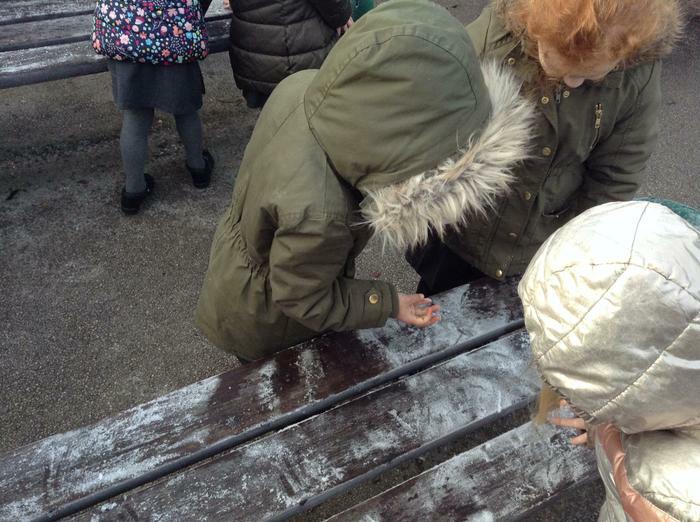 We wrote our names in the frost and sprinkled frosty flakes like snow. 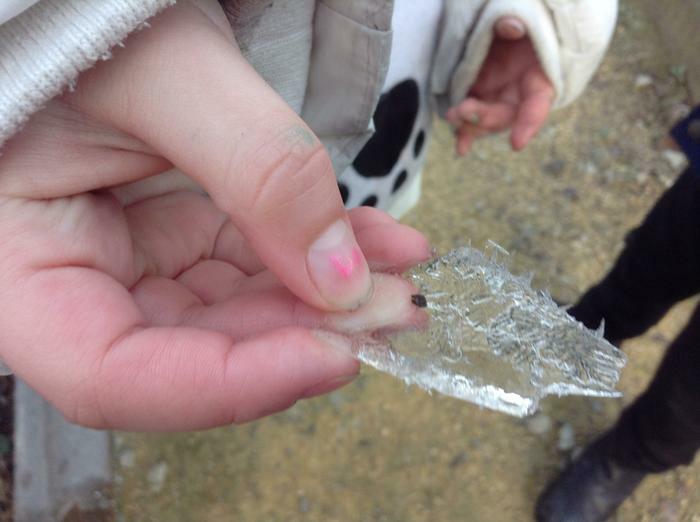 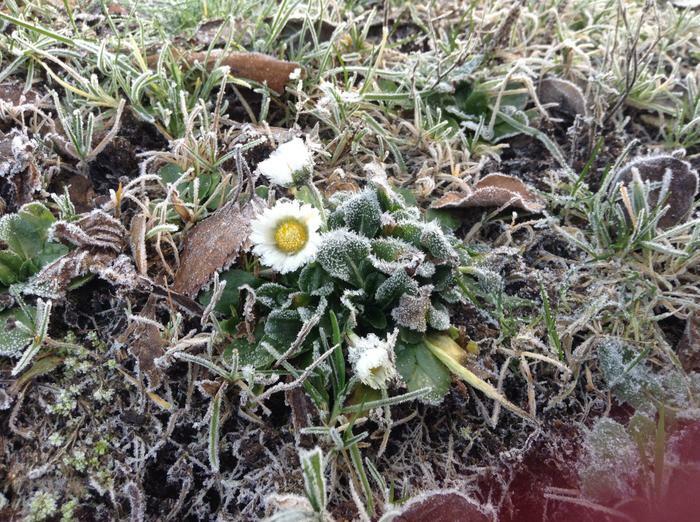 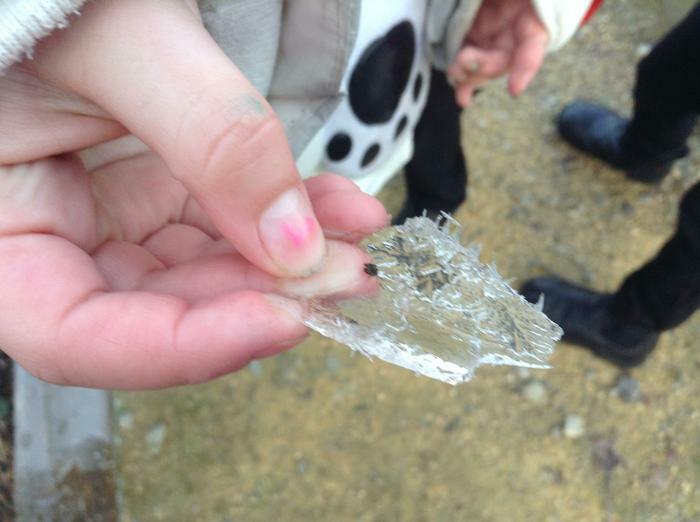 We found ice in a cone and the daisies were frozen solid. 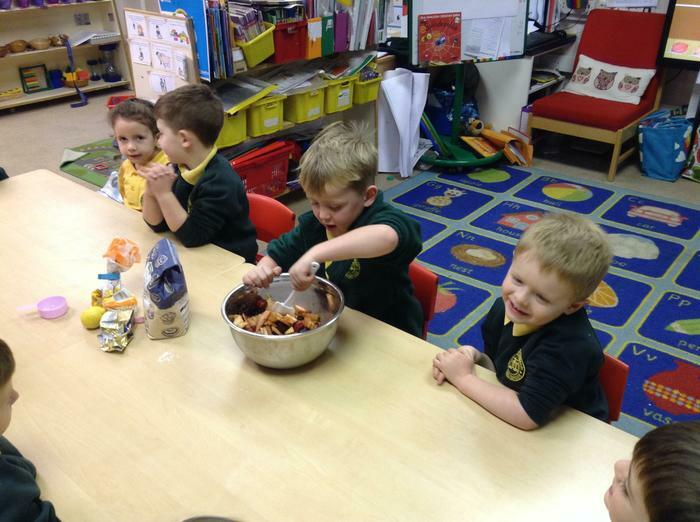 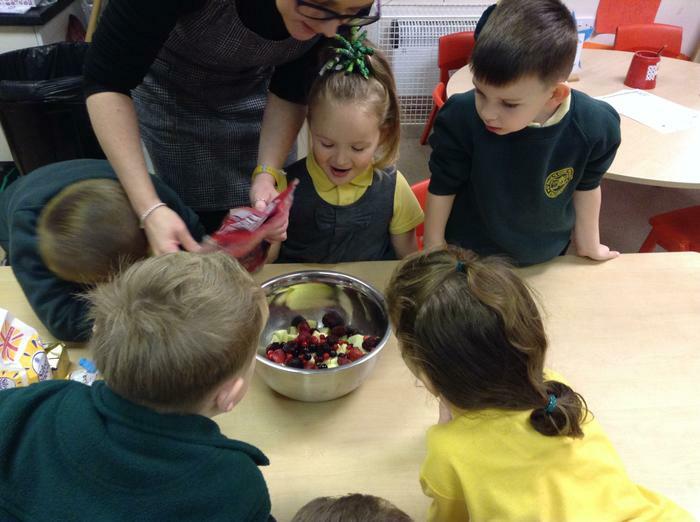 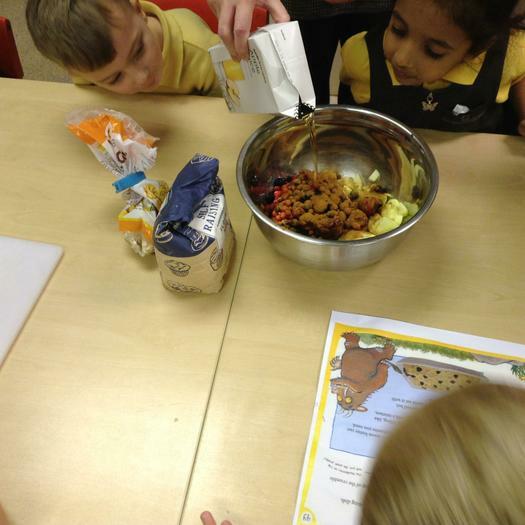 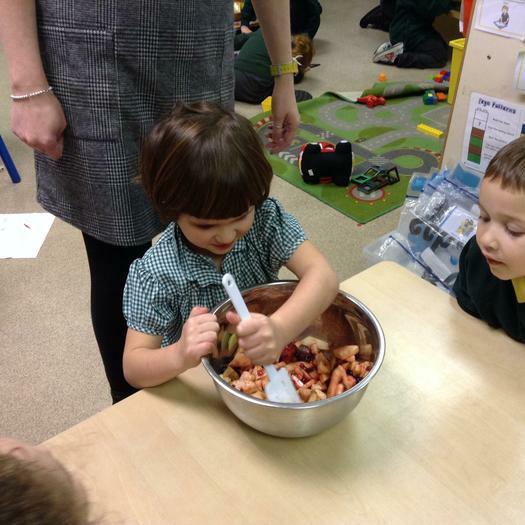 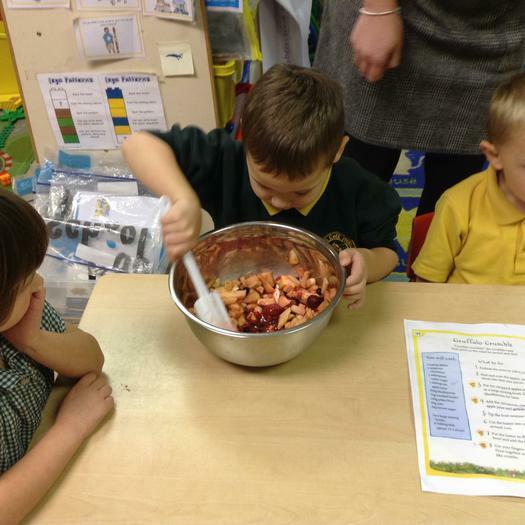 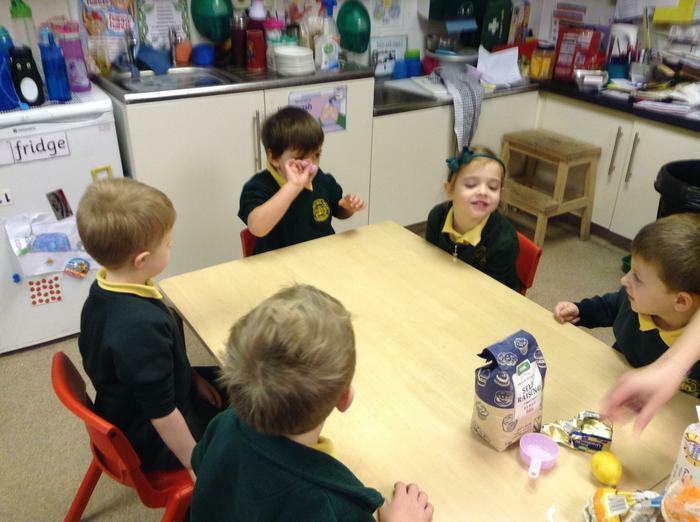 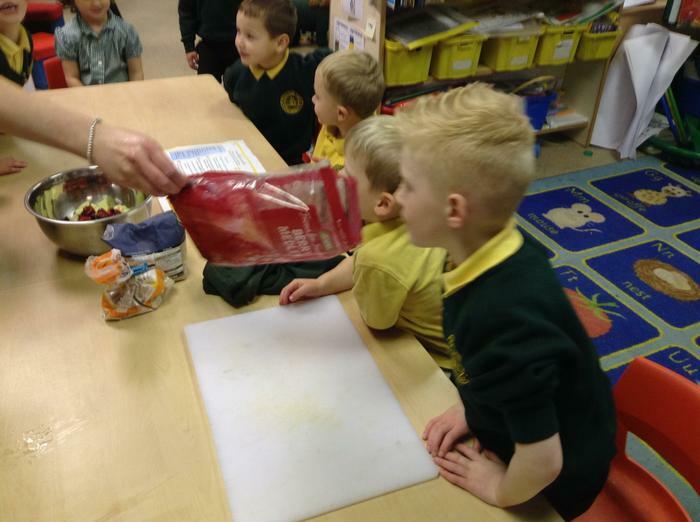 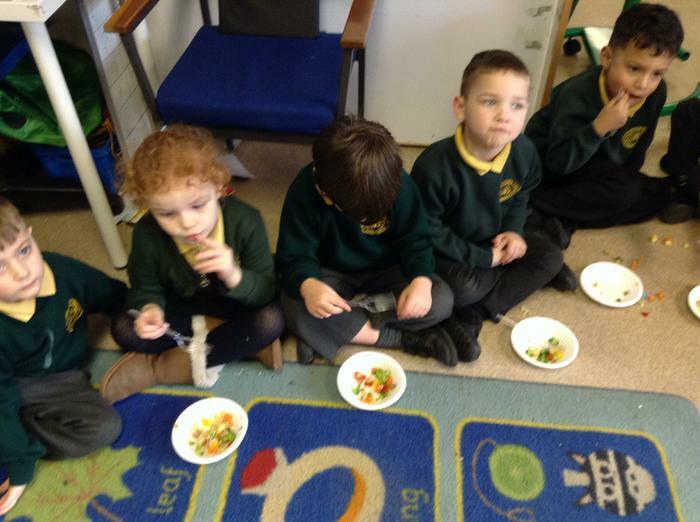 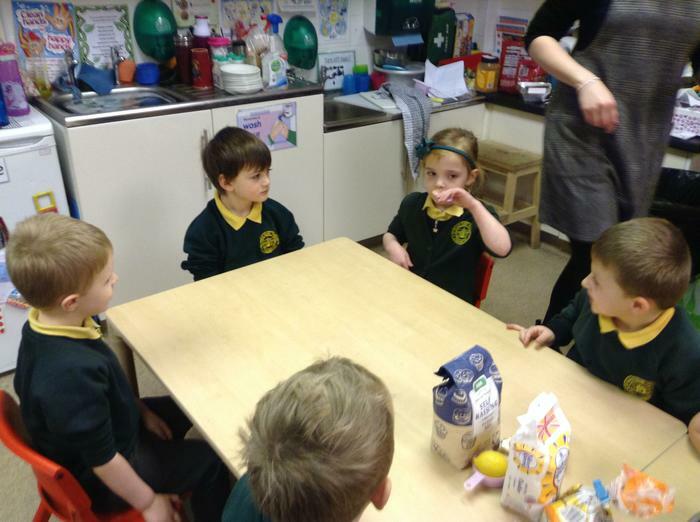 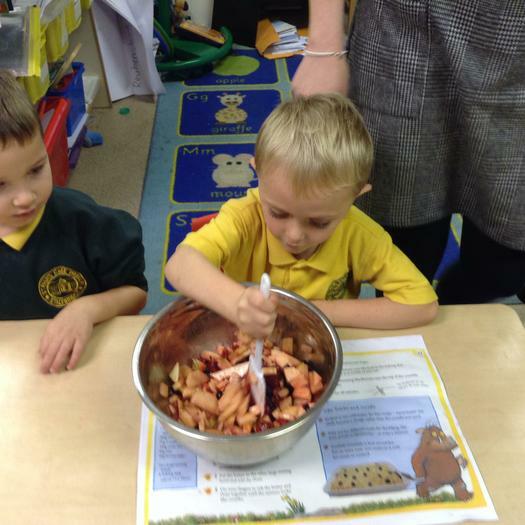 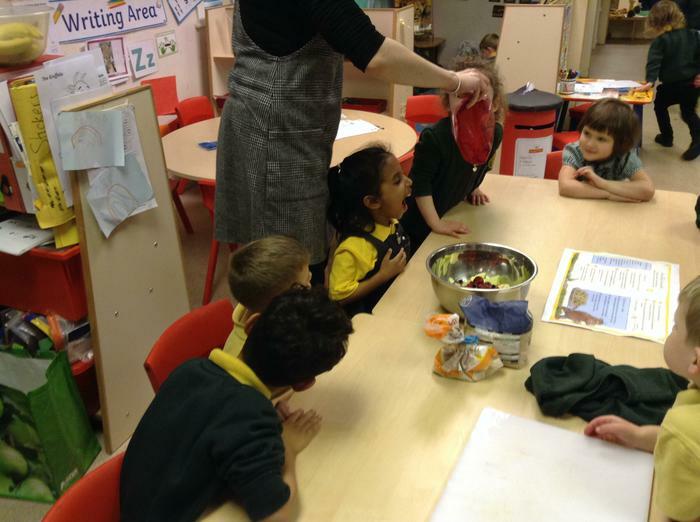 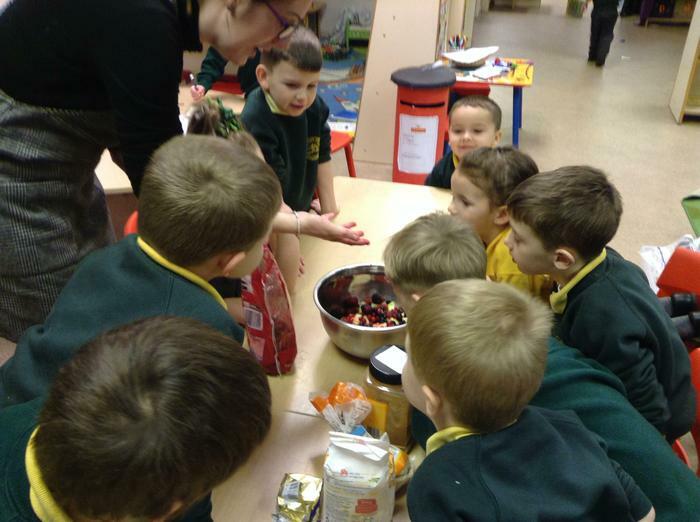 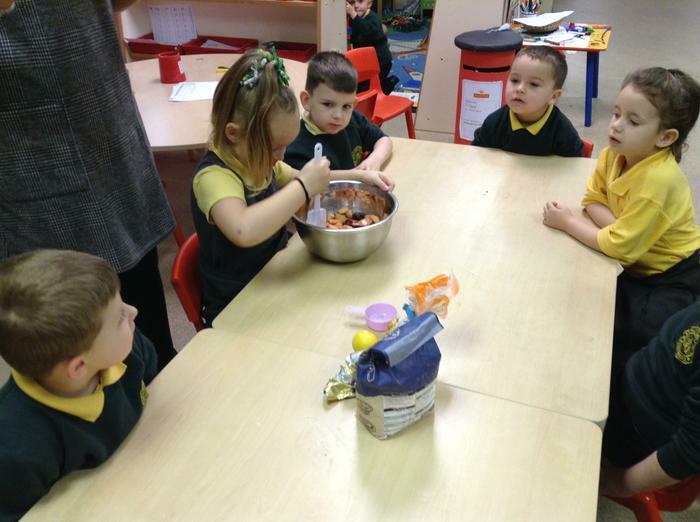 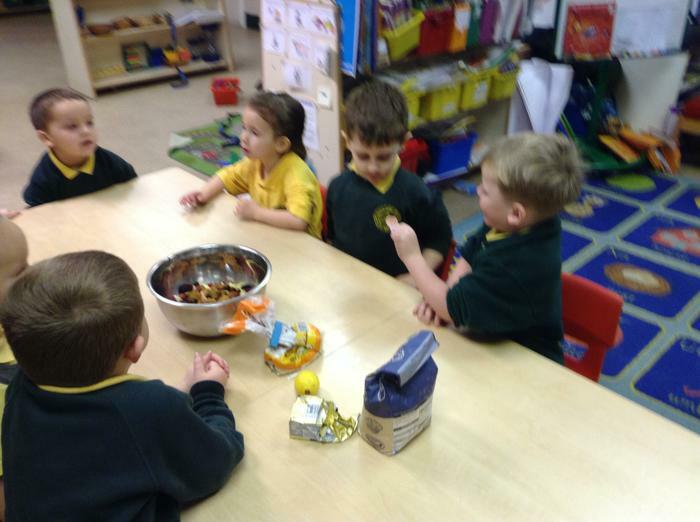 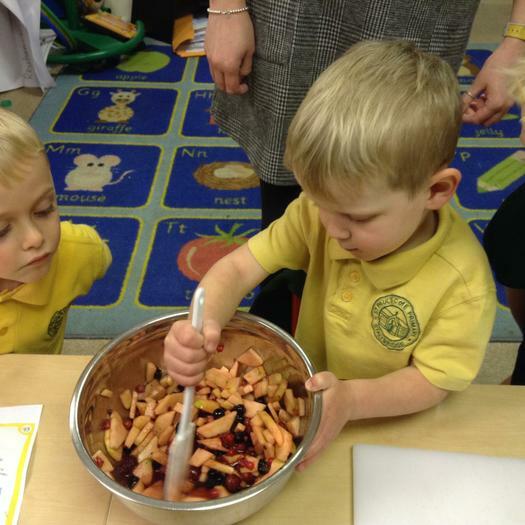 Last week we learnt about the story of The Little Red Hen. 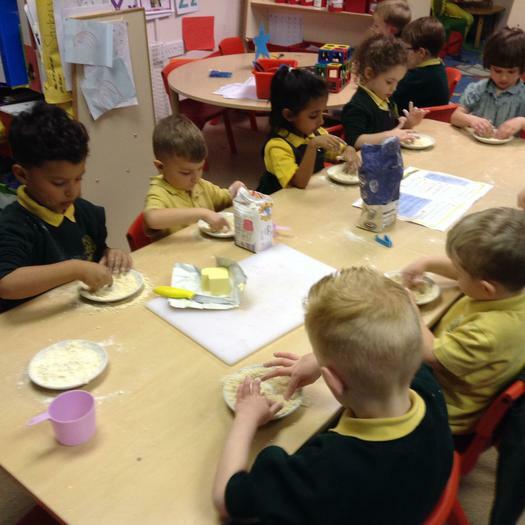 This week we decided to make some bread for ourselves! 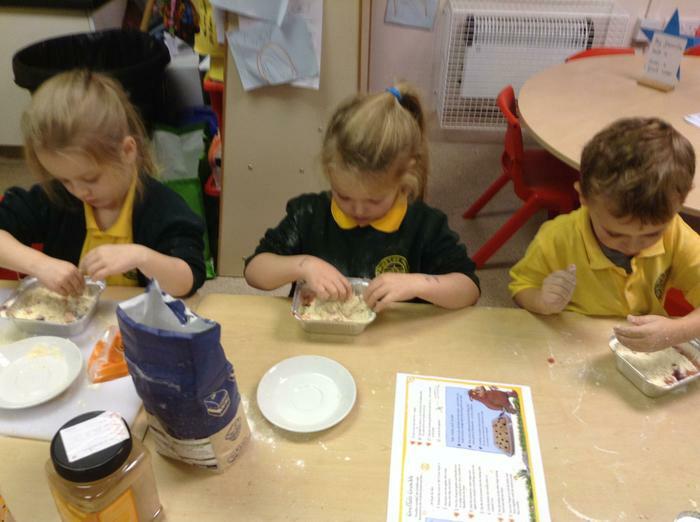 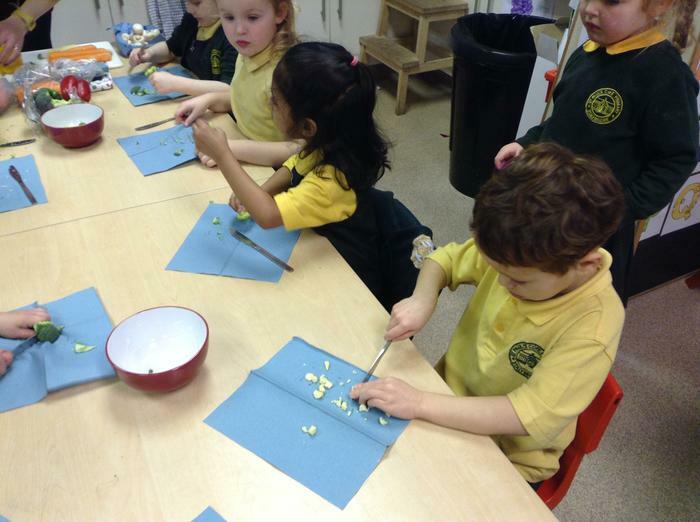 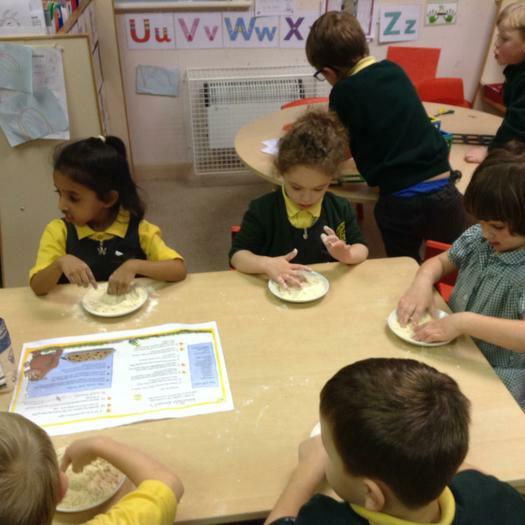 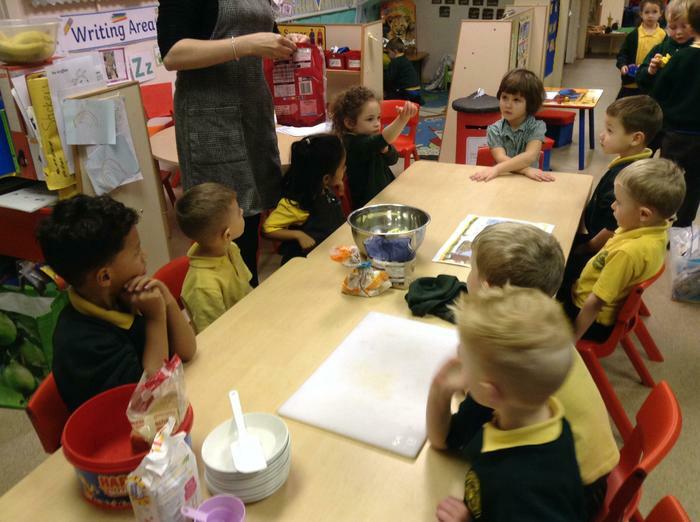 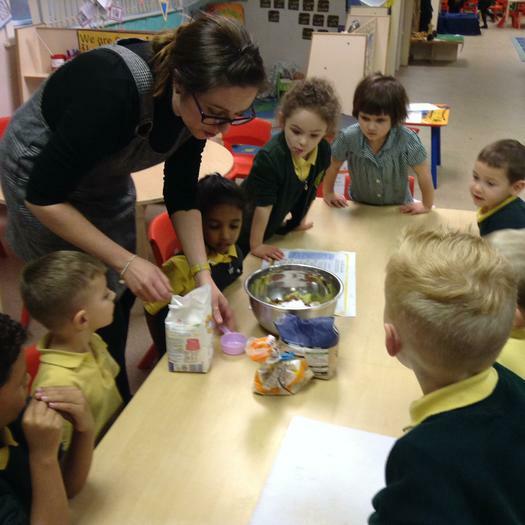 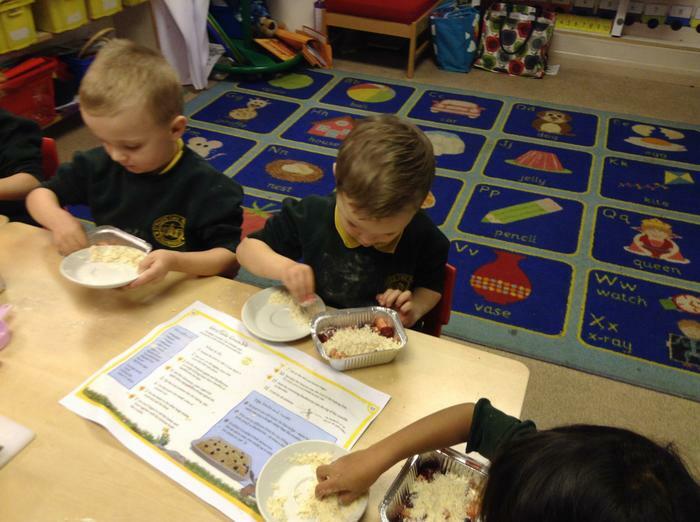 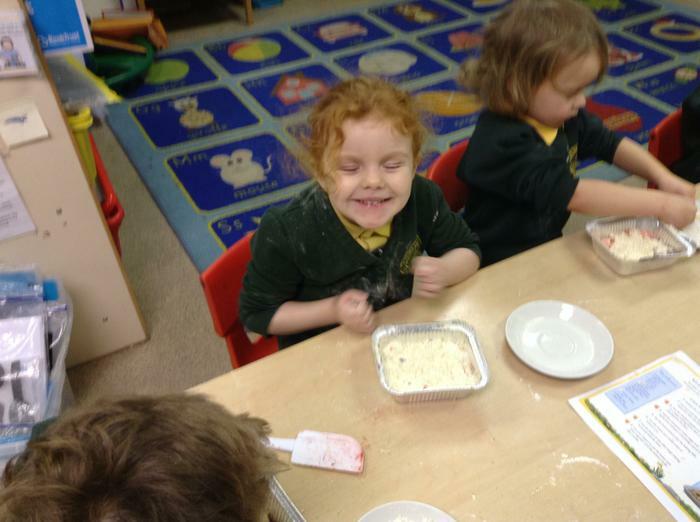 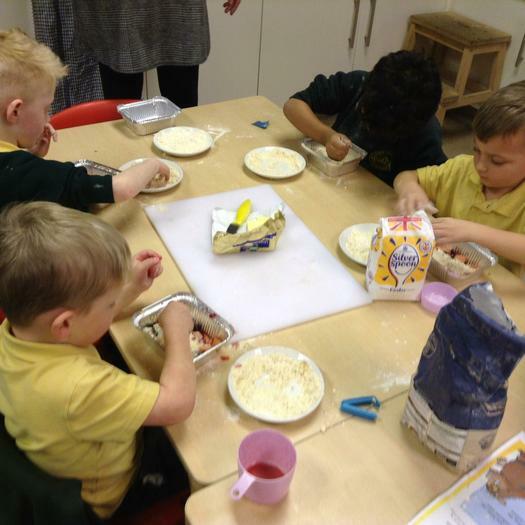 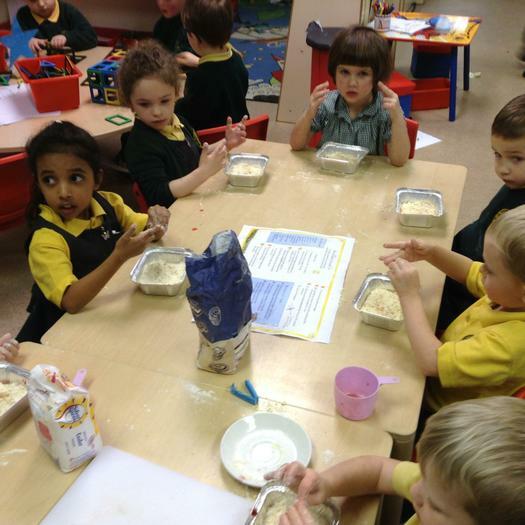 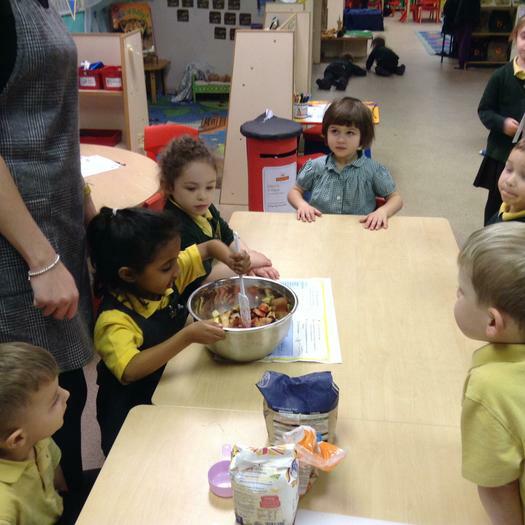 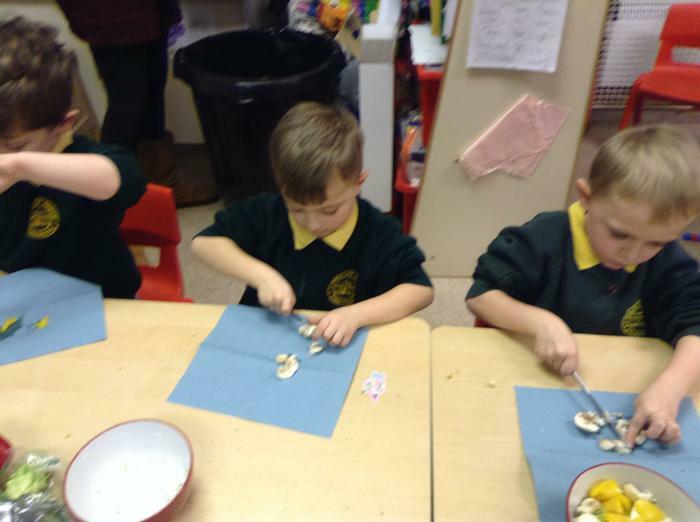 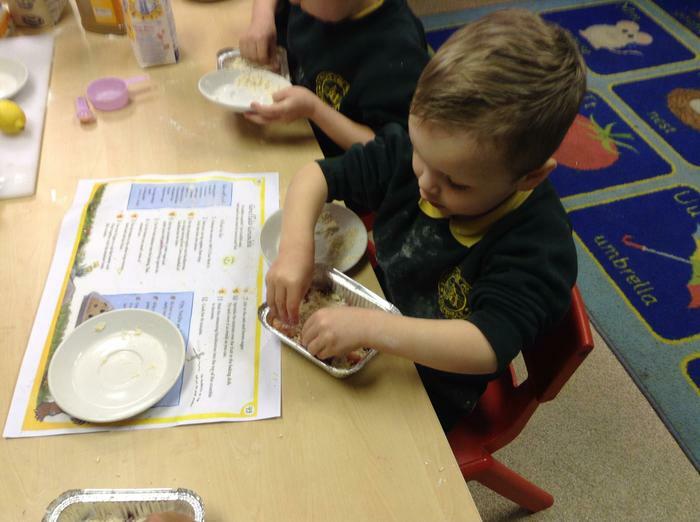 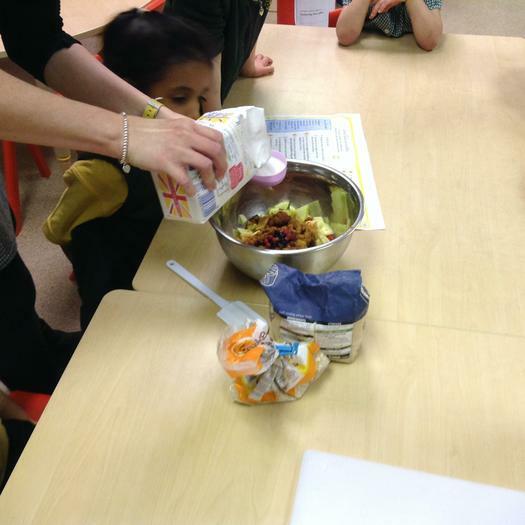 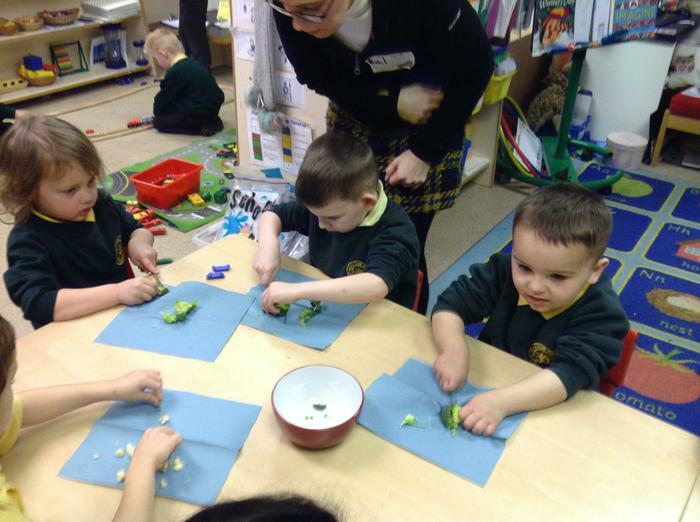 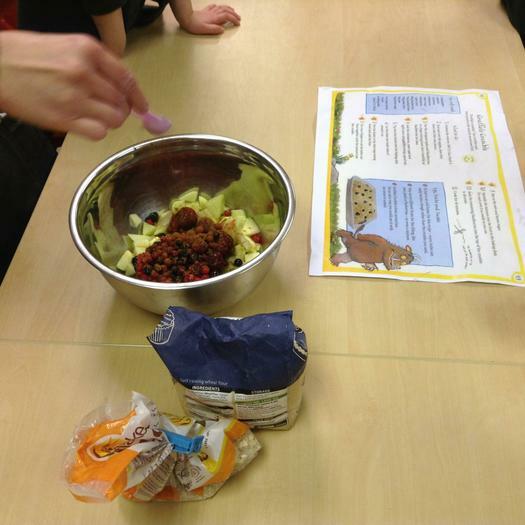 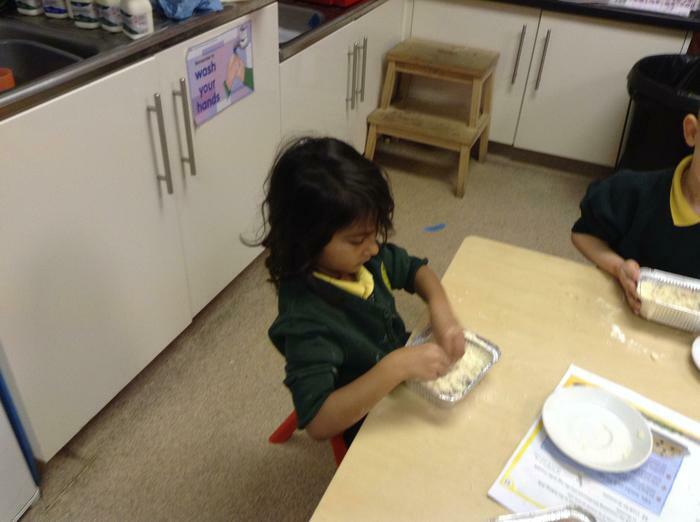 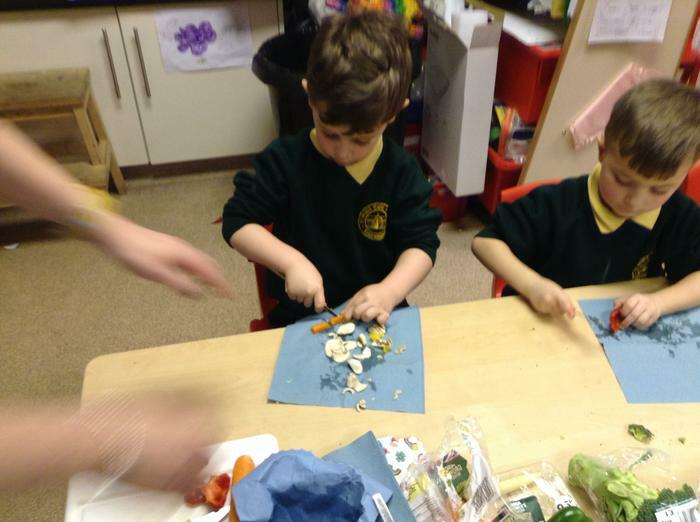 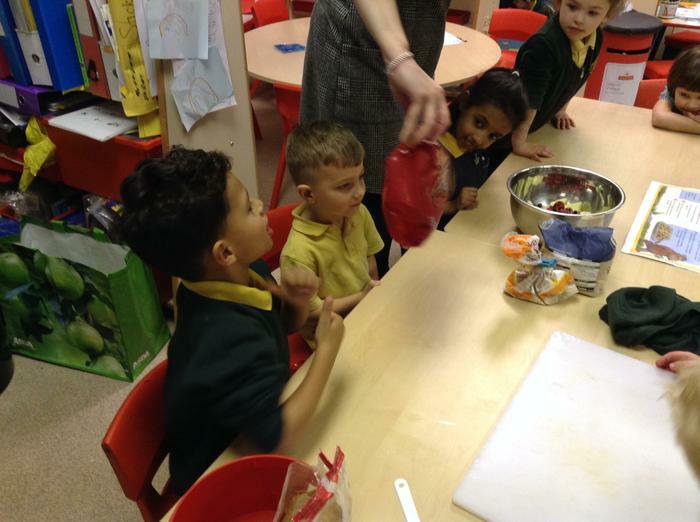 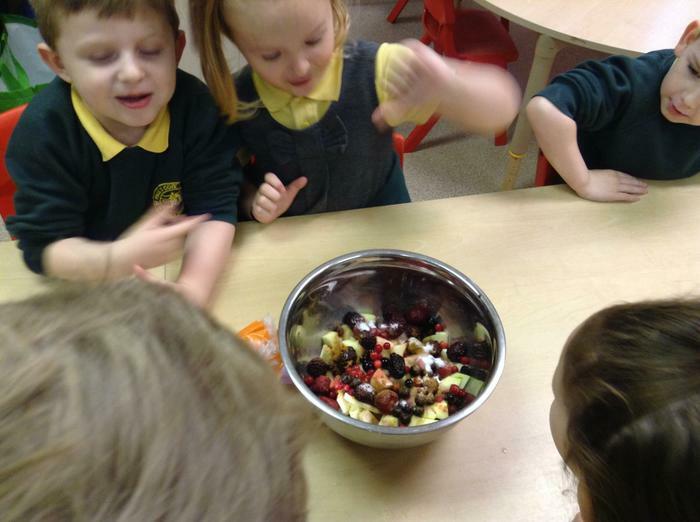 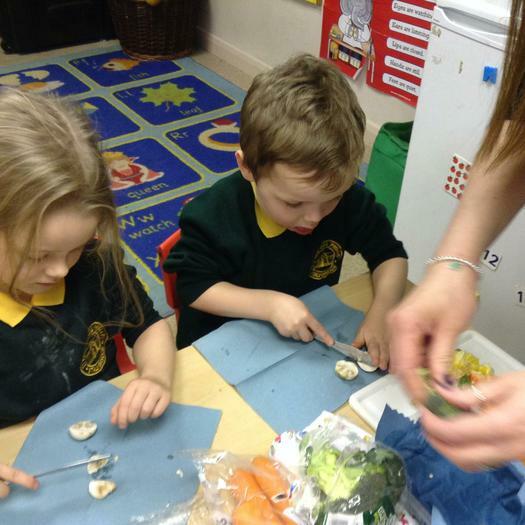 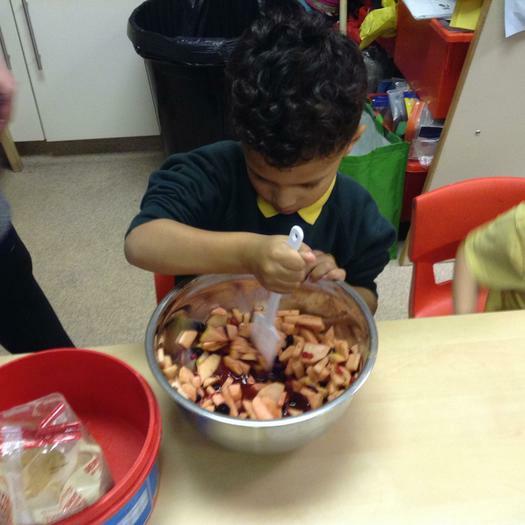 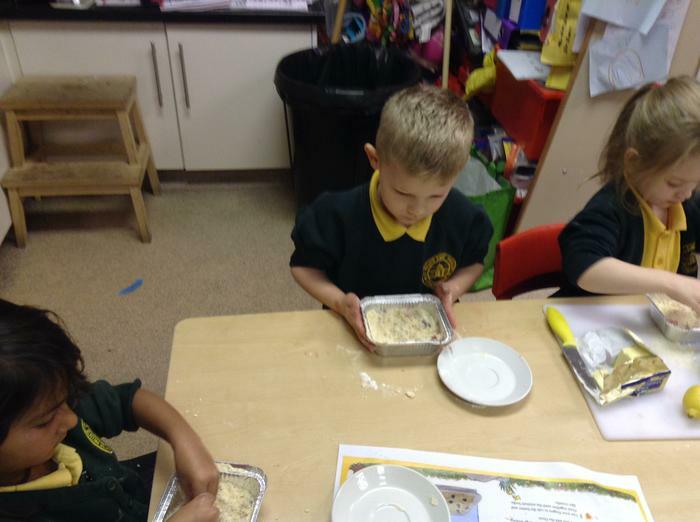 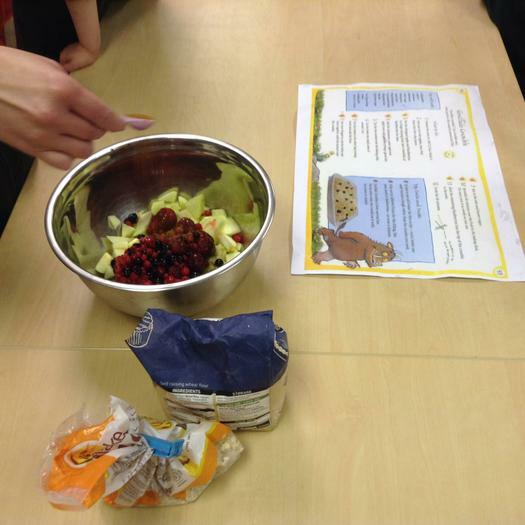 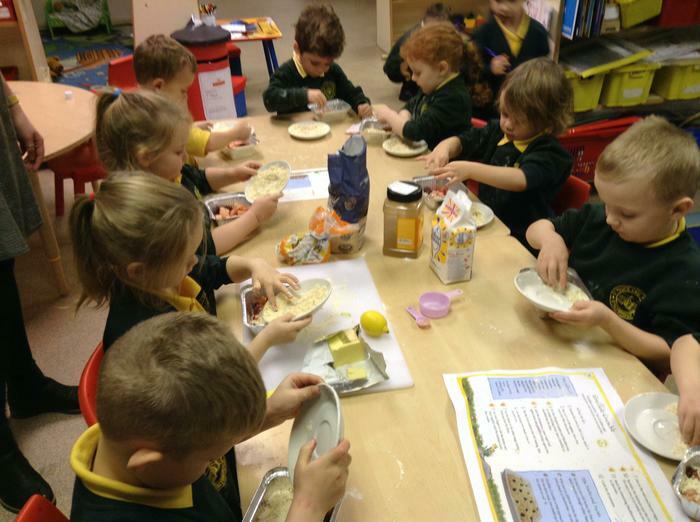 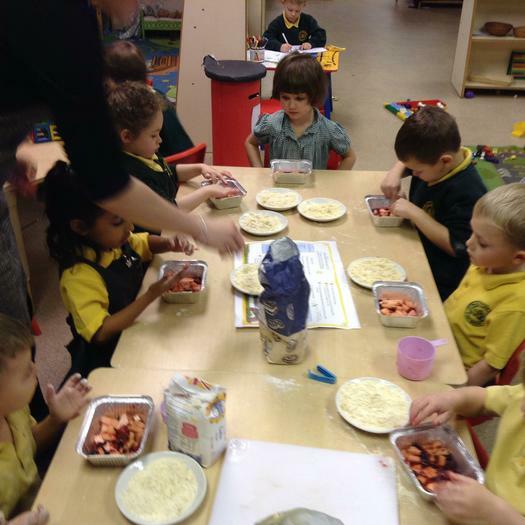 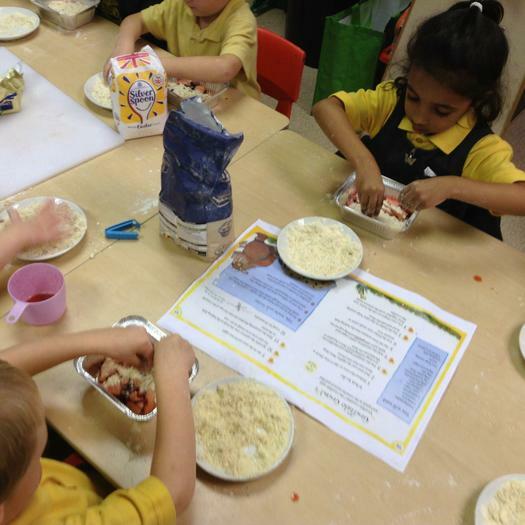 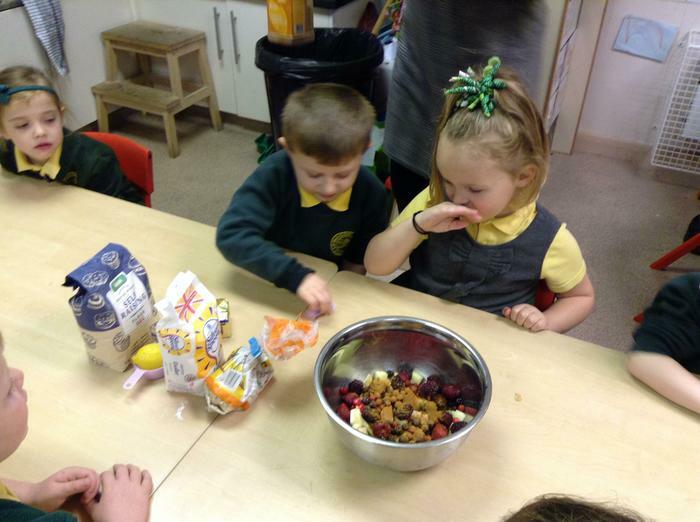 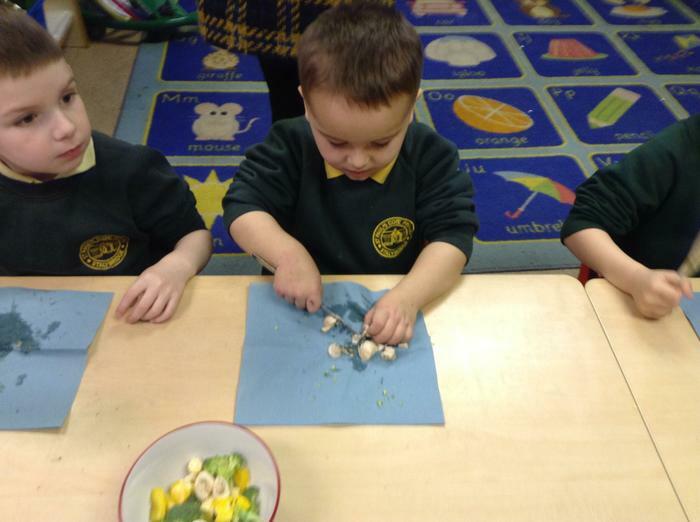 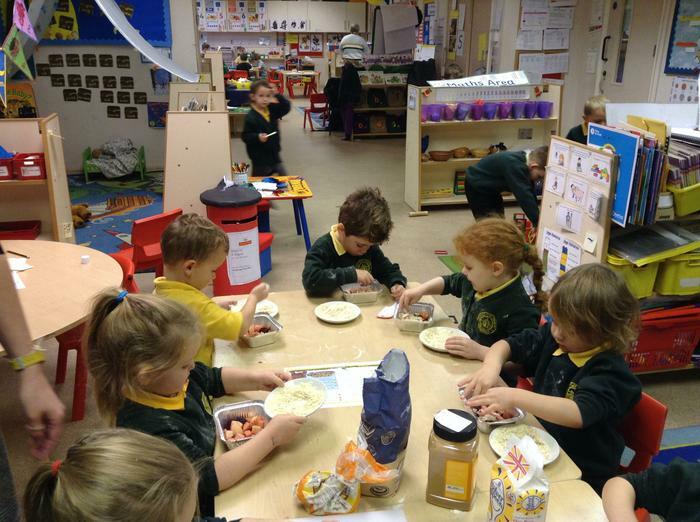 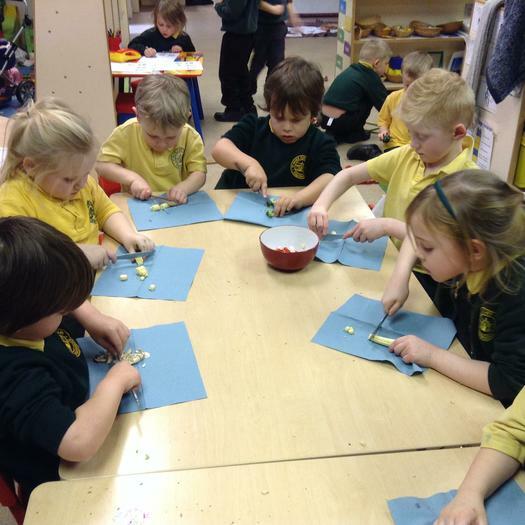 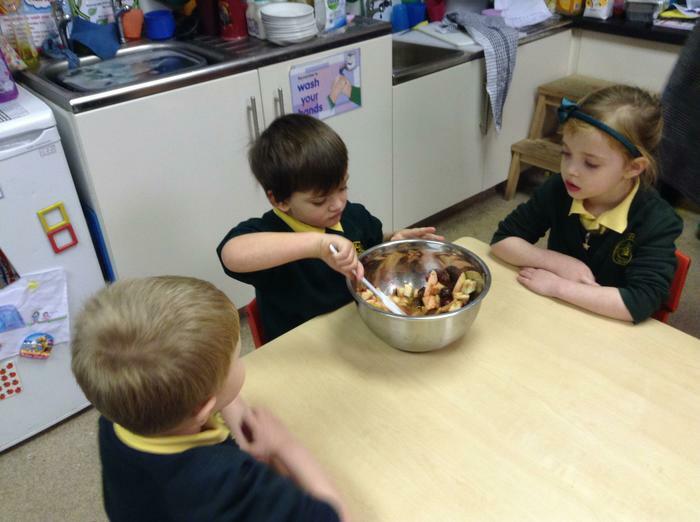 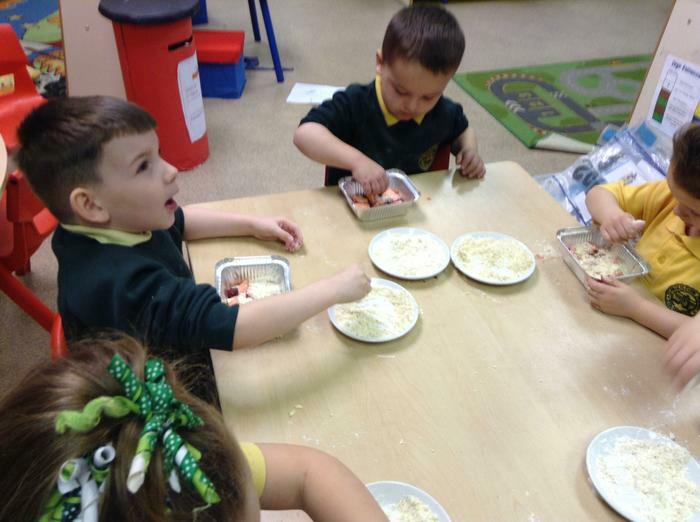 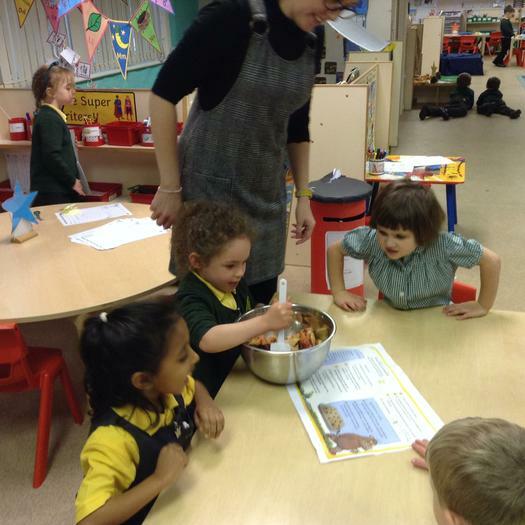 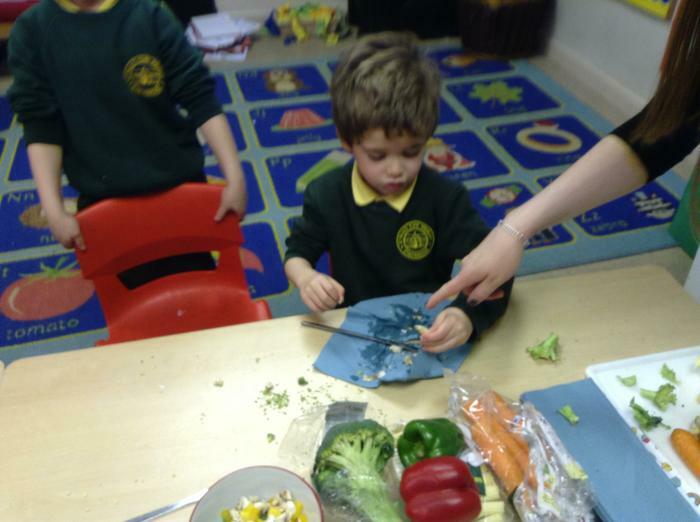 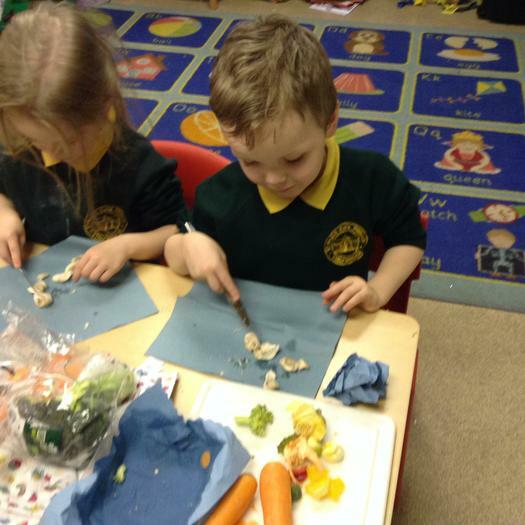 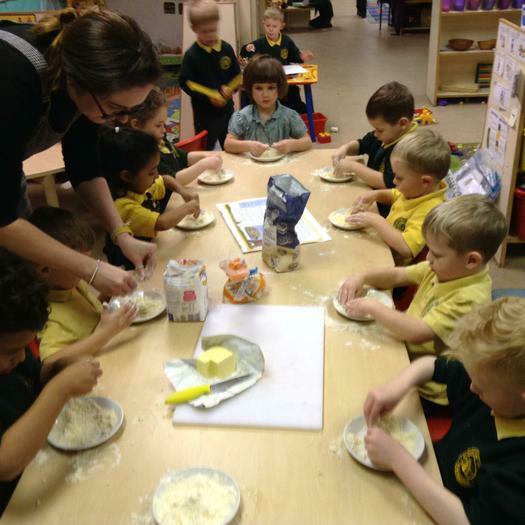 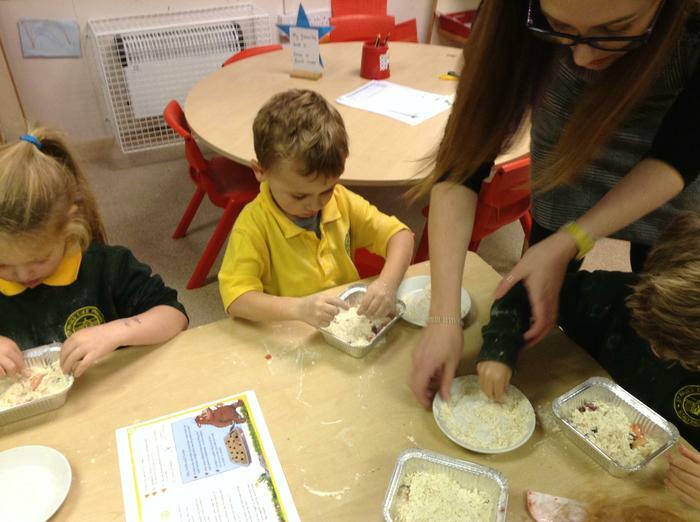 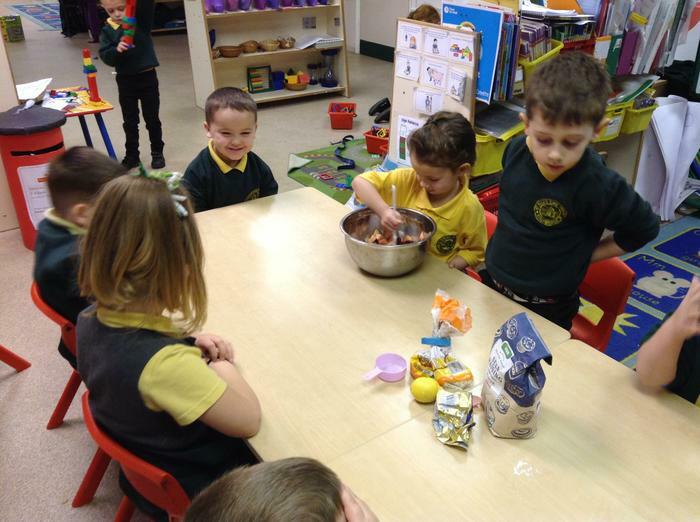 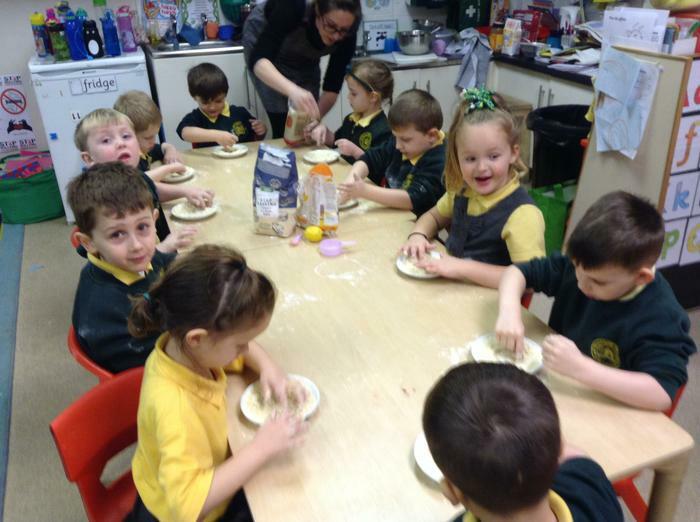 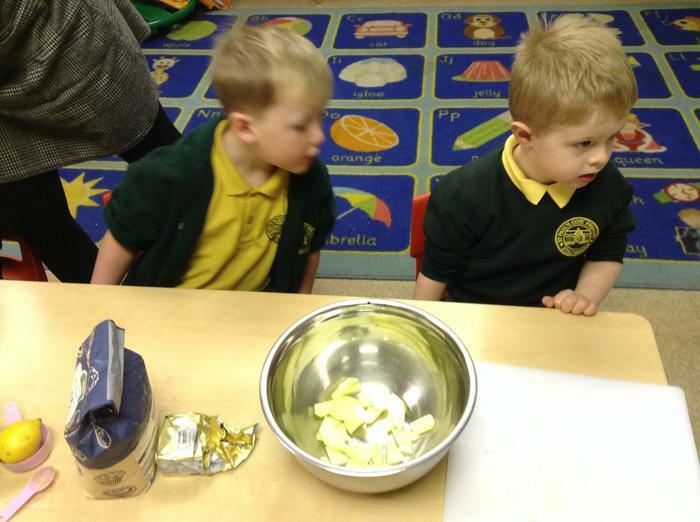 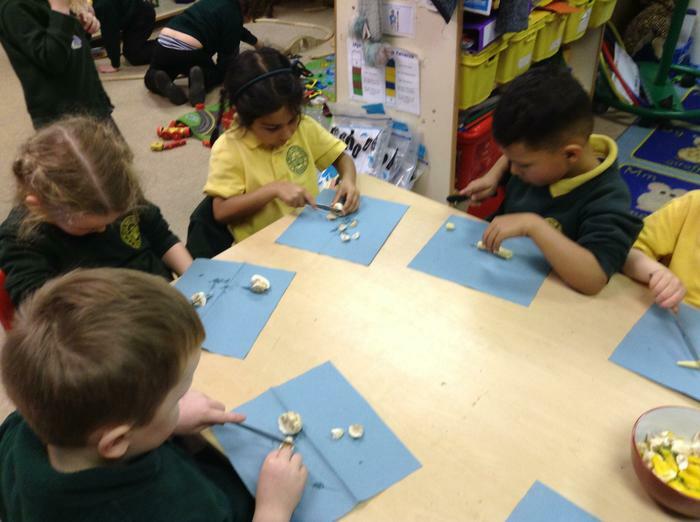 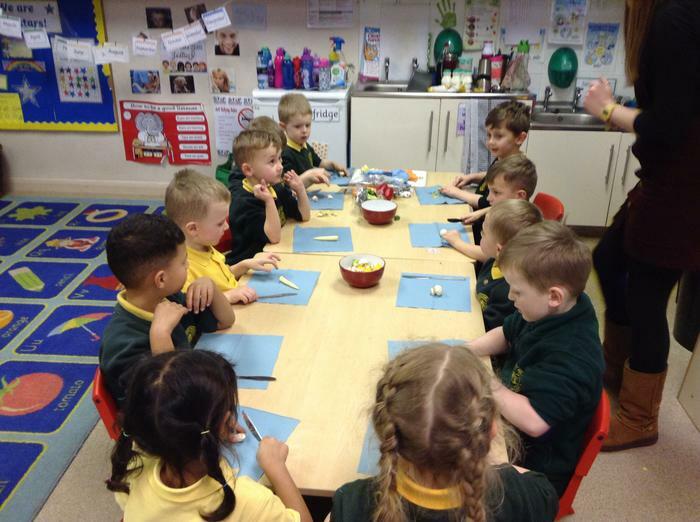 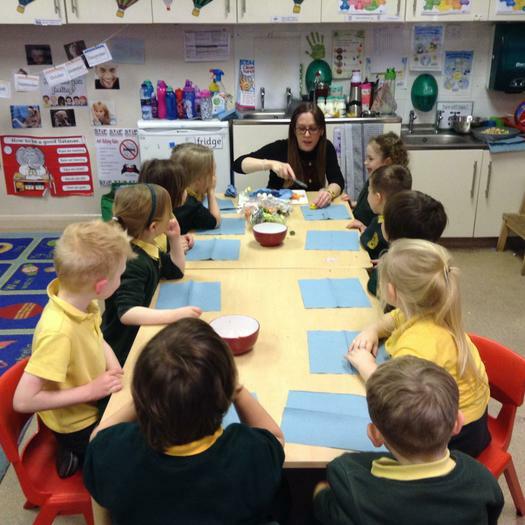 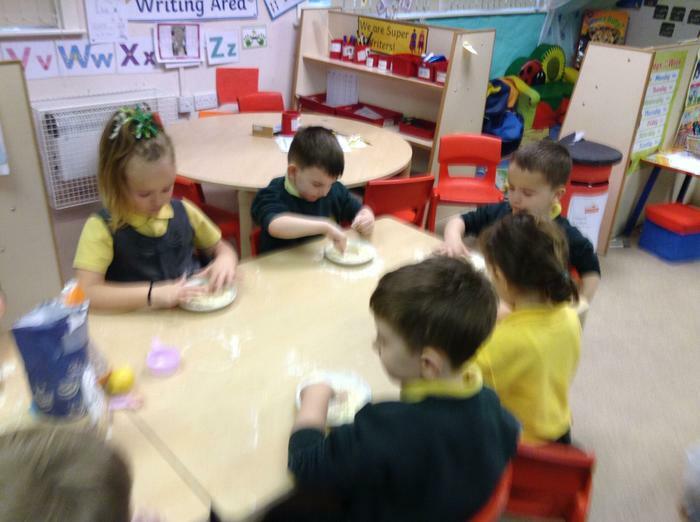 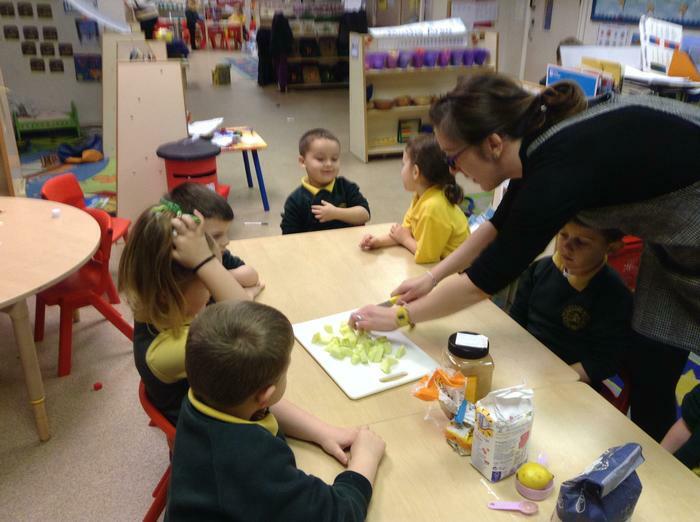 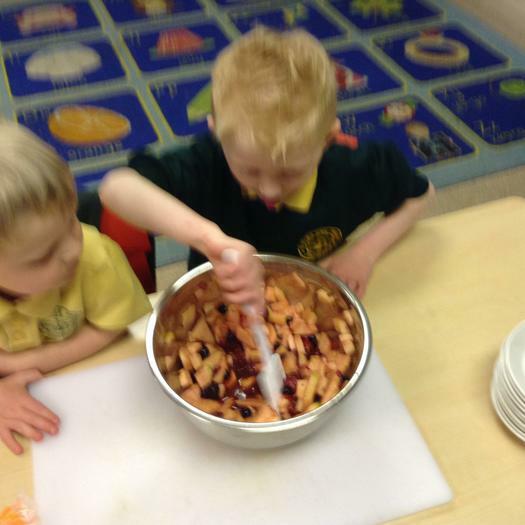 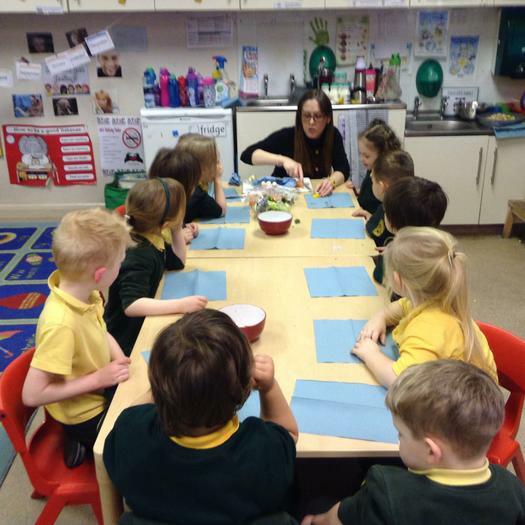 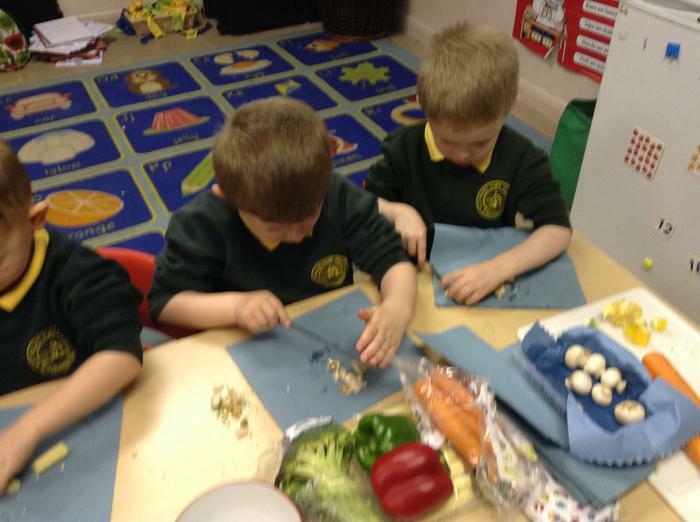 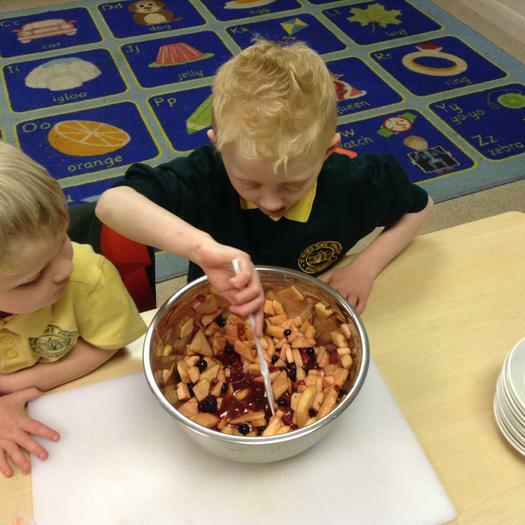 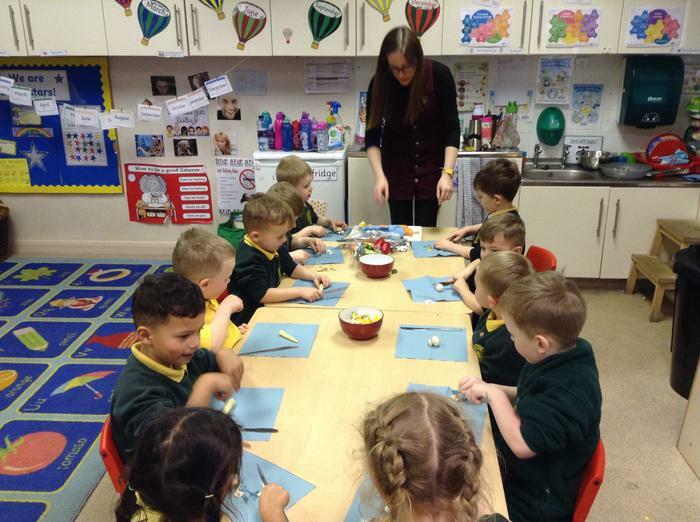 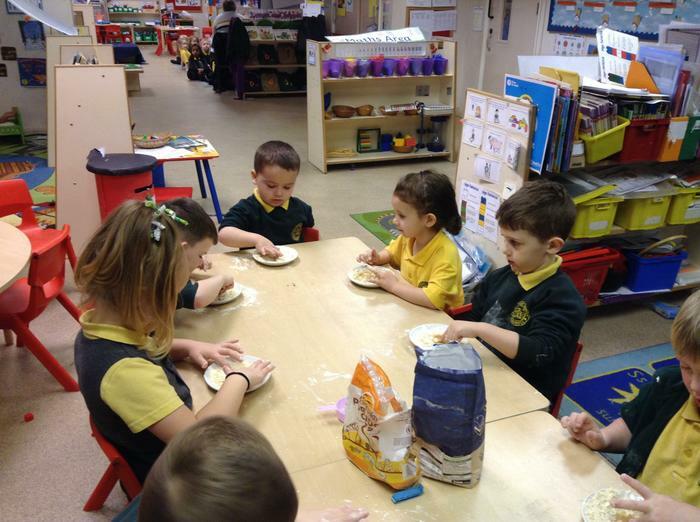 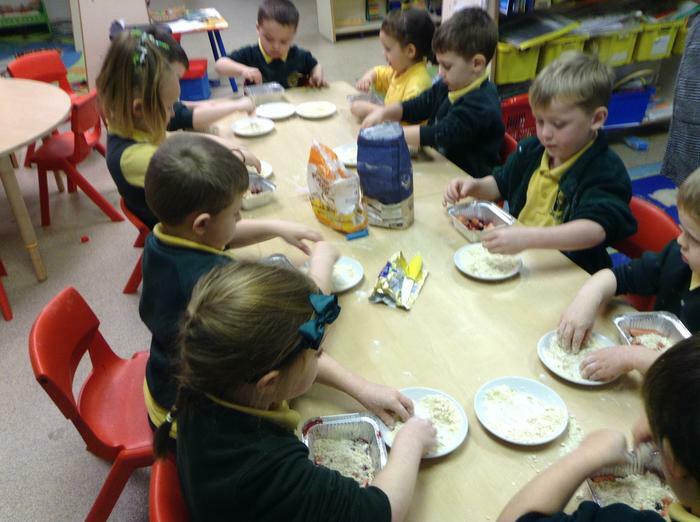 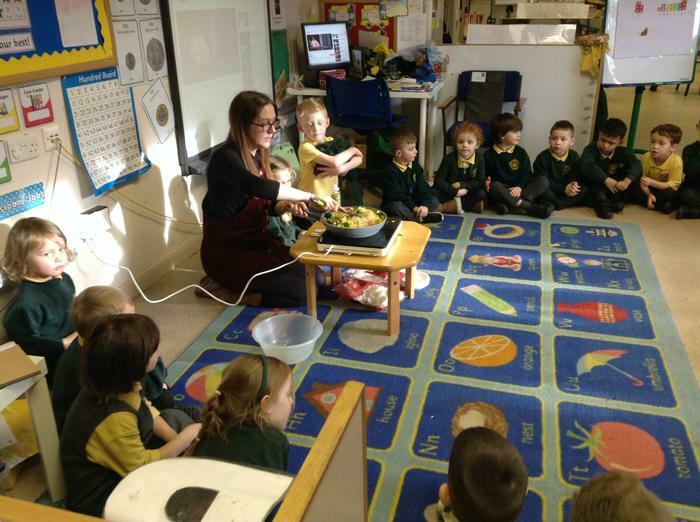 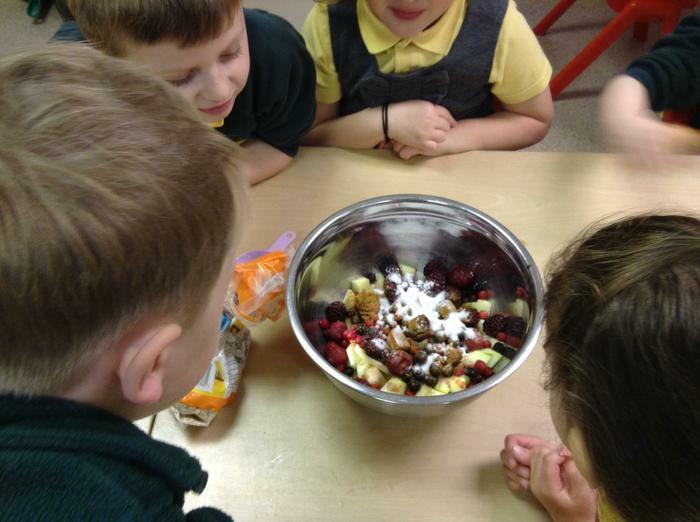 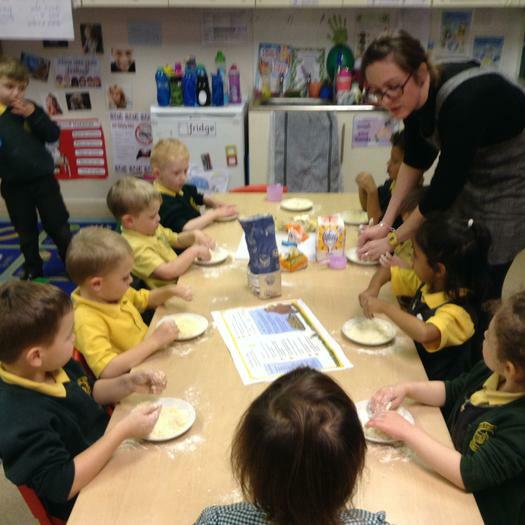 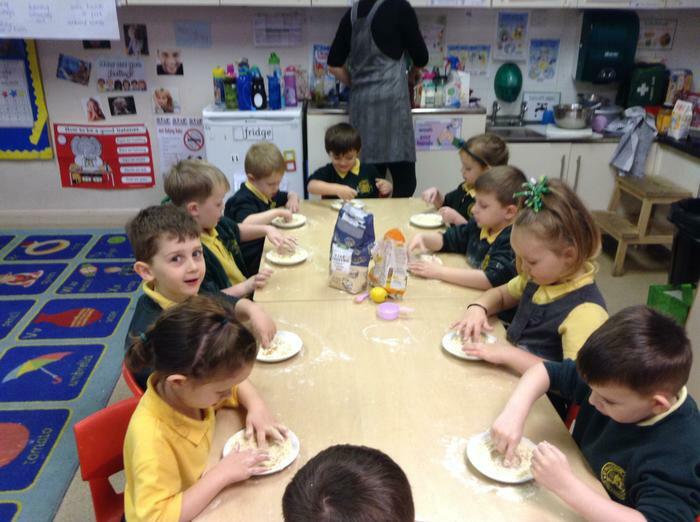 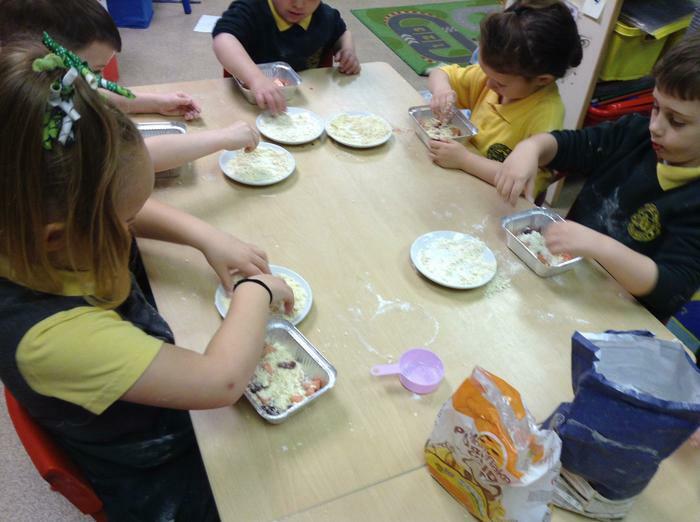 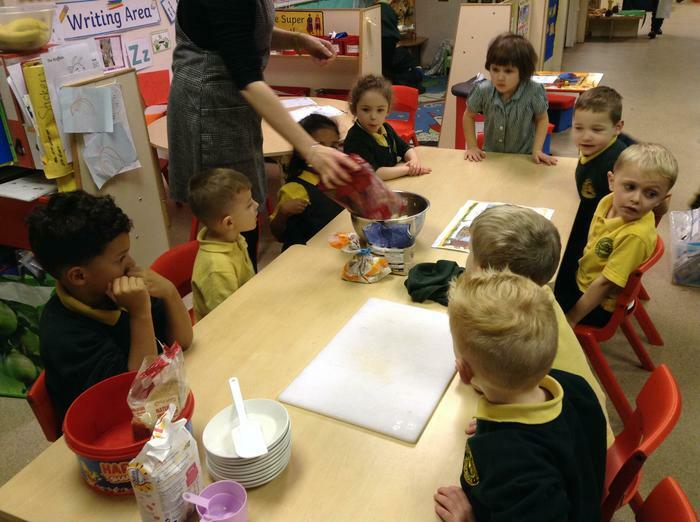 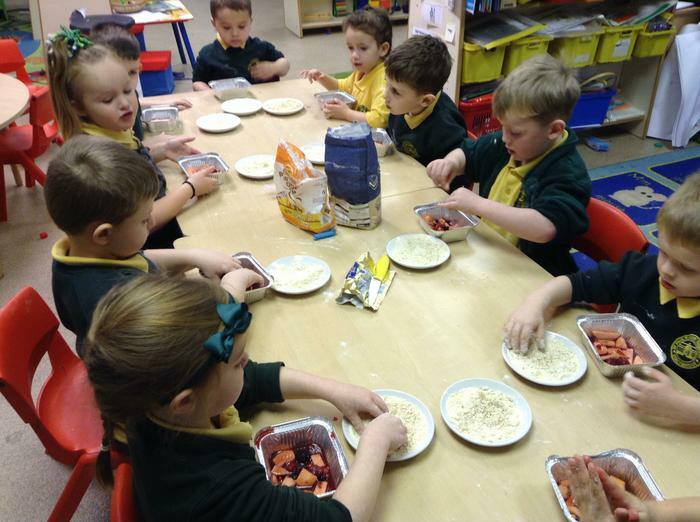 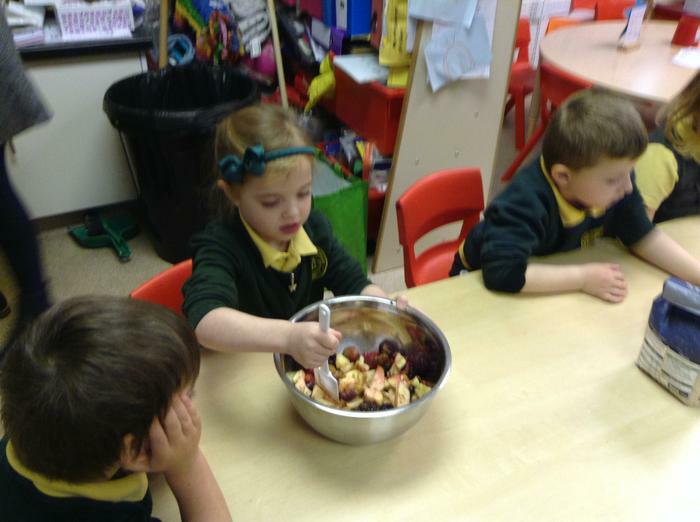 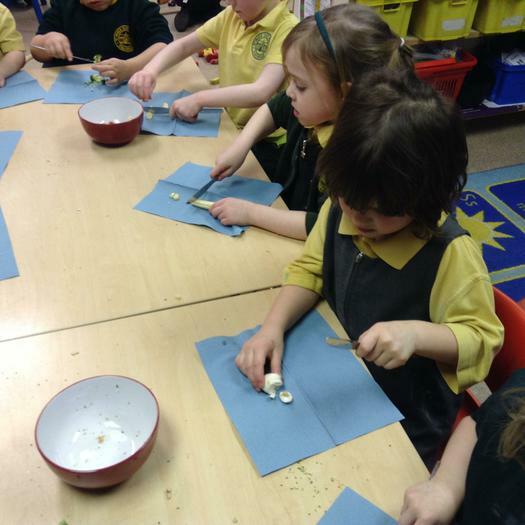 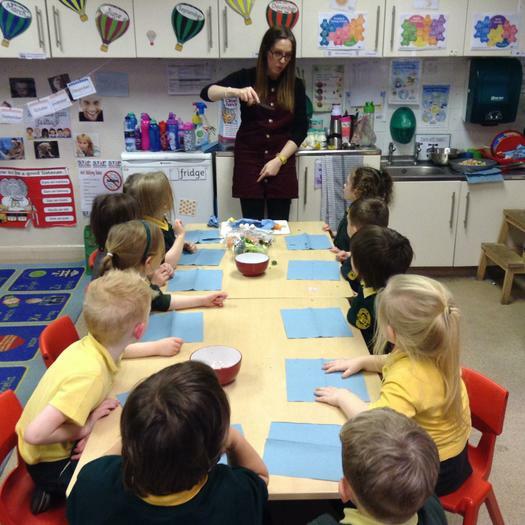 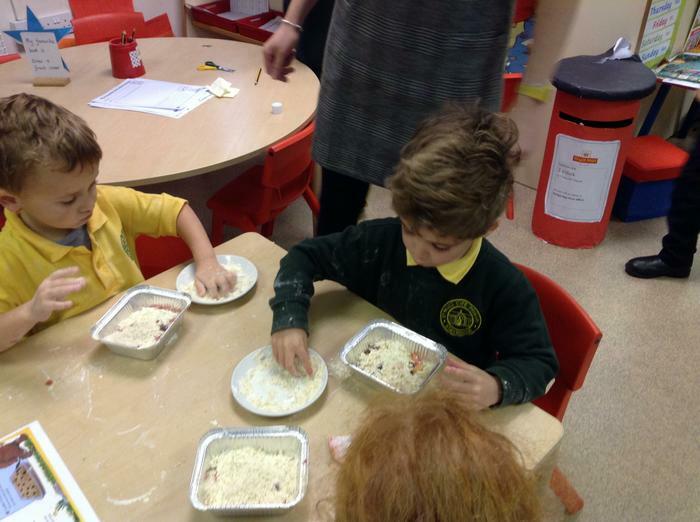 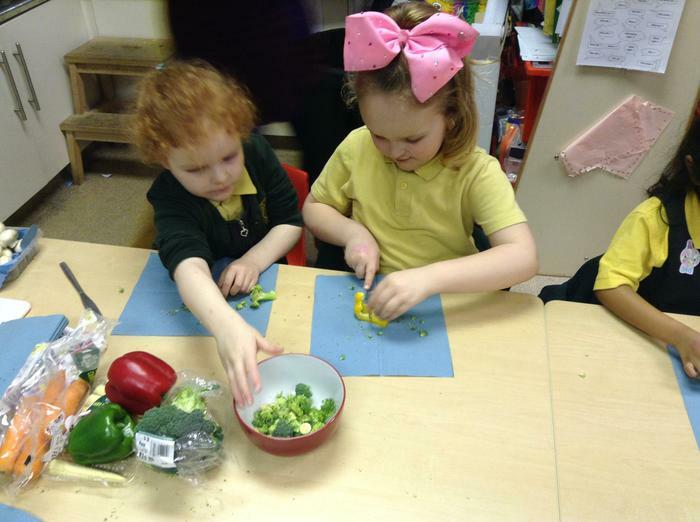 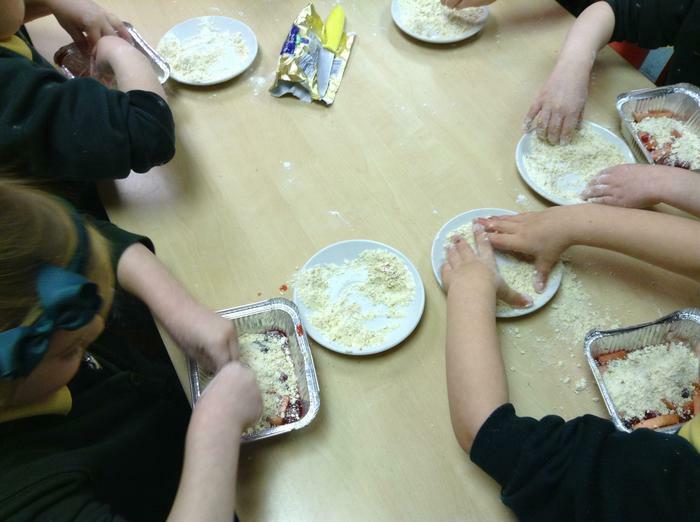 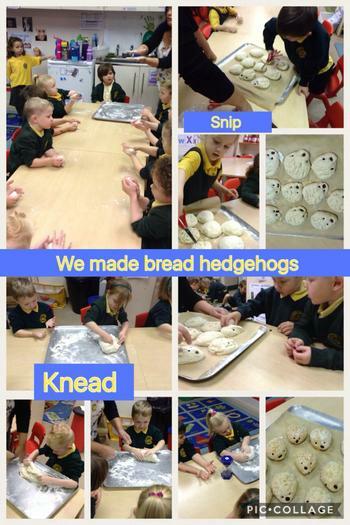 We worked together to make the bread, mixing, kneading and snipping! 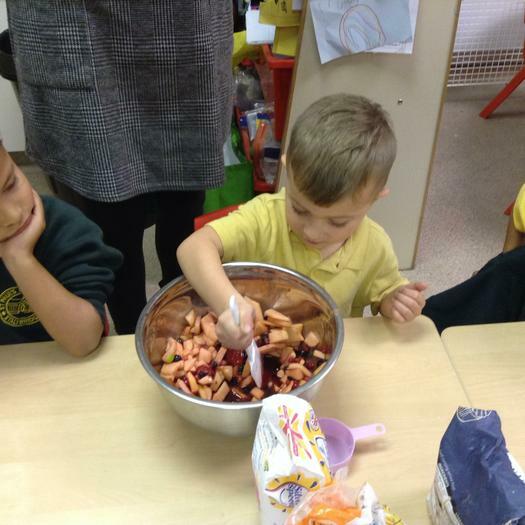 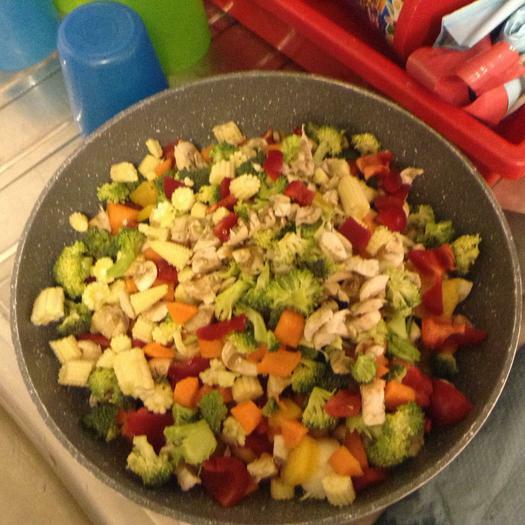 It was great fun and it tasted delicious! 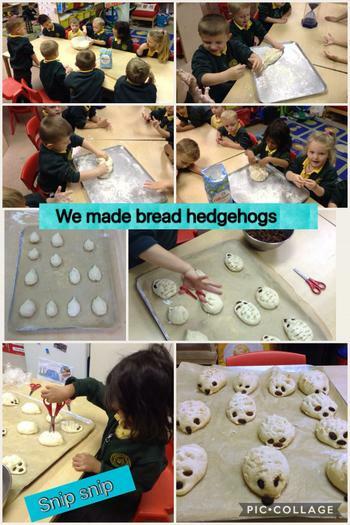 We made extra bread hedgehogs to take to church for harvest festival. 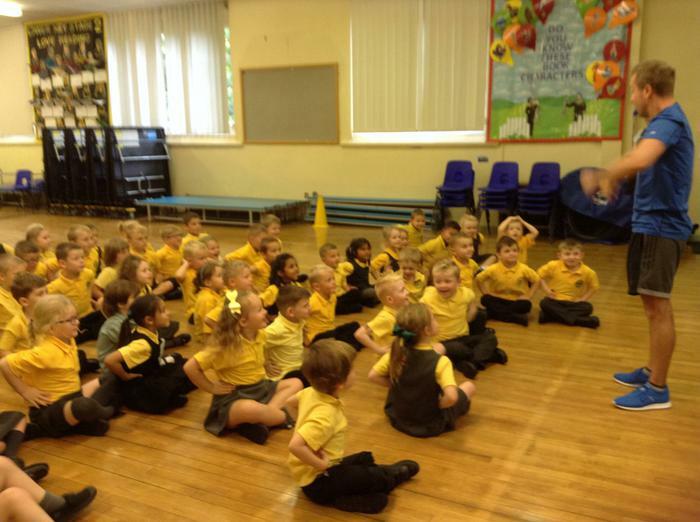 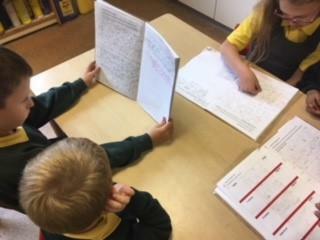 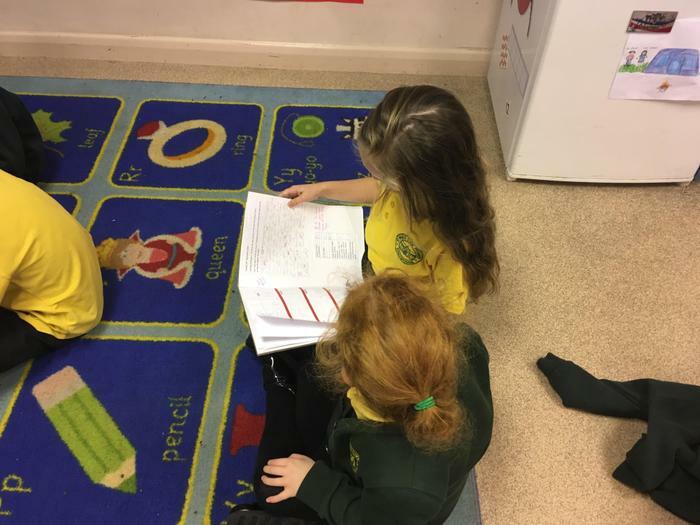 Class 5 sharing stories they have written with Class 1. 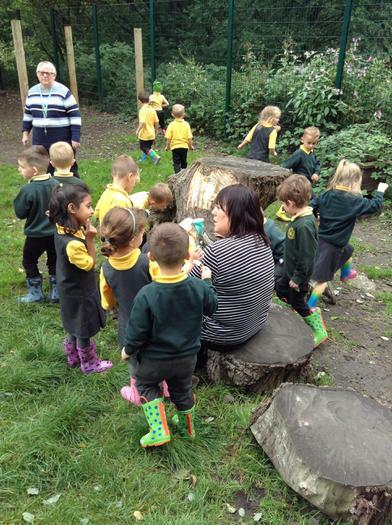 On our first Wednesday welly walk we went to the front of our school. 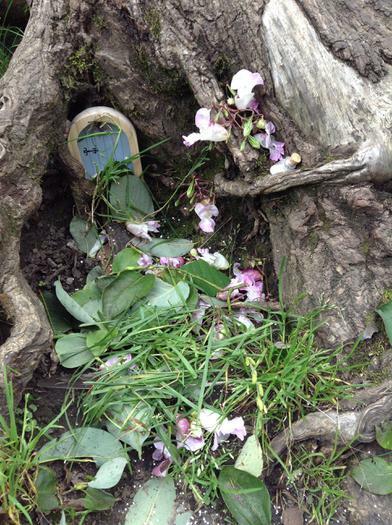 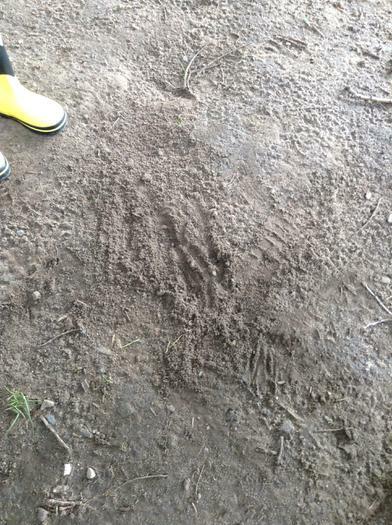 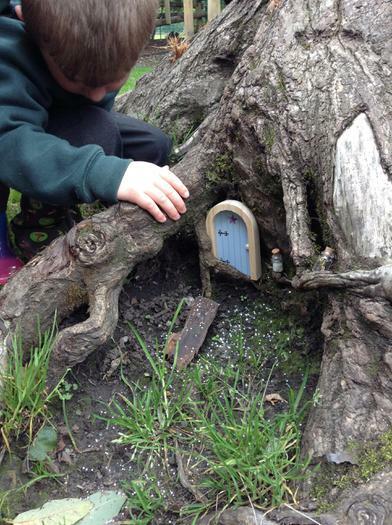 We had heard that there might be some fairies around so we made sure we were super quiet and sensible. 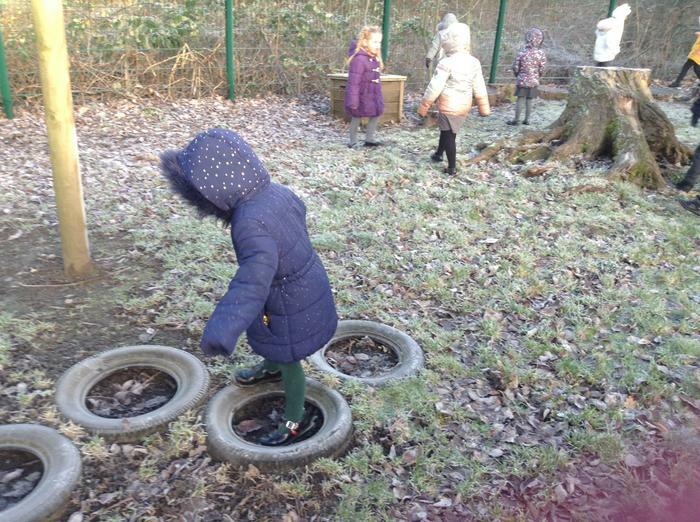 We didn't find any fairies on our first walk, but we did find lots of other interesting things. 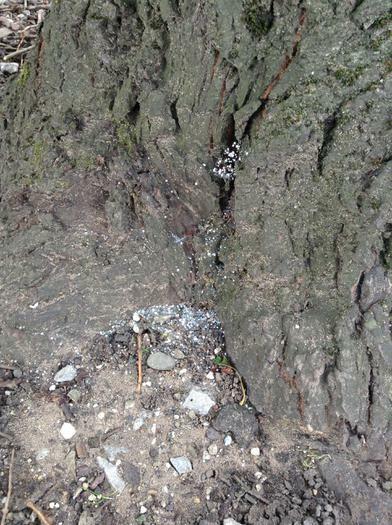 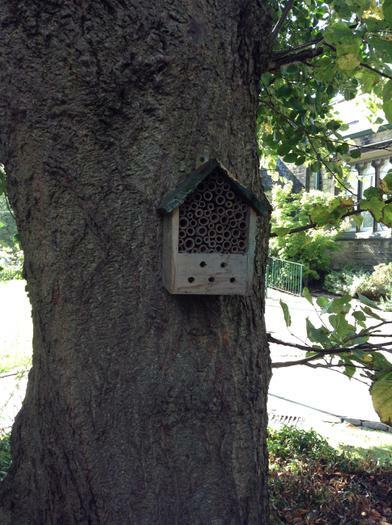 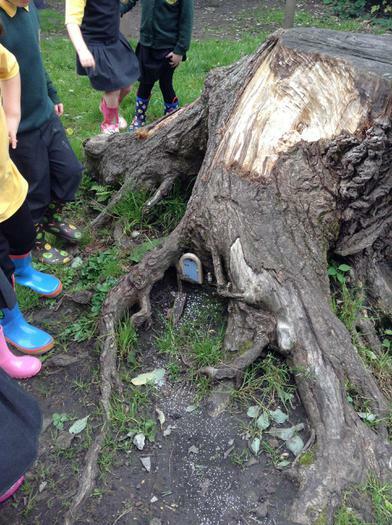 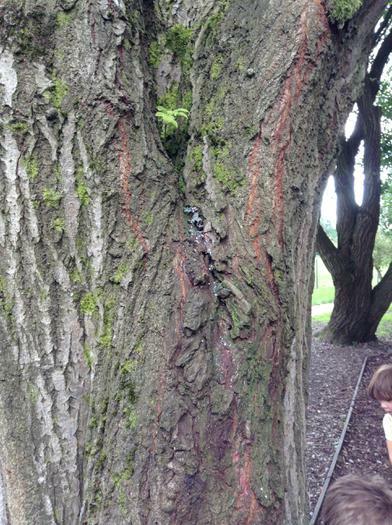 We noticed a little house attached to a tree "maybe the fairies live in there" suggested someone. 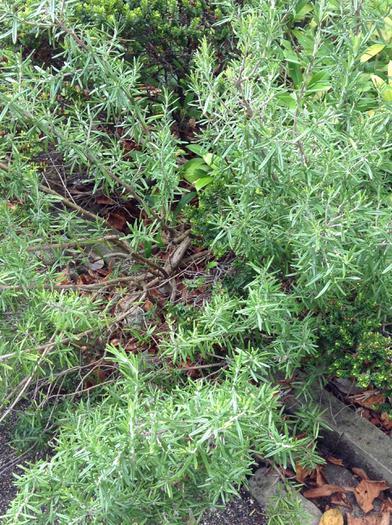 We then found a lovely smelling lavender bush "ooooh I bet the fairies like smelling this". 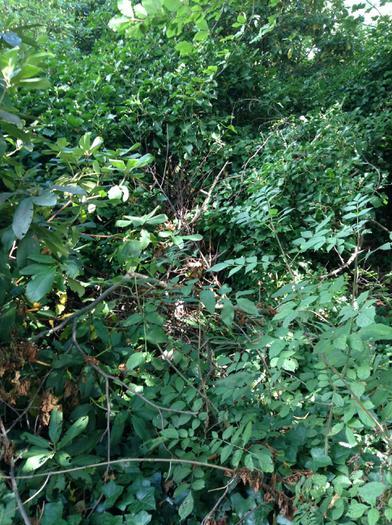 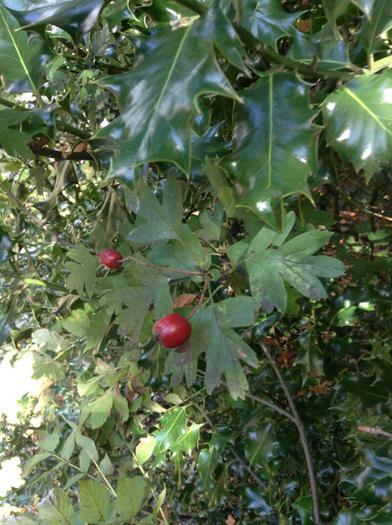 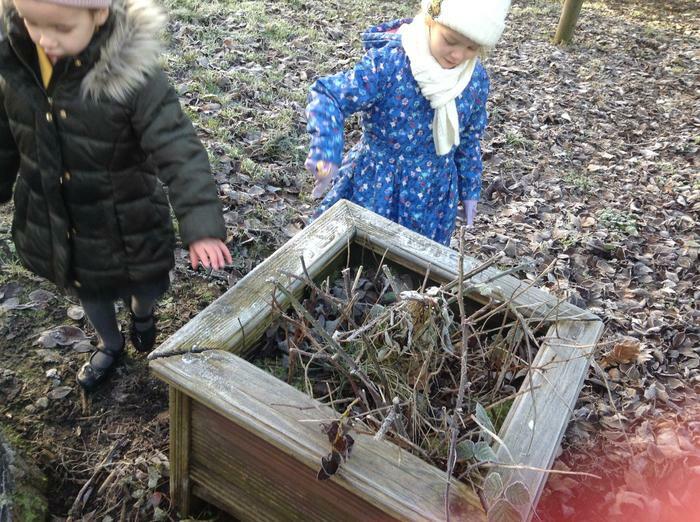 We found some berries which we thought the fairies might like to eat. 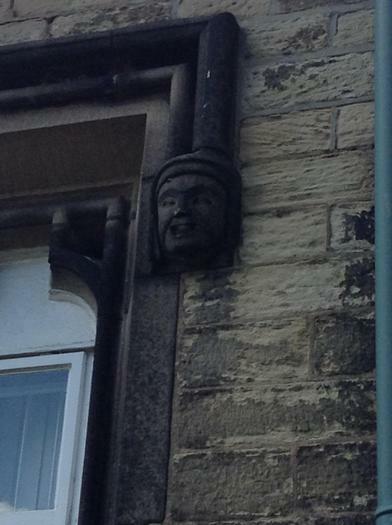 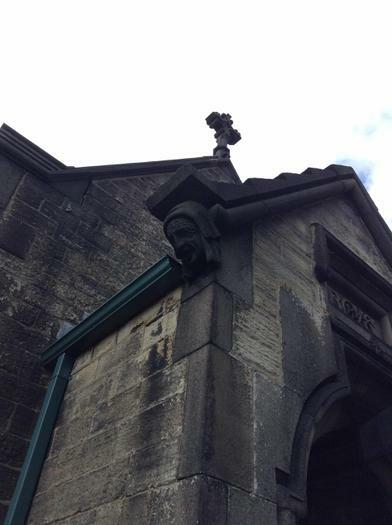 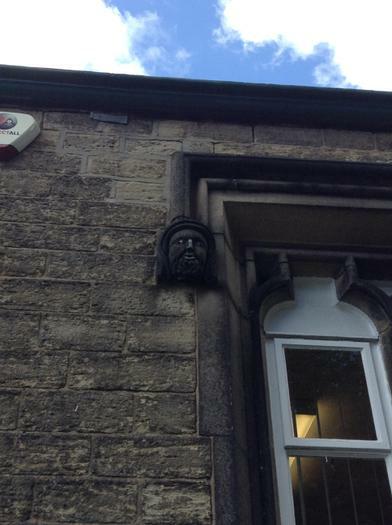 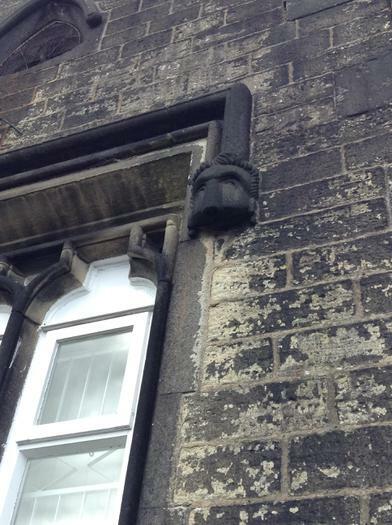 We also discovered some funny faces up on the roof of our school! 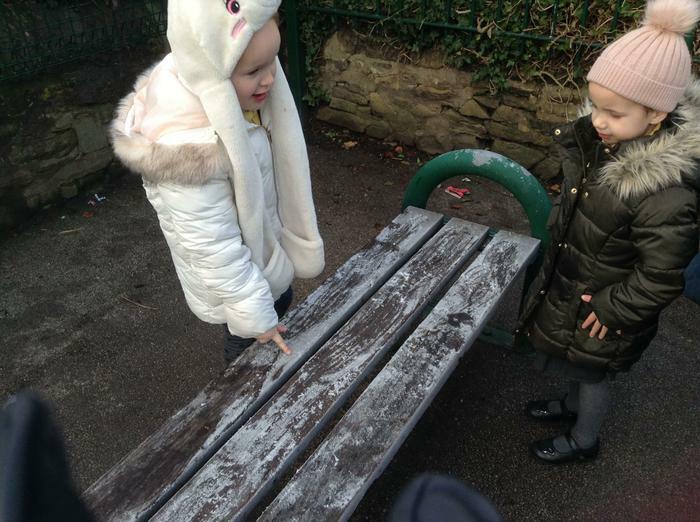 "I wonder why they are there?" 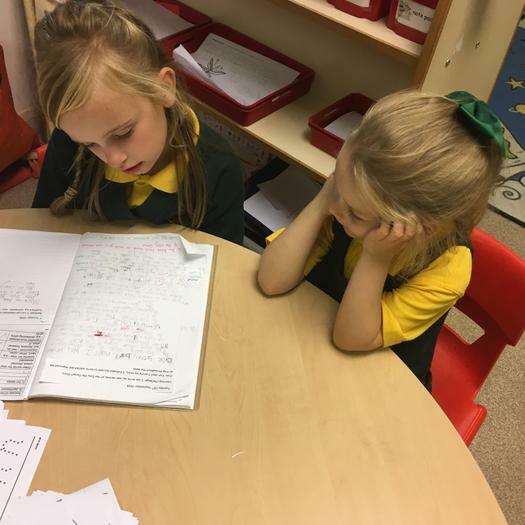 "who are they?" 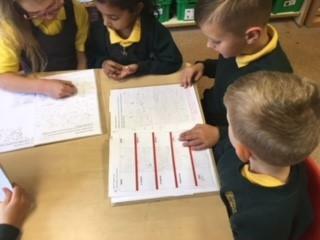 i can feel a research project coming on Class 1! 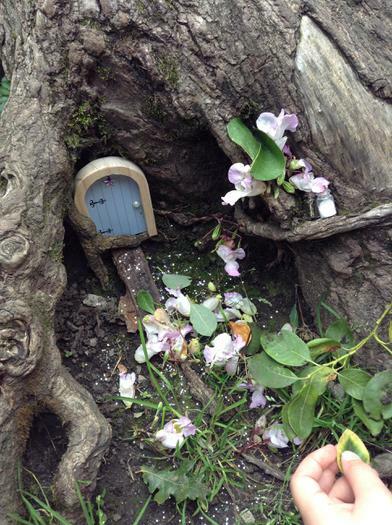 On our second fairy hunting walk we had a lovely surprise as we found a glittery pathway leading to a tiny little door. 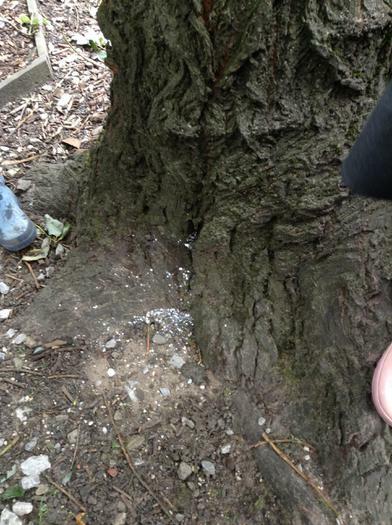 We found other glittery paths on trees, perhaps more fairies lived here too? 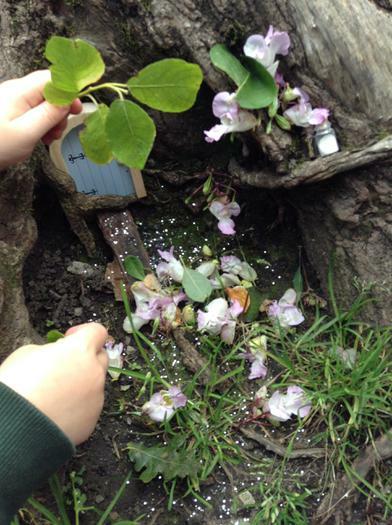 We decided to leave the fairies some gifts before we left, such as flowers and pretty leaves, someone even found a lovely feather. 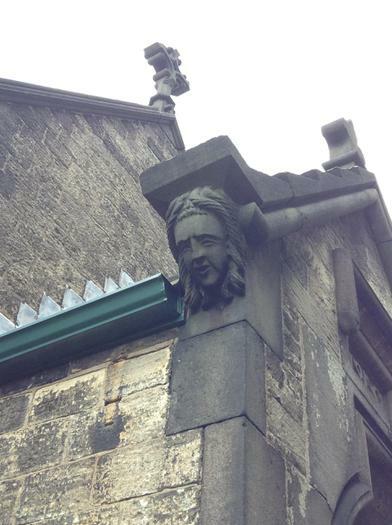 I hope we get to visit them again some time. 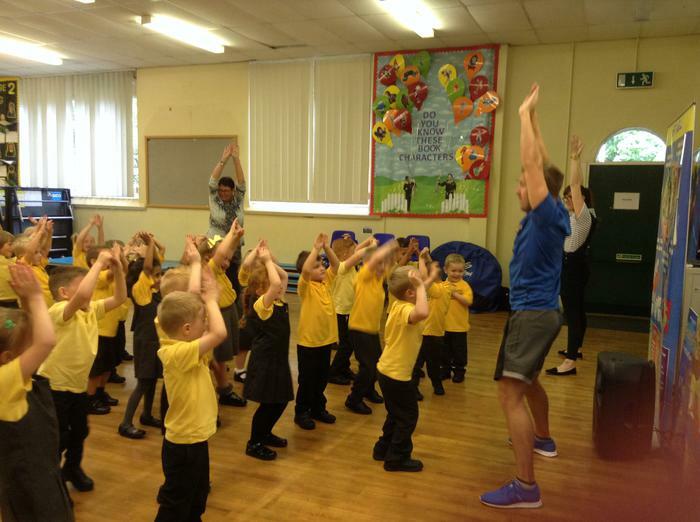 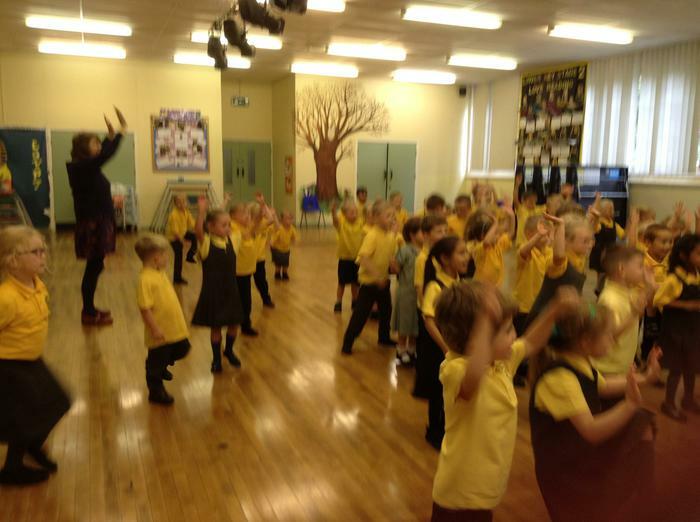 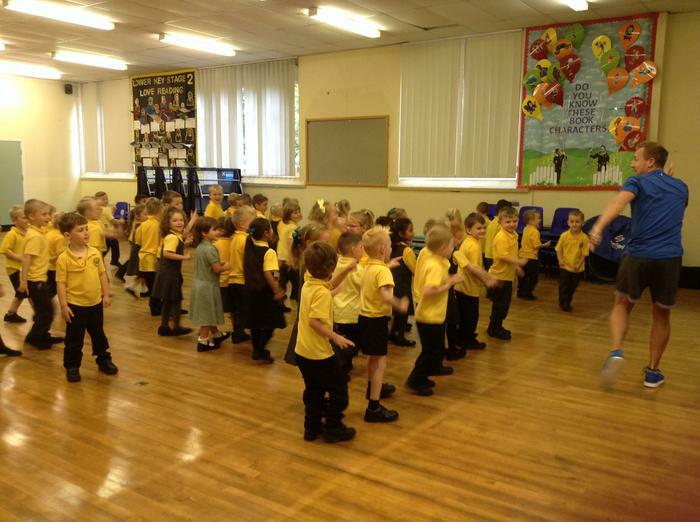 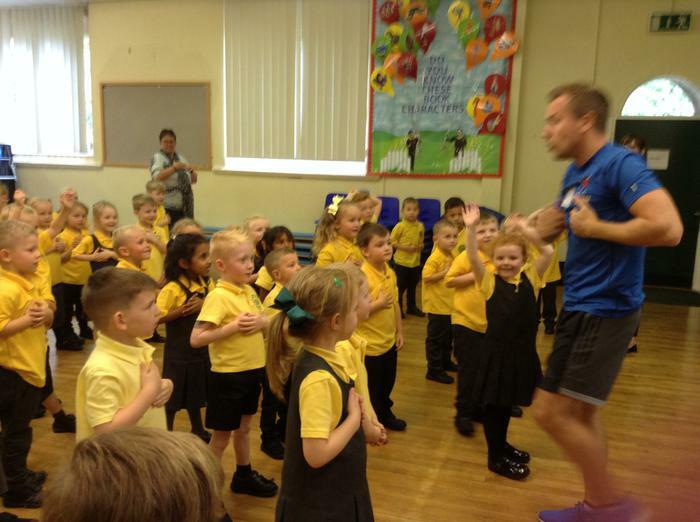 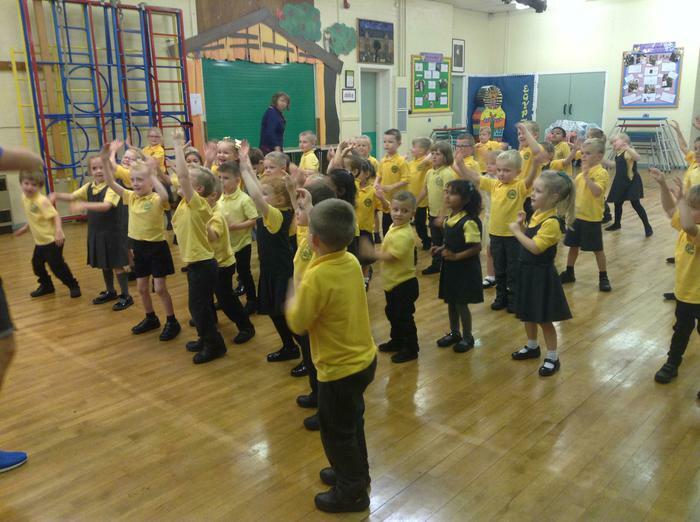 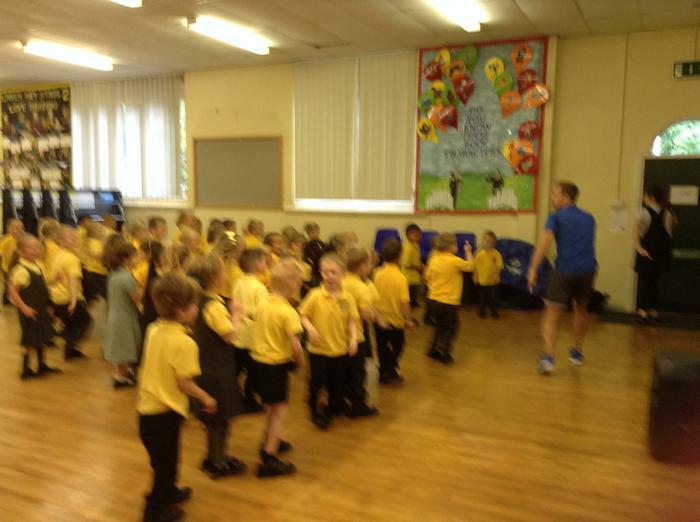 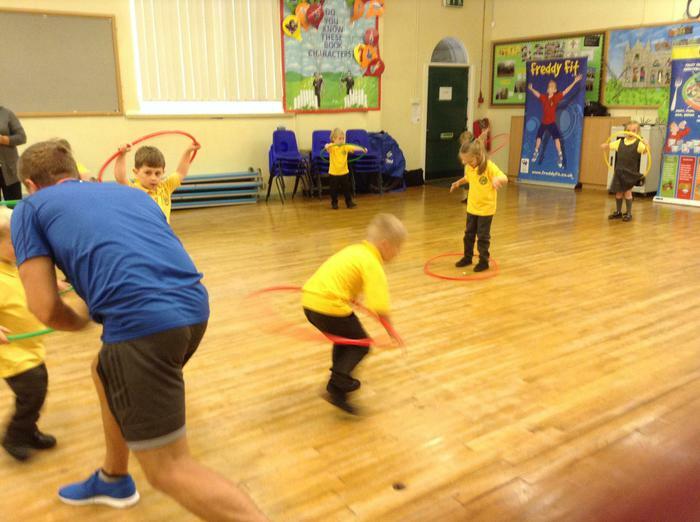 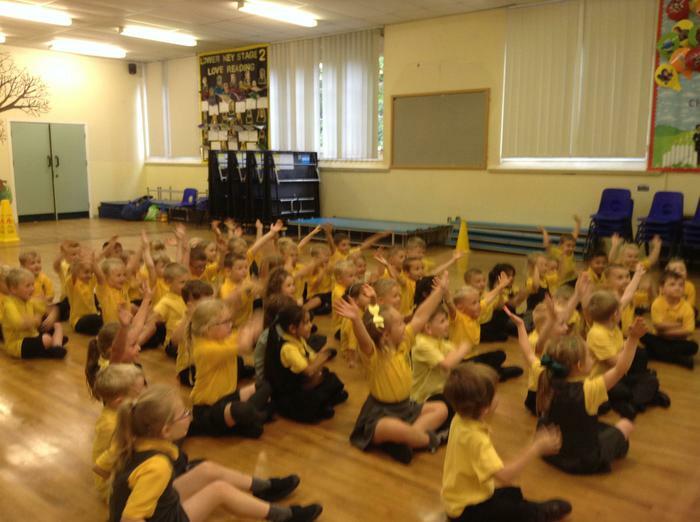 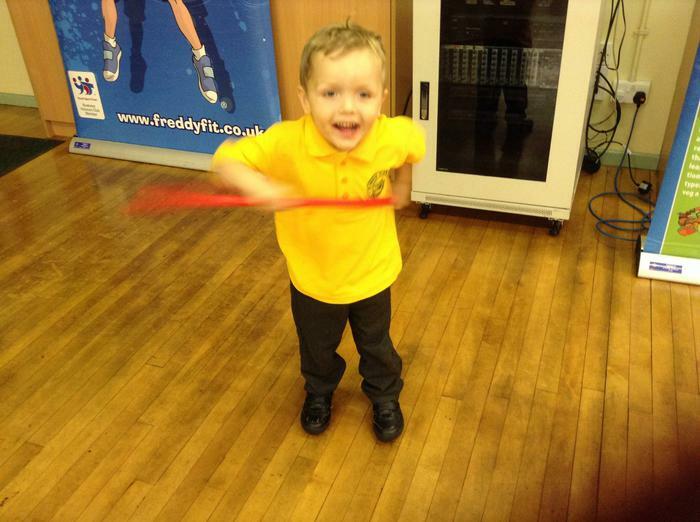 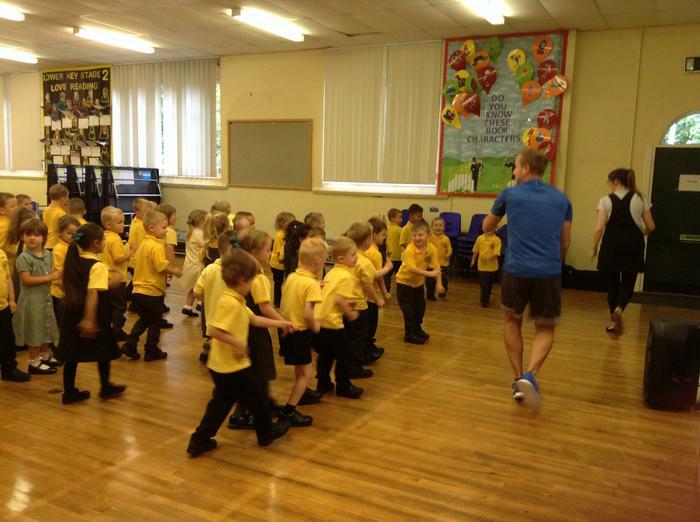 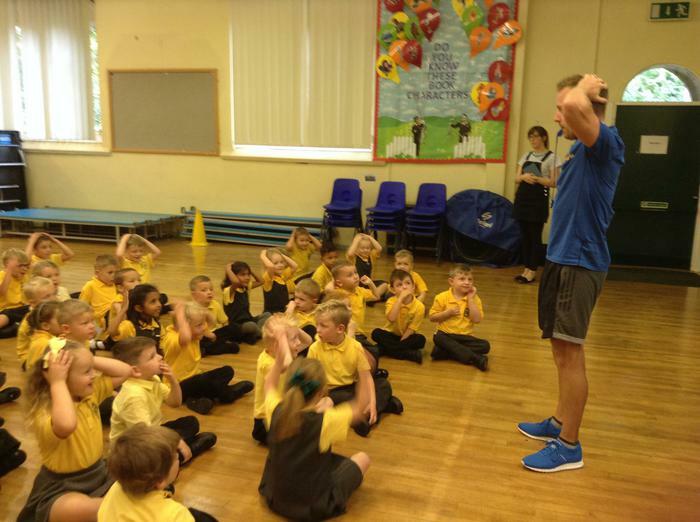 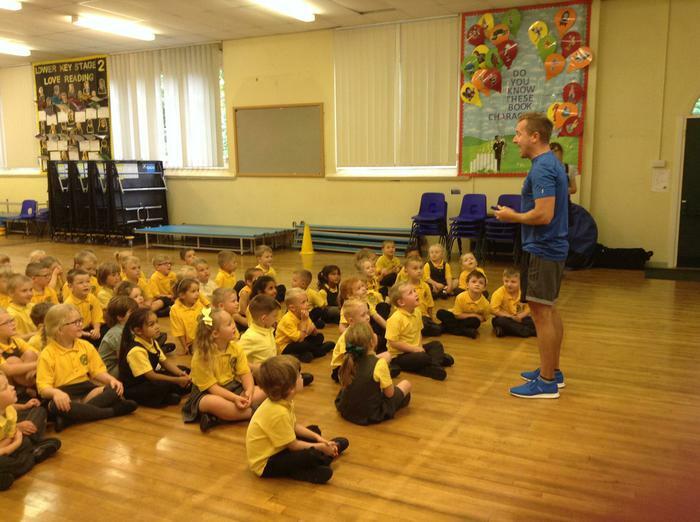 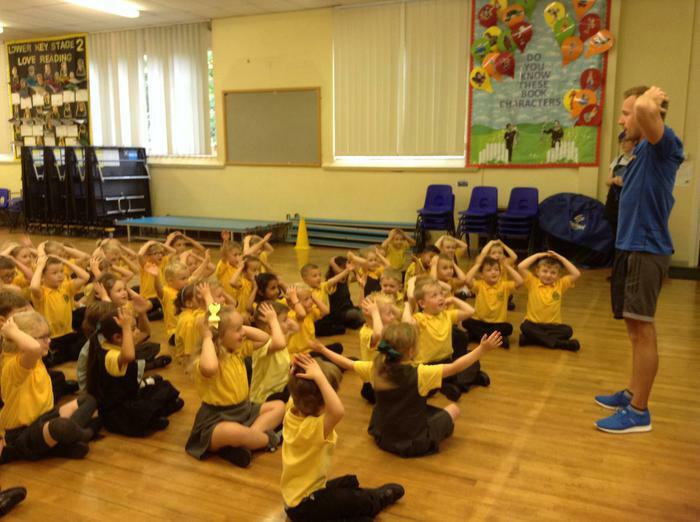 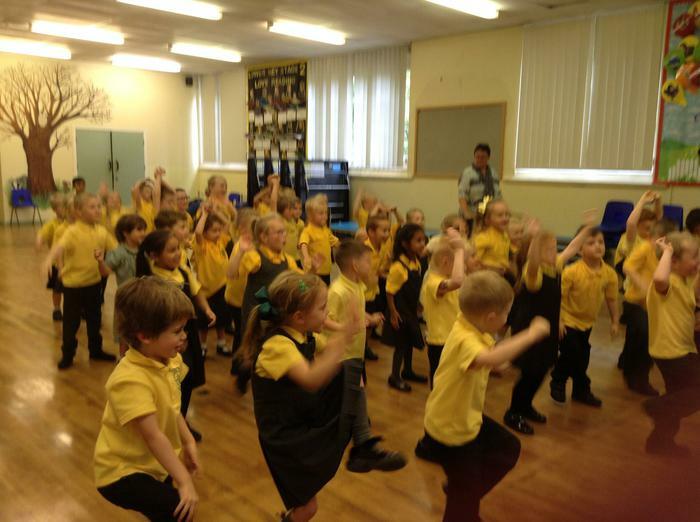 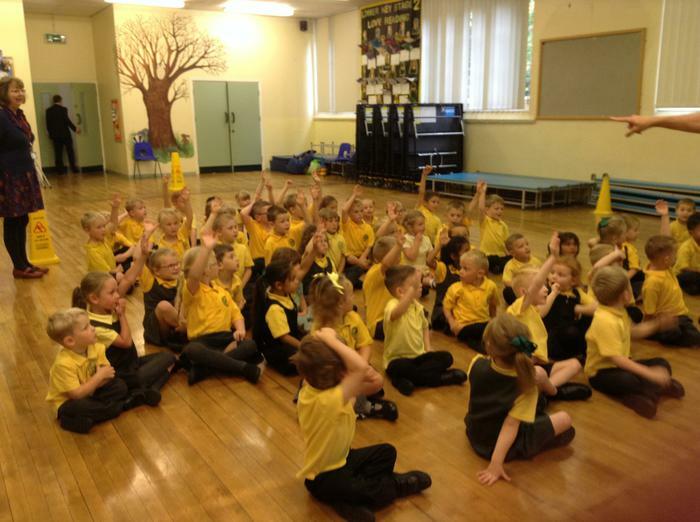 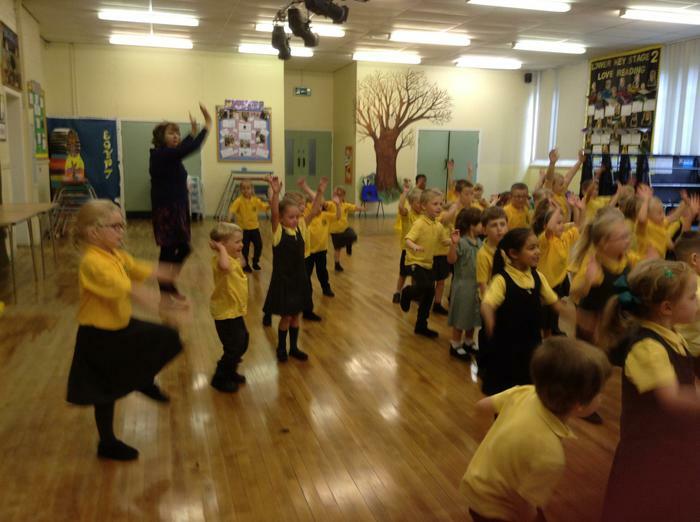 We had a brilliant time during our first session with Freddy Fit! 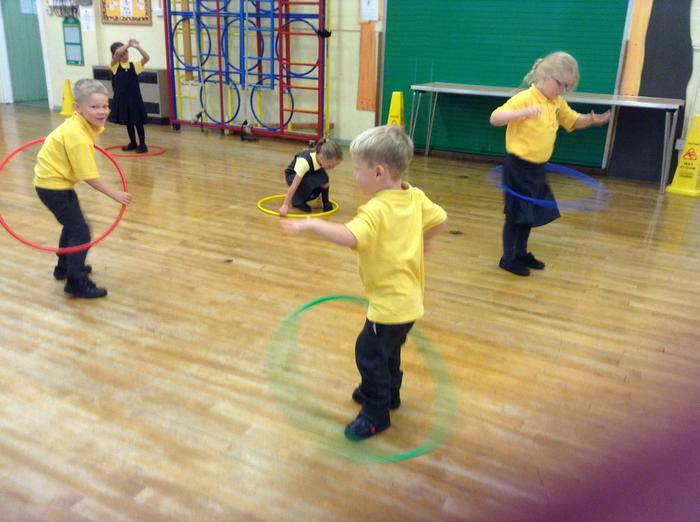 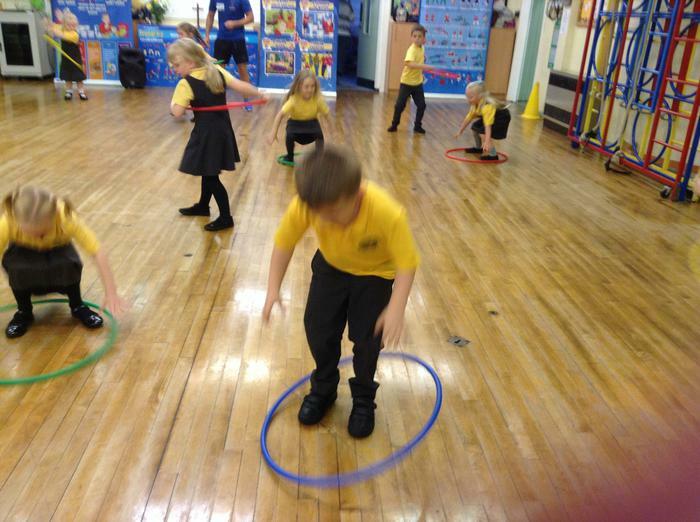 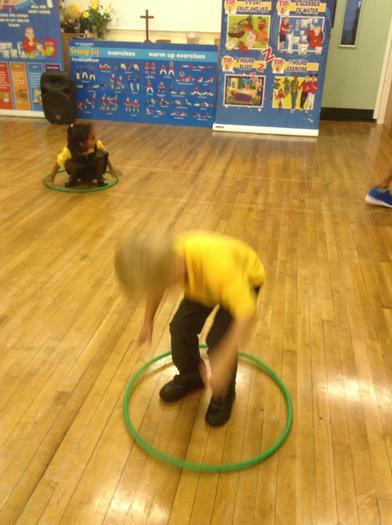 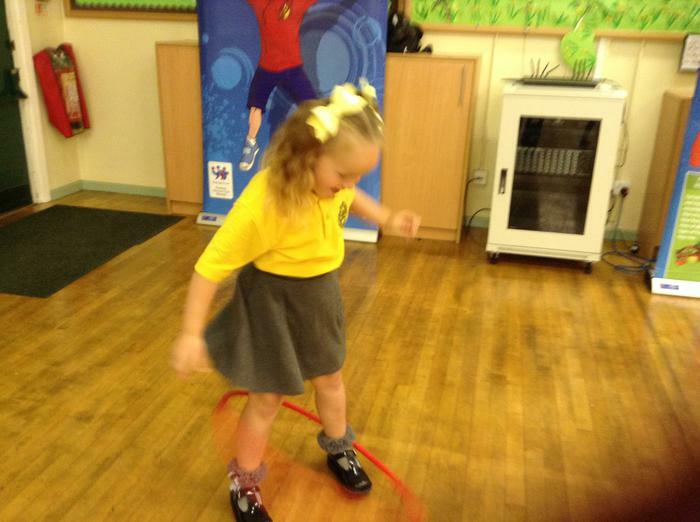 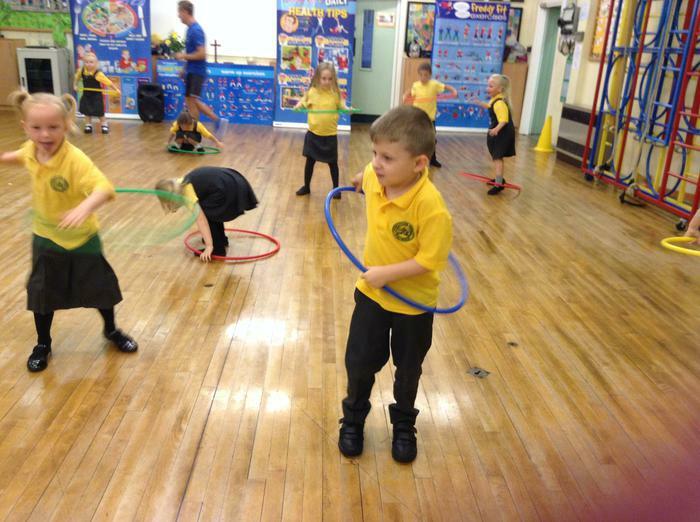 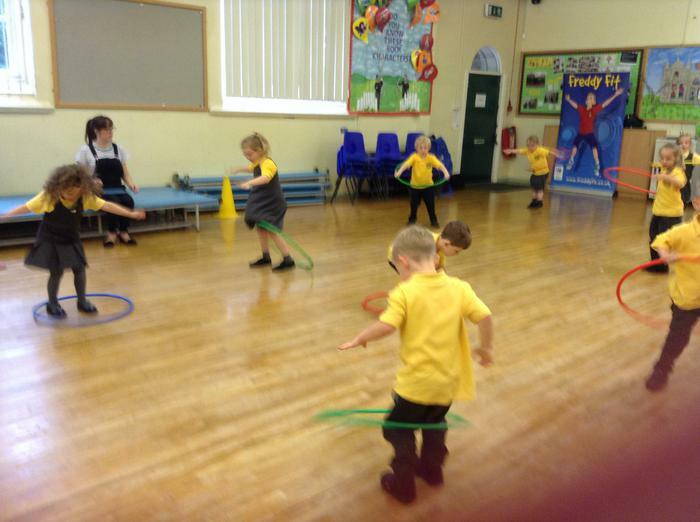 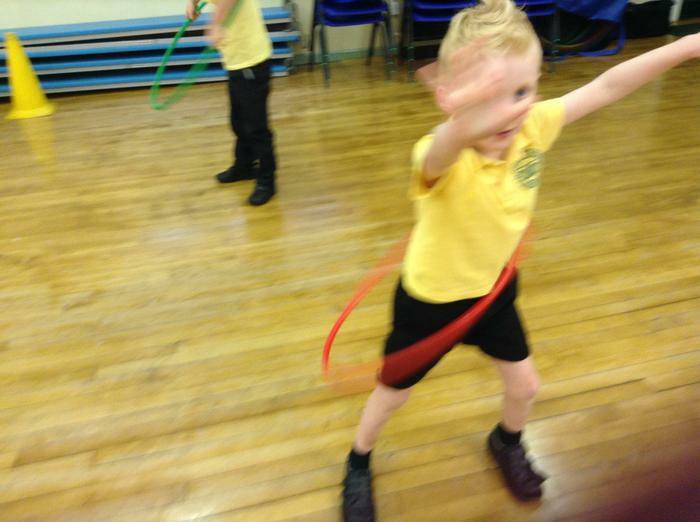 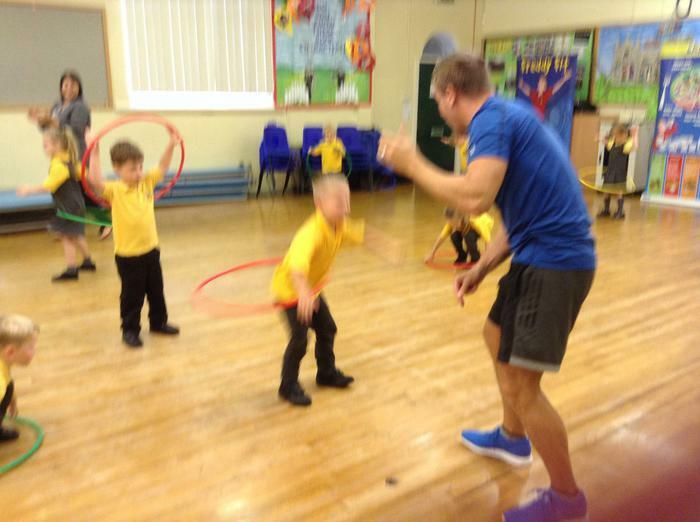 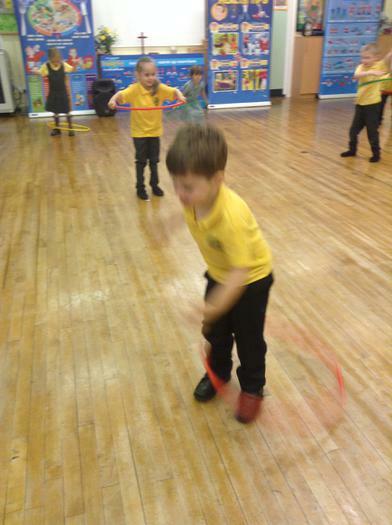 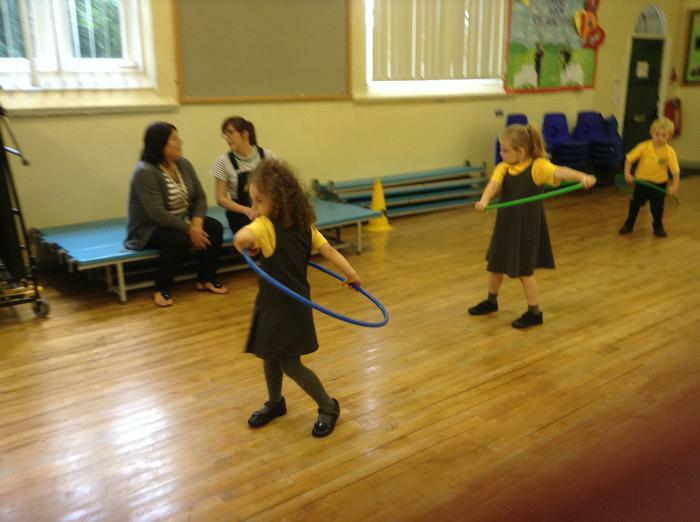 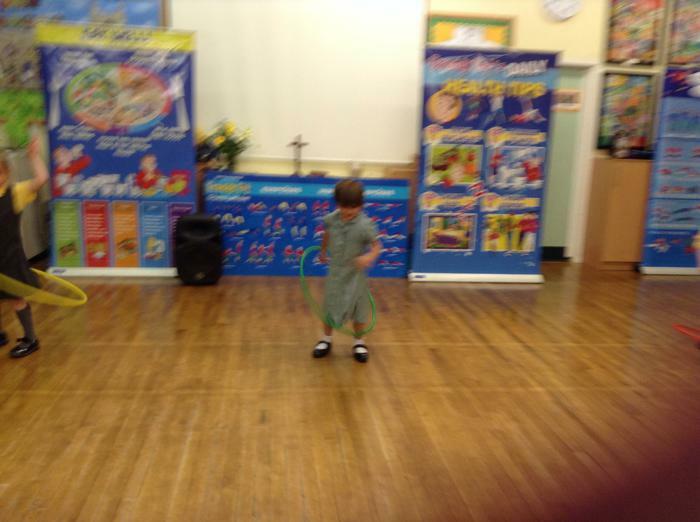 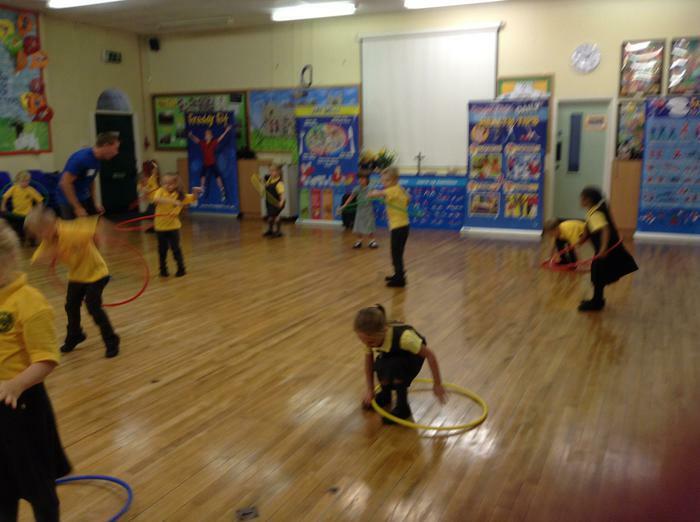 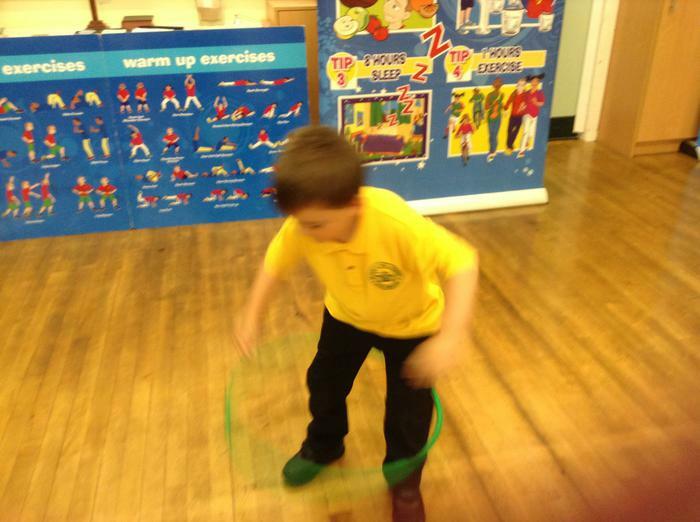 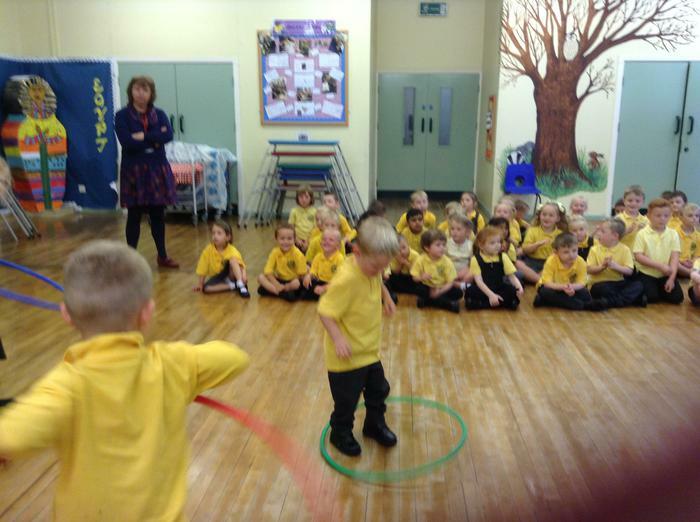 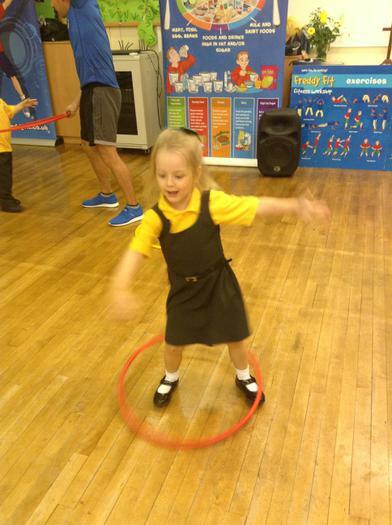 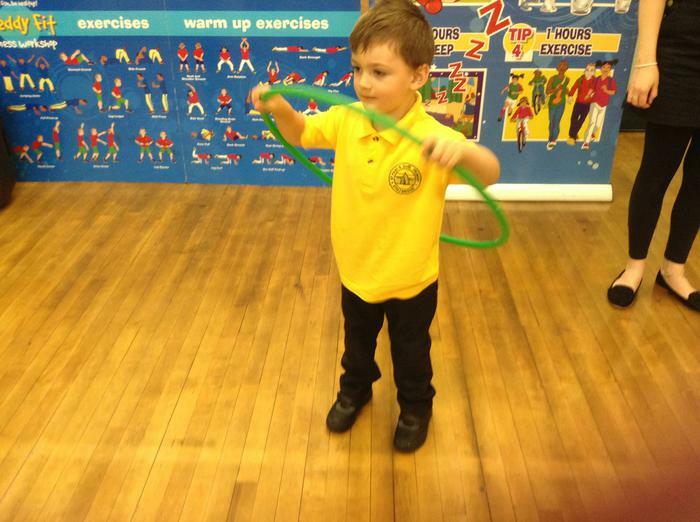 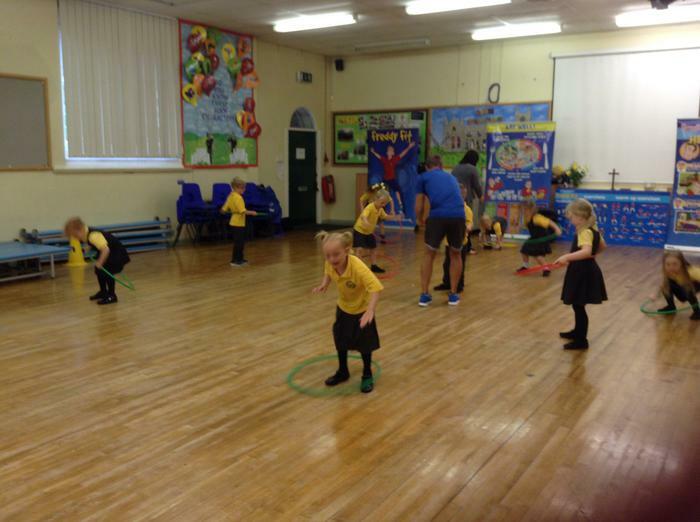 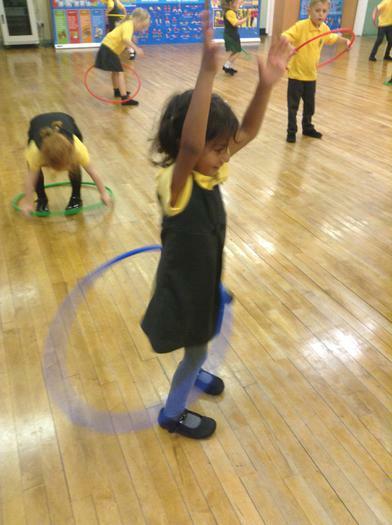 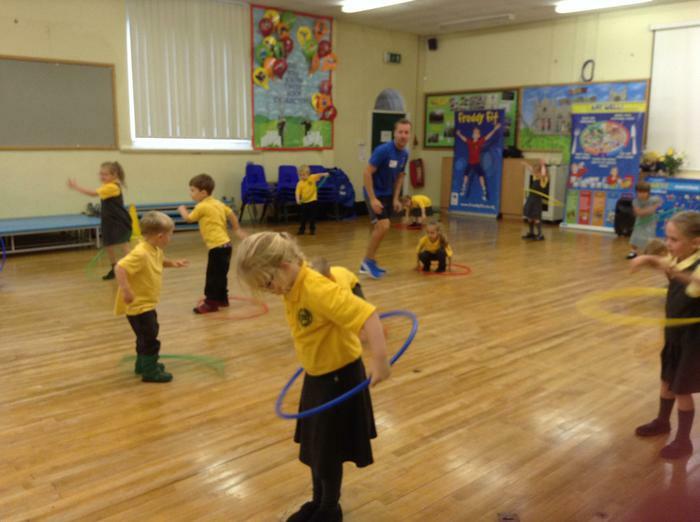 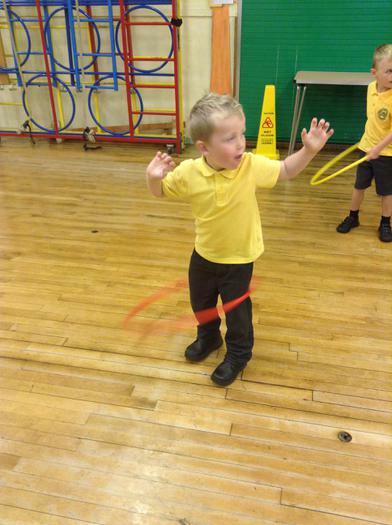 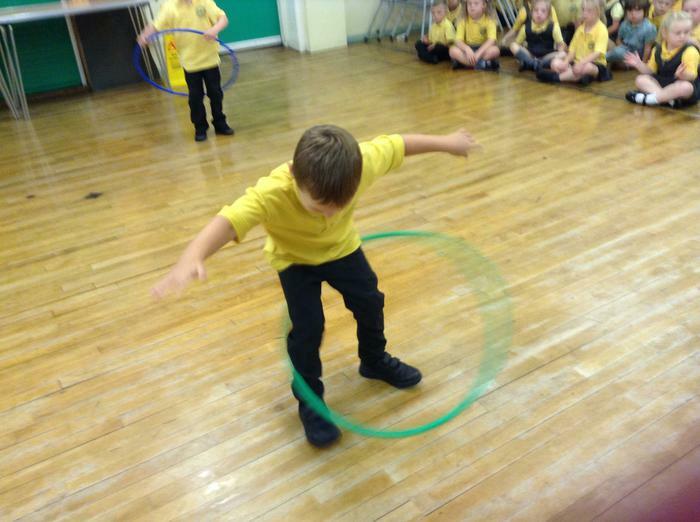 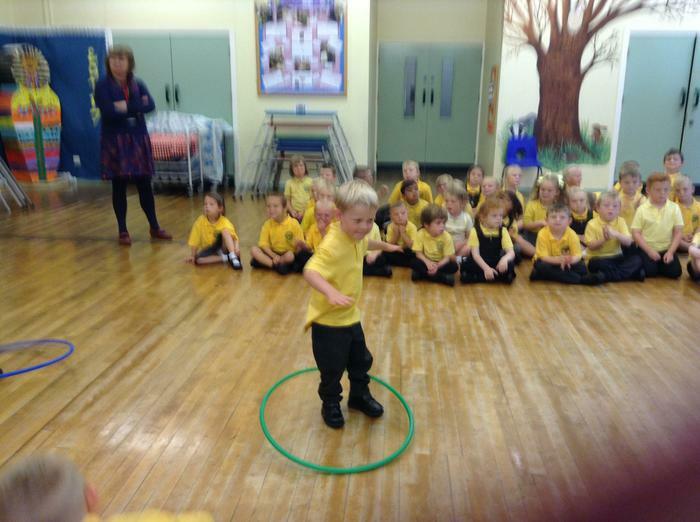 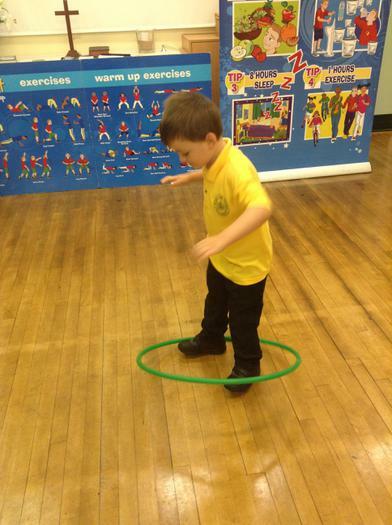 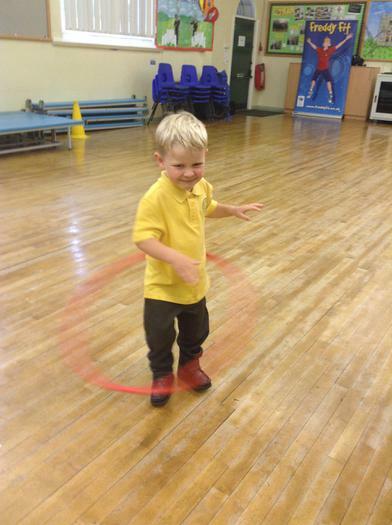 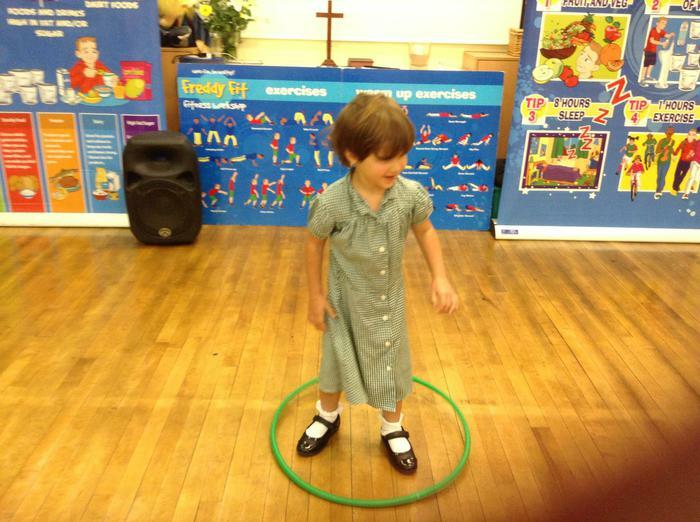 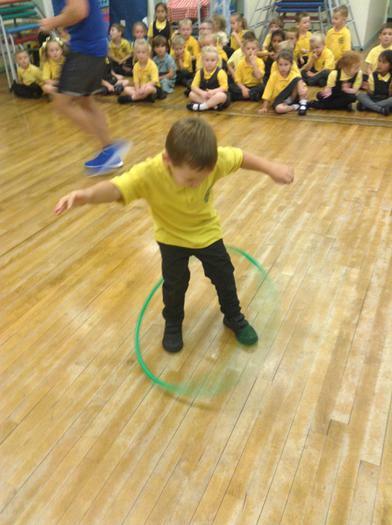 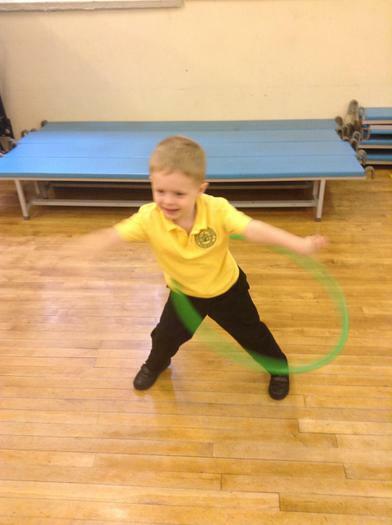 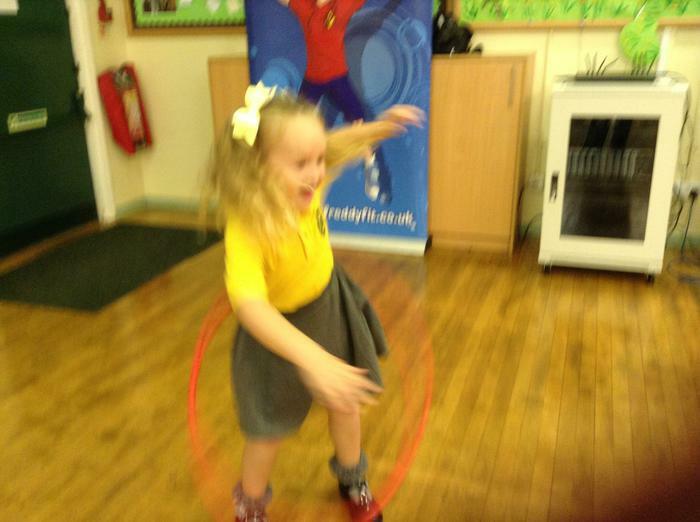 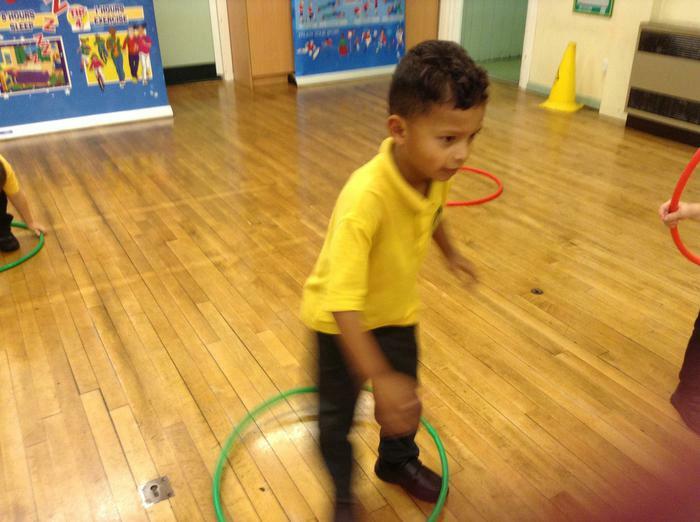 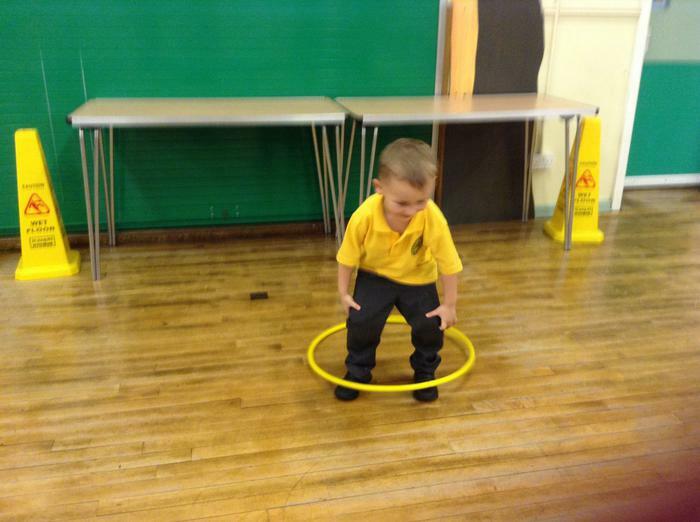 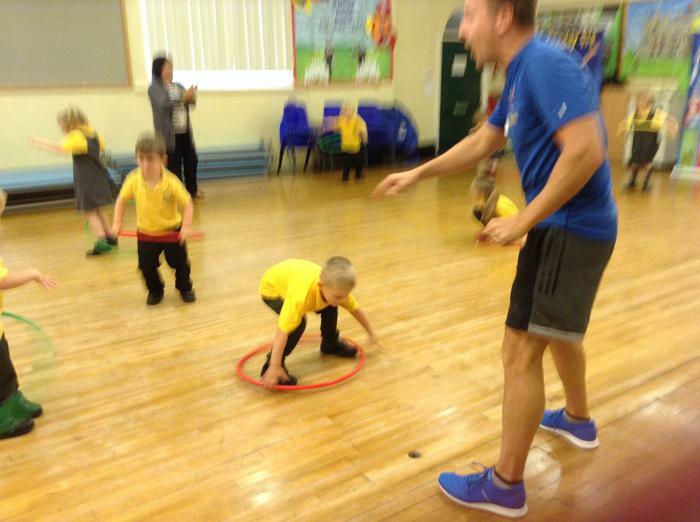 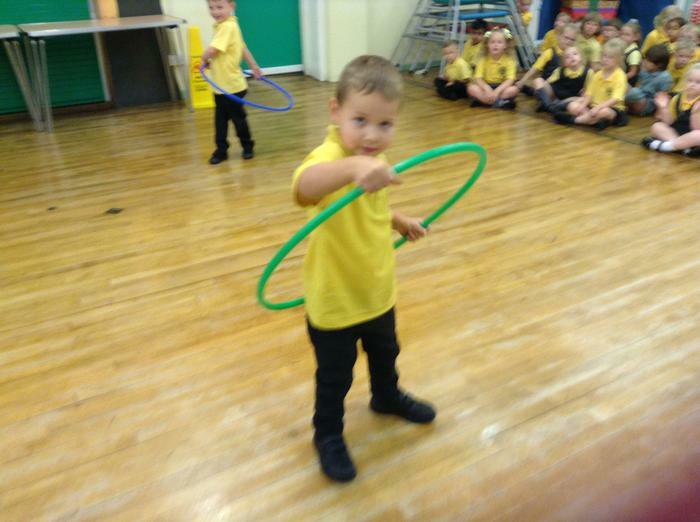 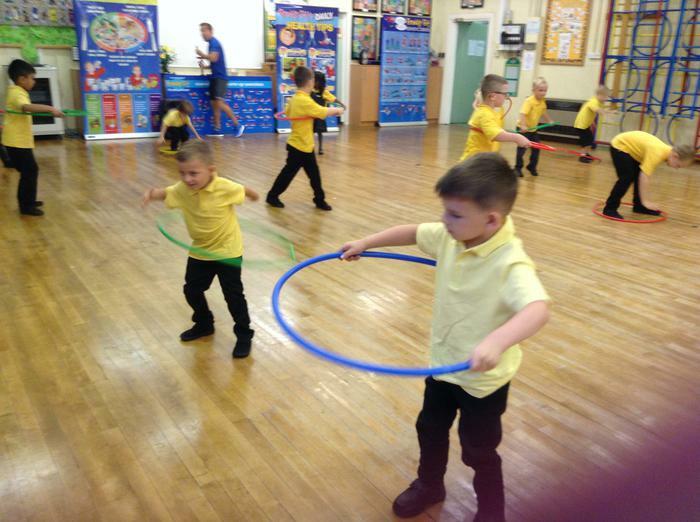 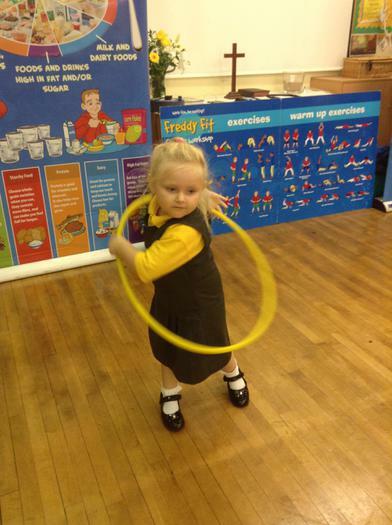 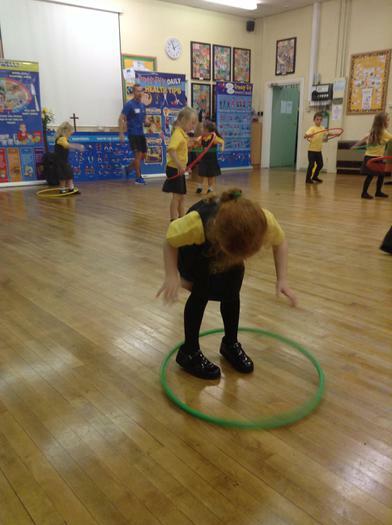 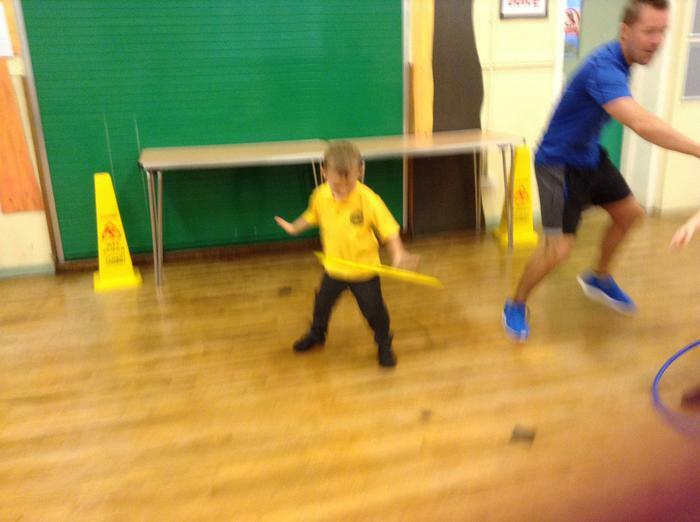 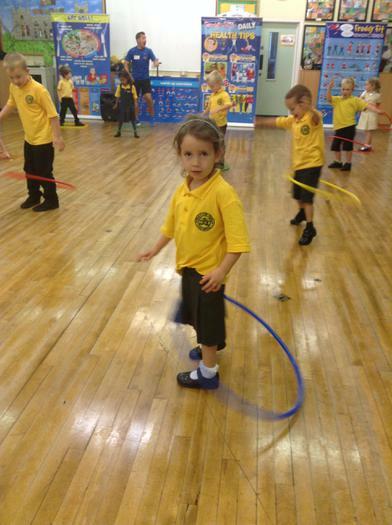 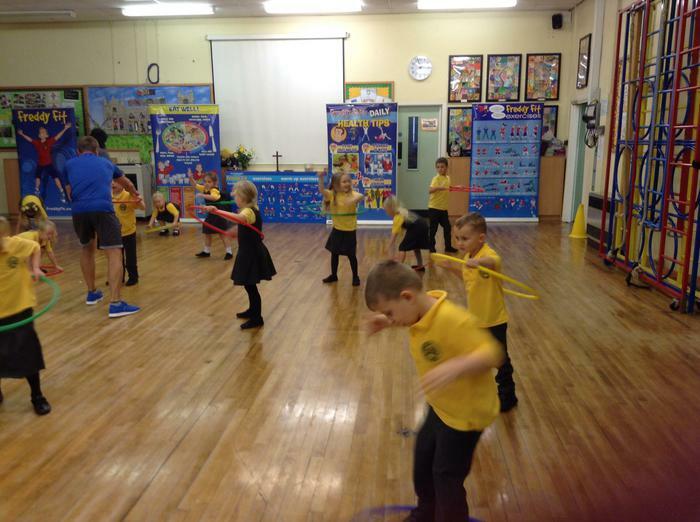 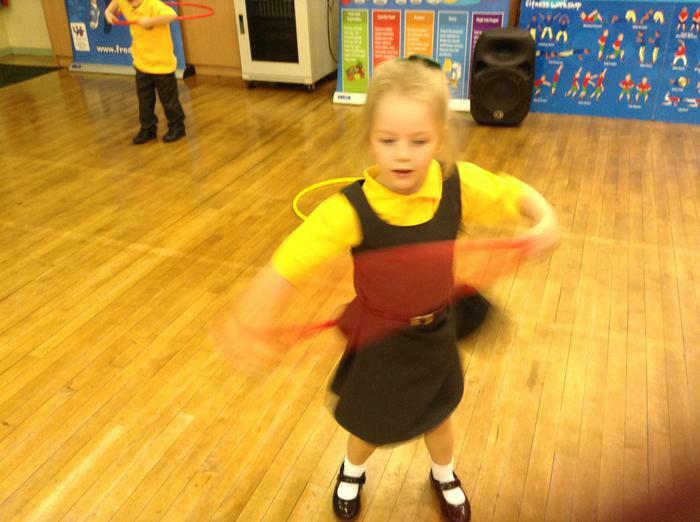 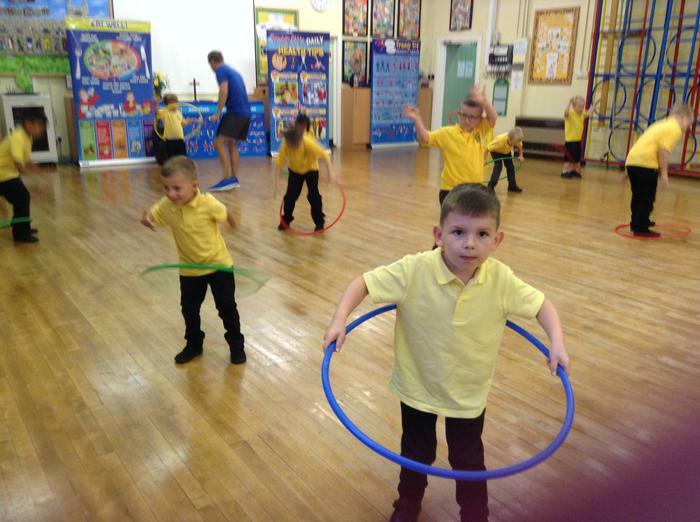 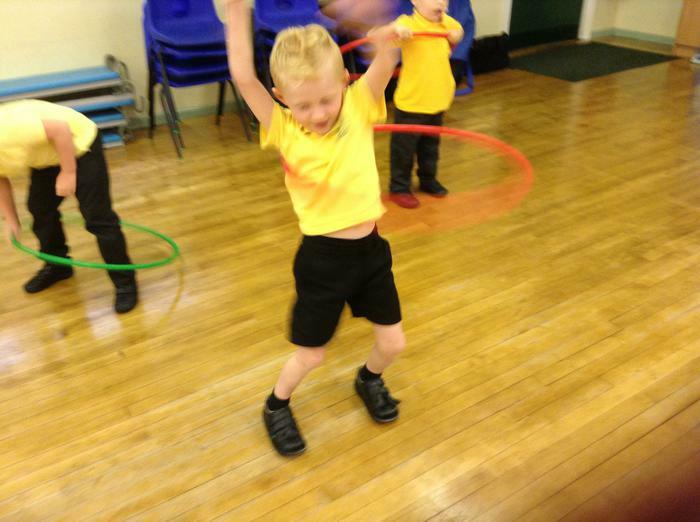 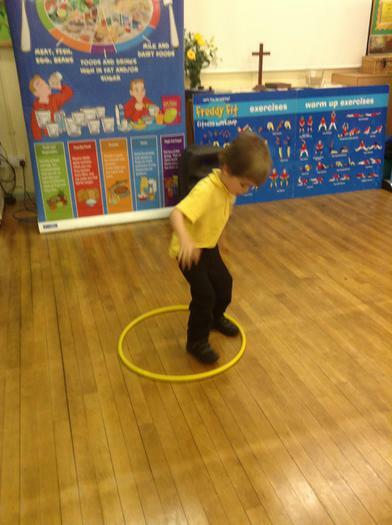 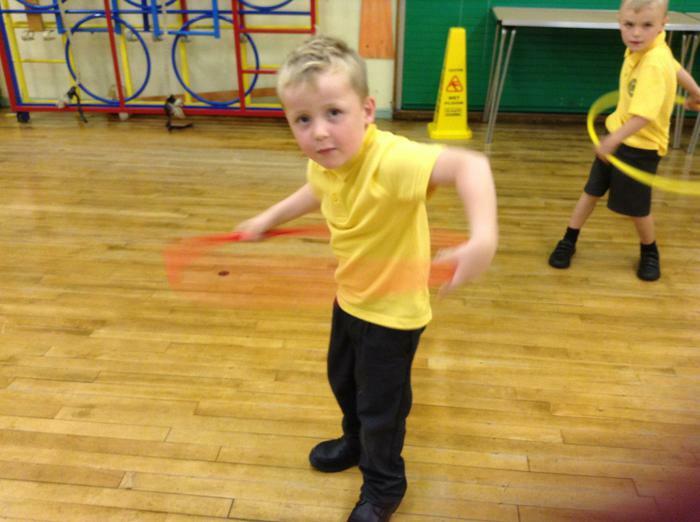 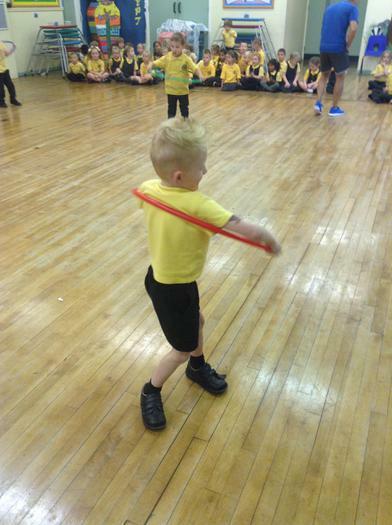 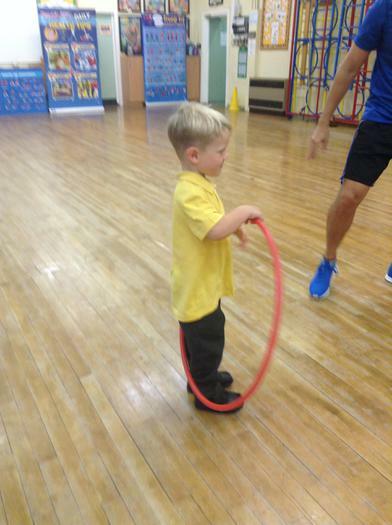 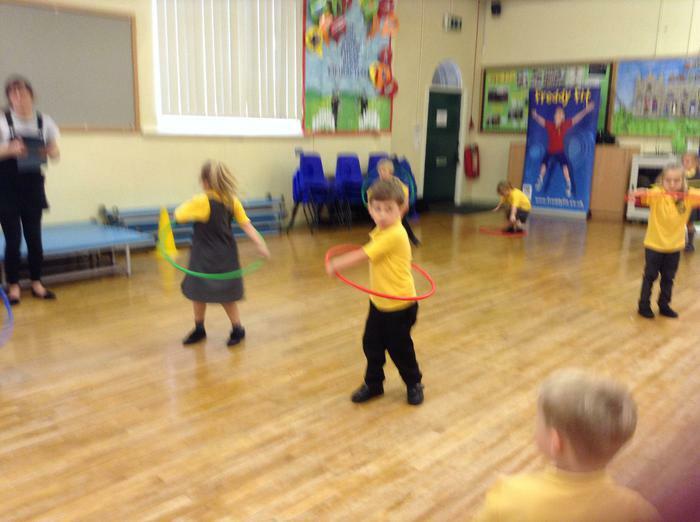 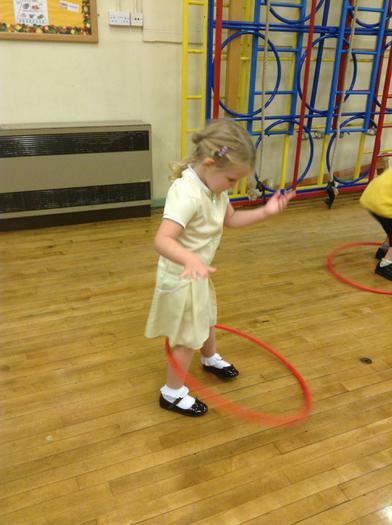 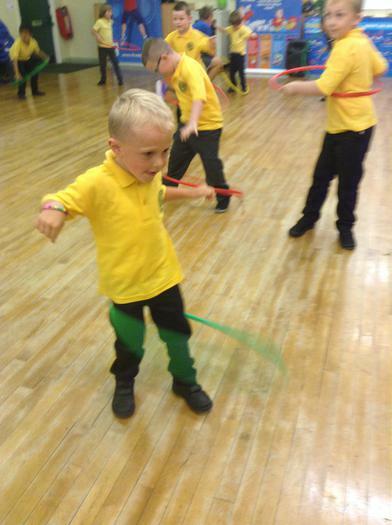 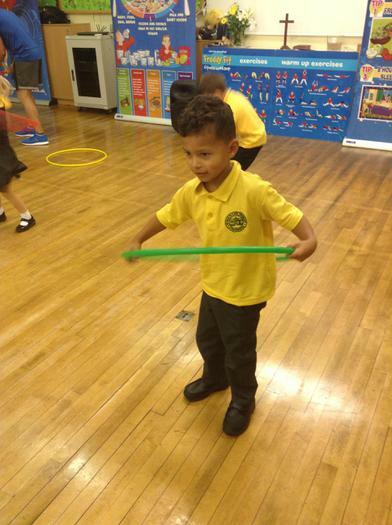 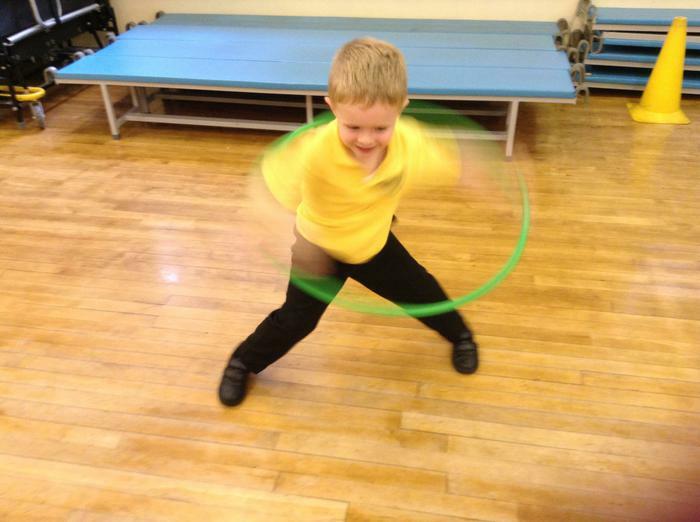 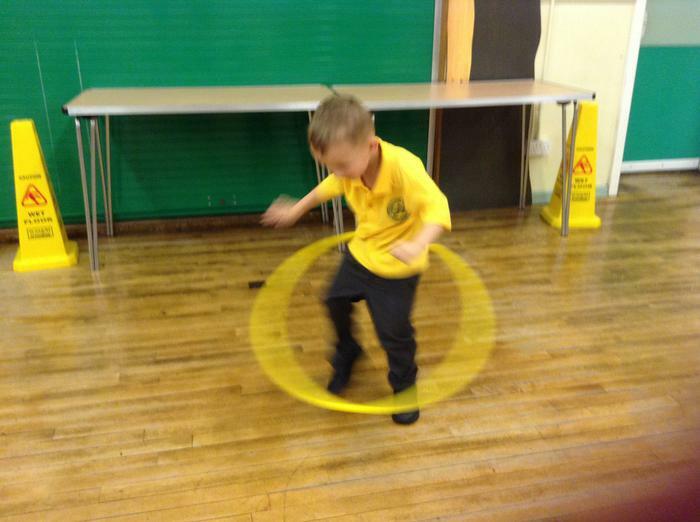 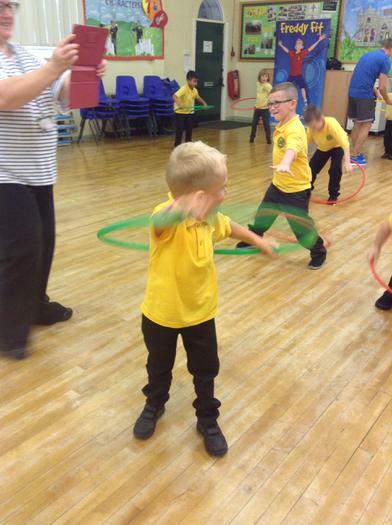 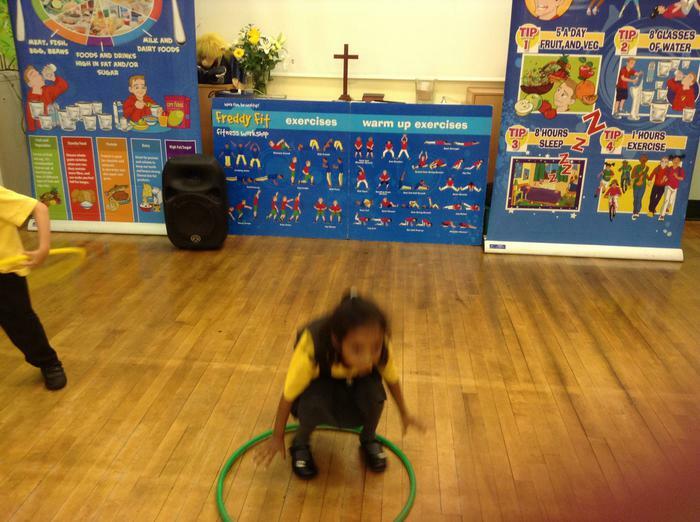 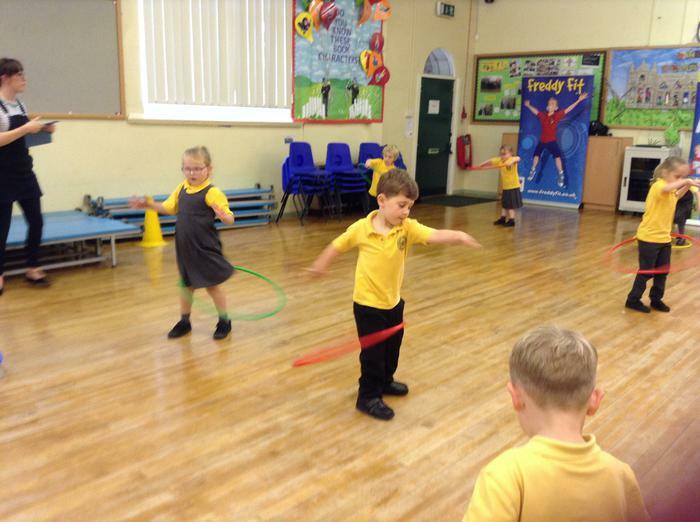 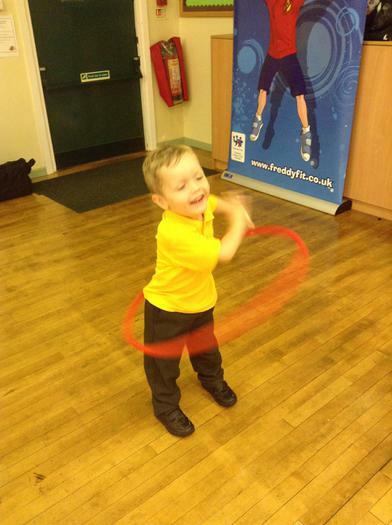 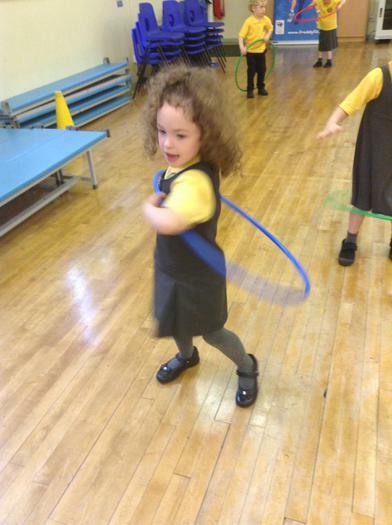 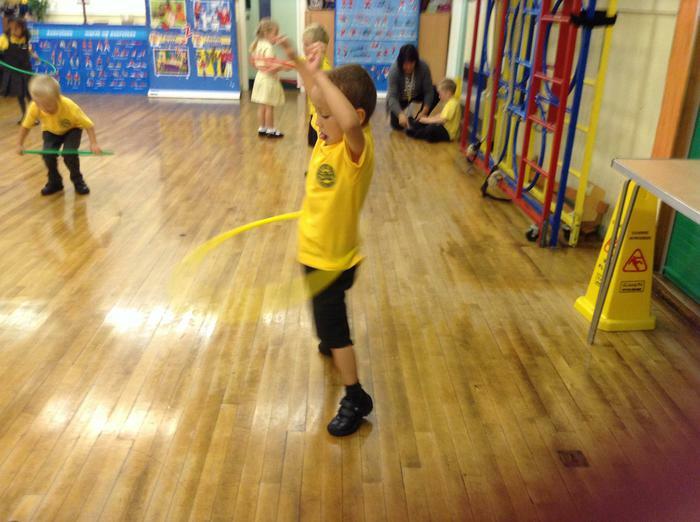 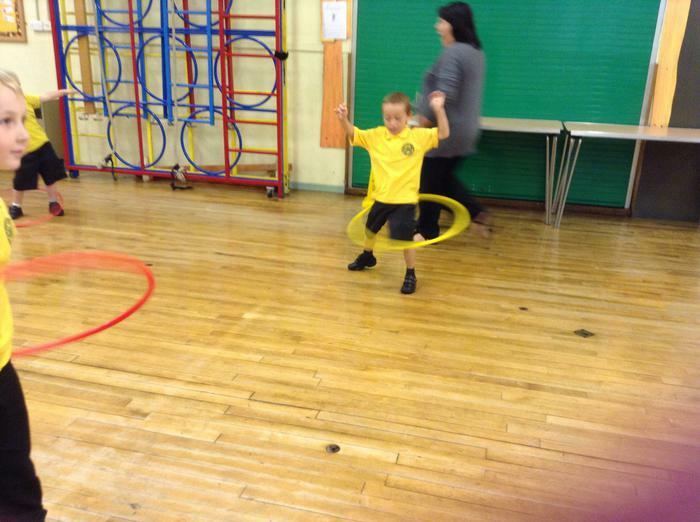 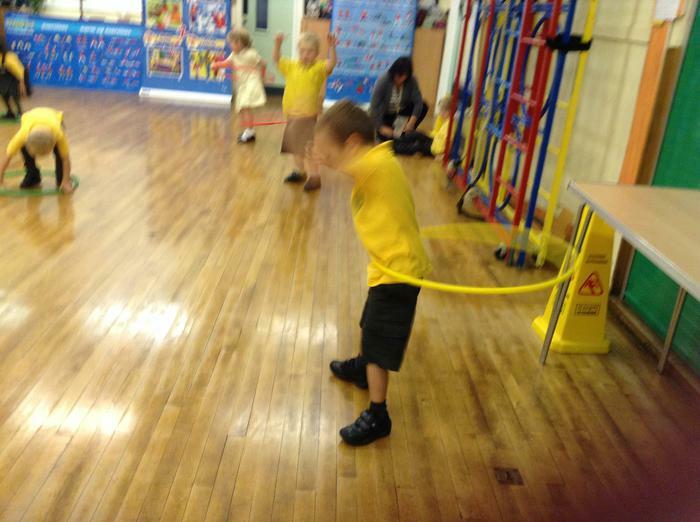 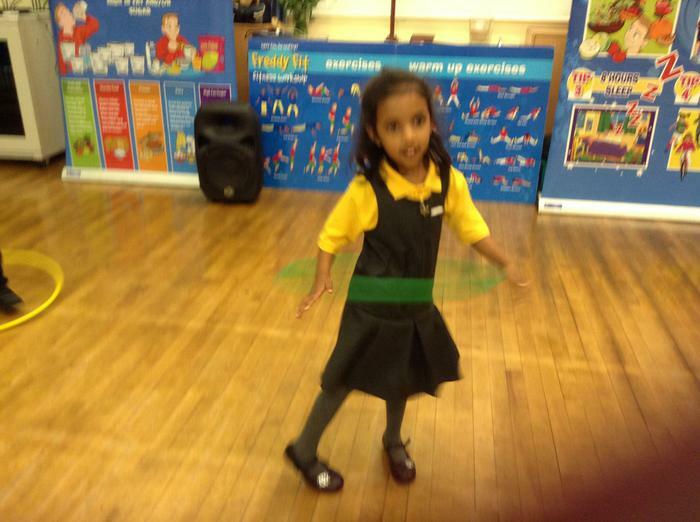 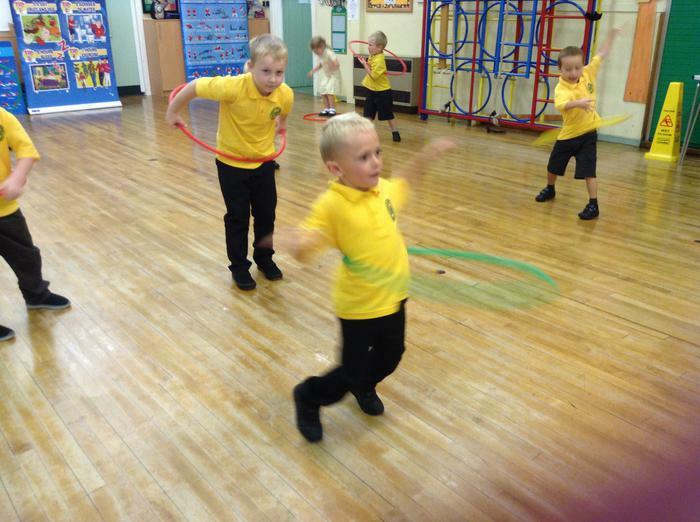 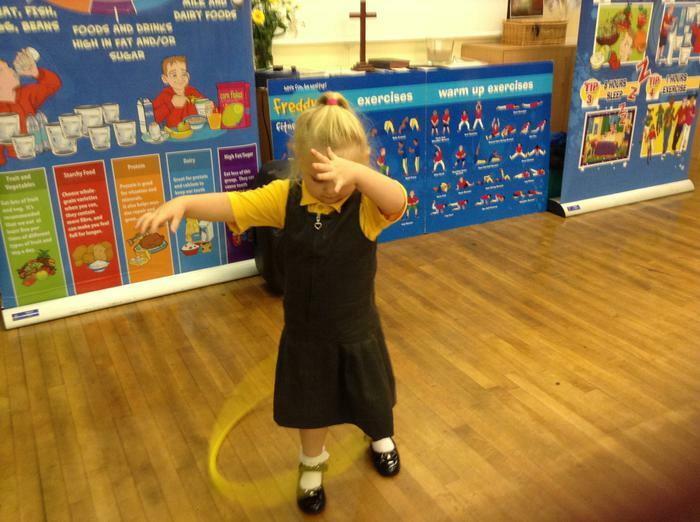 We learnt to hula hoop!